BZA’s pylon flip-flop – a change from 221″ wide to 220″ wide! 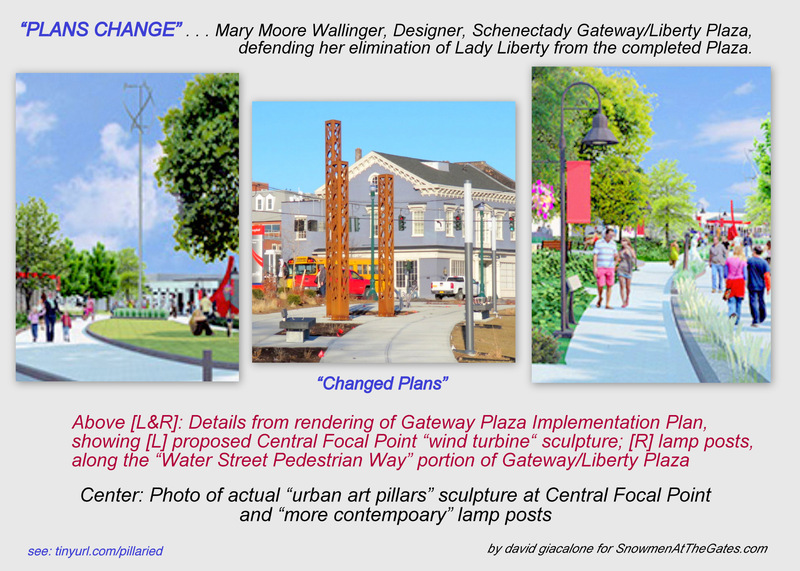 This evening (Thursday, Nov. 16), with virtually no discussion among themselves, the Schenectady Board of Zoning Appeals granted Mohawk Harbor’s request for a large, strip-mall style pylon sign, 30’ high, 220″ wide, with a 6′ x 12′ LCD screen and 22 lighted tenant signs. 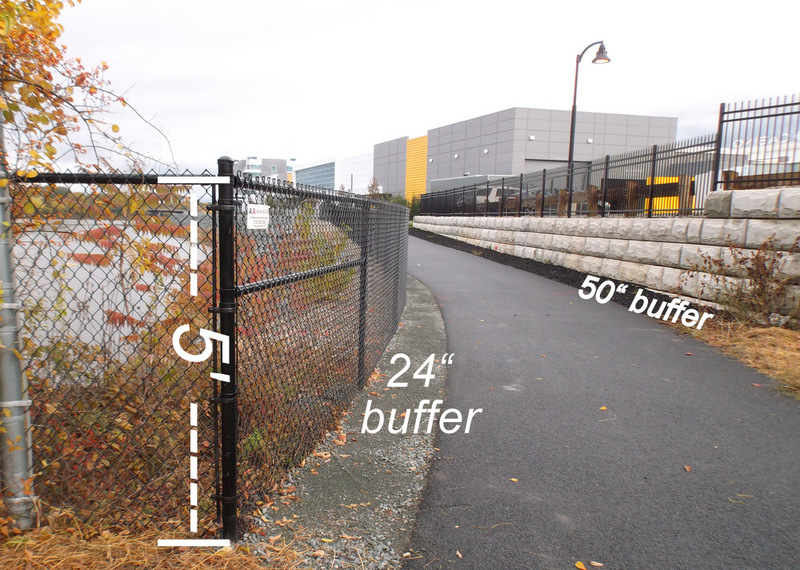 Brendan Keller, the Board member who had moved its rejection on October 4, moved its acceptance this time, noting that bigger [than the 22′ pylon approved on the sly on November 1] was better and that it was “not a significant” variance. 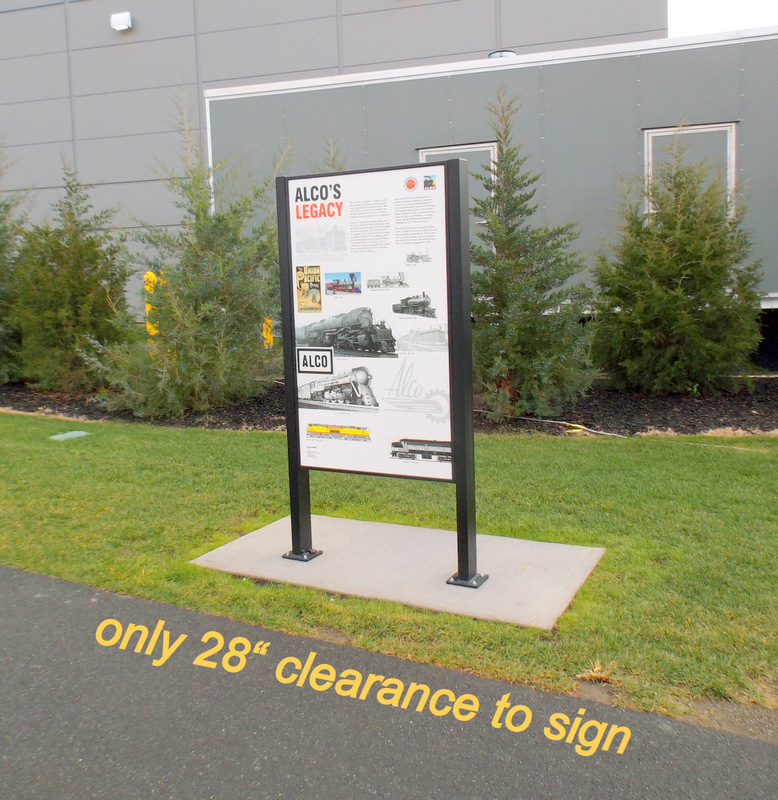 The Code of Signage Regulations calls for a limit of 7′ H on a freestanding sign, with an area of 25 sq. 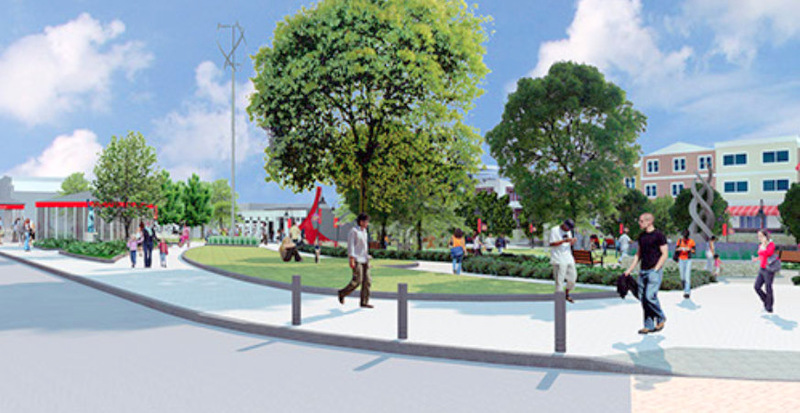 ft. if the parcel is not a shopping mall, and 75 sq. ft. for a shopping mall. 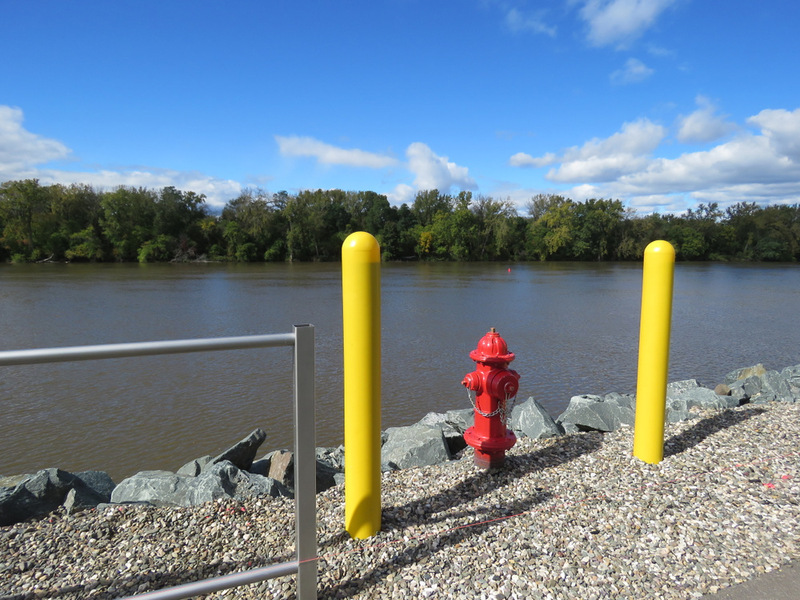 Neither the setback nor the dimmability issue were mentioned by the Board on October 6, when the original 30′ pylon was rejected. 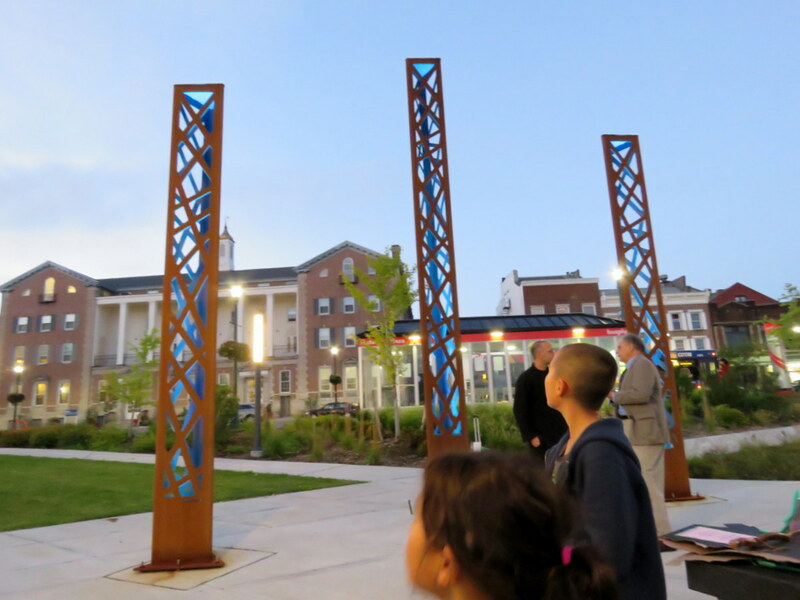 The focus on October 6 was the size of the pylon structure and the brightness and glare of the screen and lighted signs. 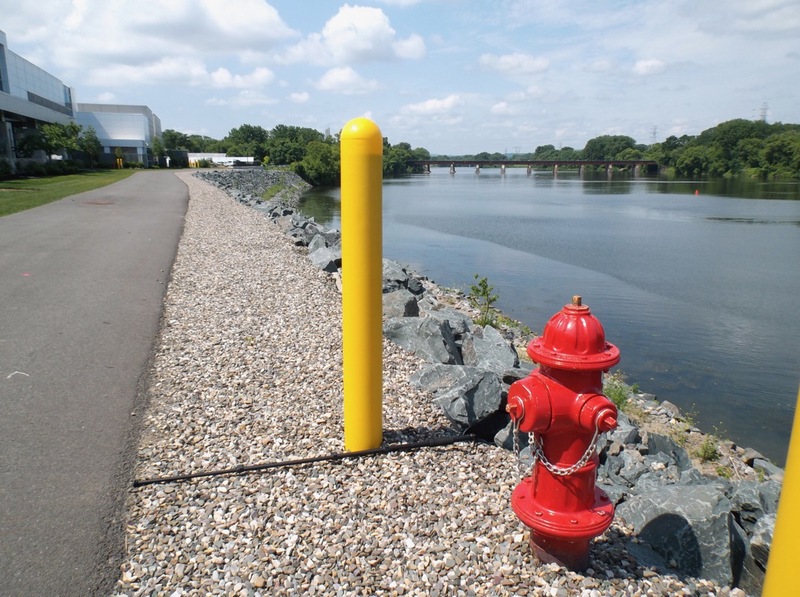 Zoning Board Chairman James Gleason said the application was modified from the one the board rejected on Oct. 4, and the board collectively determined the variance was not significant. 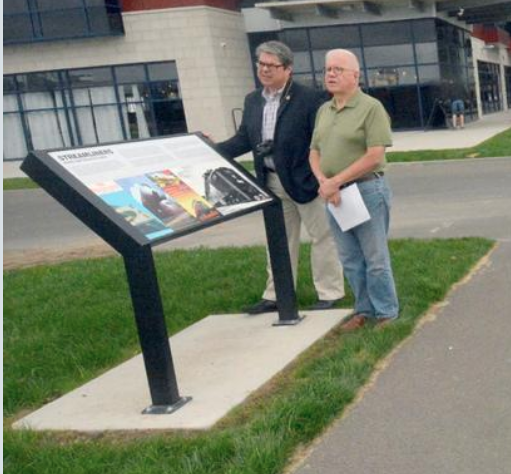 Board members who opposed the sign in October were primarily concerned about its size, according to meeting minutes. 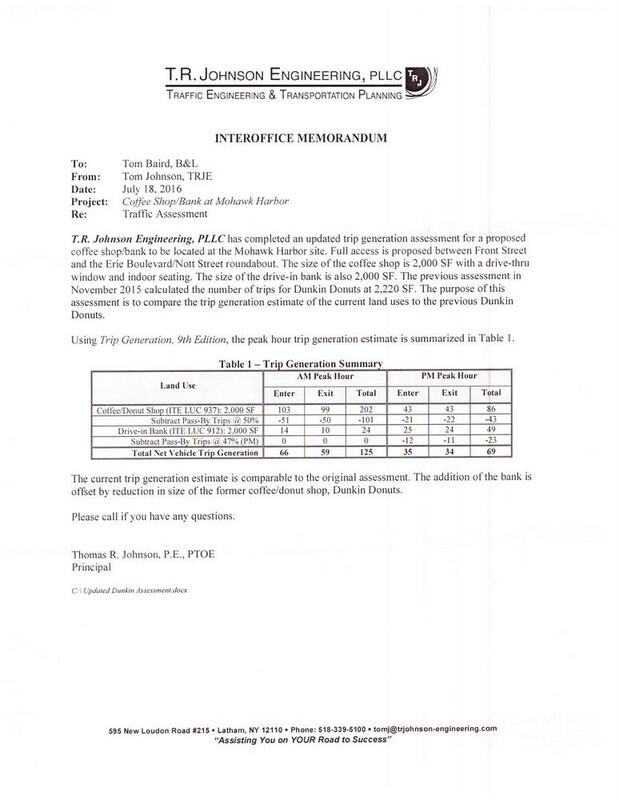 The is no mention that the “prior variances” permitting a 22′ h structure, 122 sq. ft., with an 8′ LCD screen took place only 15 days earlier (Nov. 1, 2017). 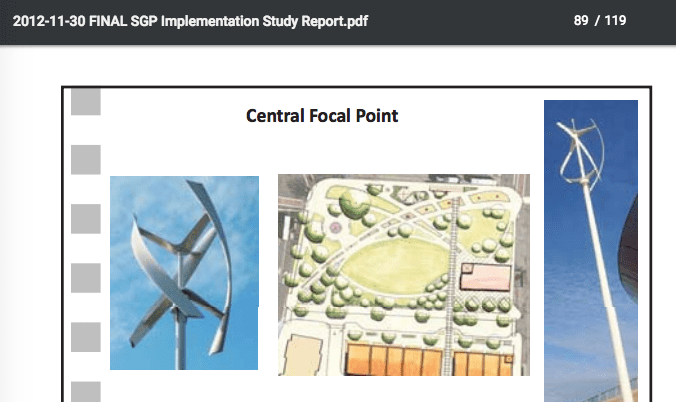 There is no mention that a virtually identical 30′ pylon was requested and rejected by BZA only 6 weeks earlier, on October 4, 2017). There is no mention of the significant discussion in my submitted Comments of the Traffic Safety Issue and Lack of Evidence of Safety, and of the Self-Created Hardship issue, or my summary of them at the meeting. 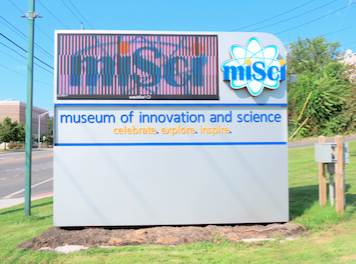 Mr. Keller stated that he believes that the bigger sign looks better and is more in keeping with the scale of its surroundings. Mr. Connelly and Mr. Gleason agreed. 1. 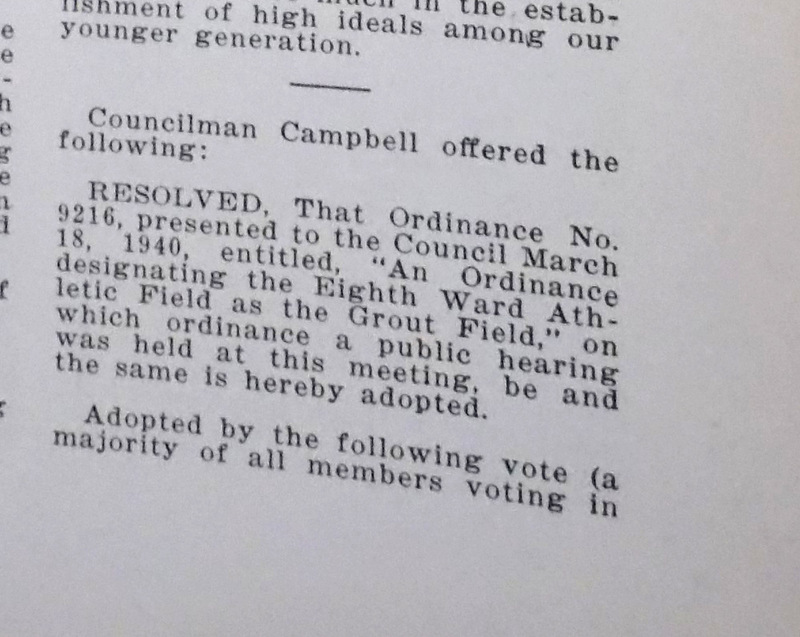 No undesirable change will be produced in the neighborhood. 2. The benefit sought by the applicant cannot be achieved by another method. 3. The variance is not substantial. 4. There will be no adverse effect on physical or environmental conditions in the neighborhood. To use a legal term I remember from law school, these findings are a joke. 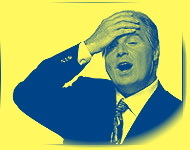 They surely do not pass the “blush test” — whether an assertion can be made without blushing. 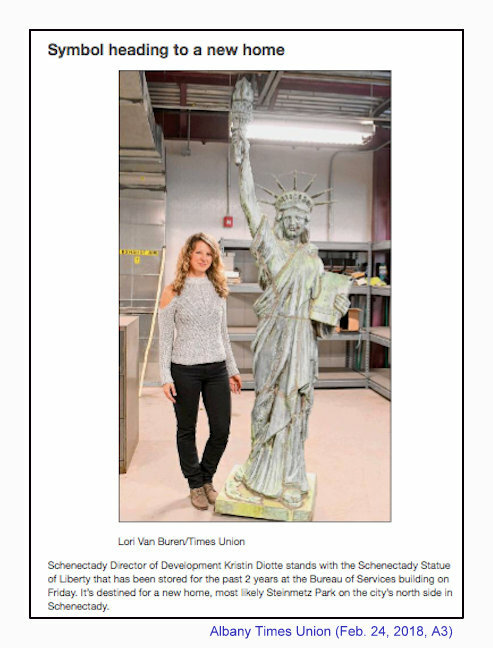 Of course, the scariest thing may be that the members of this Board and of the Planning Commission in Schenectady can no longer blush when asked to ignore the law and common sense by a special few members of the business and development community. In either case [an area/dimension variance or a use variance], the variance request is justified only if special conditions exist on the lot that create a hardship making it too difficult to comply with the code’s normal requirements. Likewise, a request for a variance on a normal lot with no special conditions could judiciously be denied. 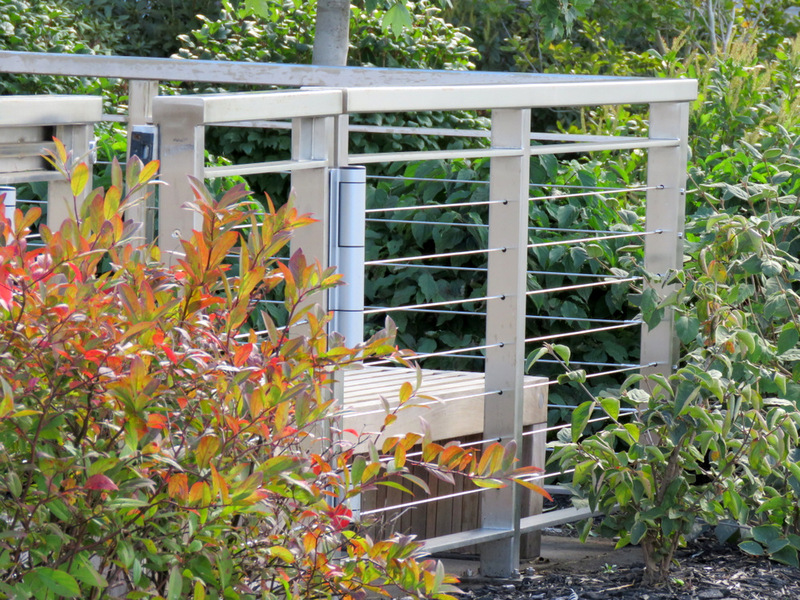 The special conditions or hardship typically must arise from some physical configuration of the lot or its structures. The financial or personal situation of the applicant normally cannot be taken into consideration. 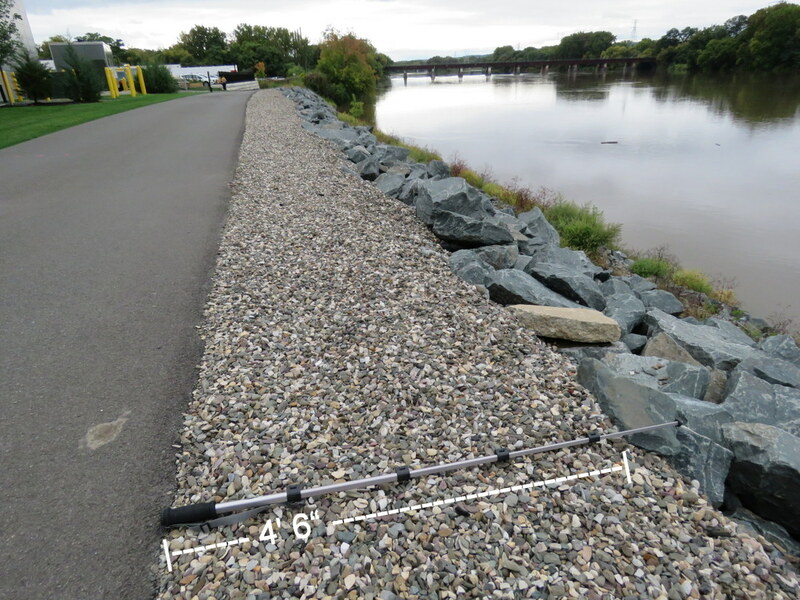 Under most codes governing variances, approval of the variance must not result in a public health or safety hazard and must not grant special privilege to the property owner. In other words, when a variance is granted, any other property owner with similar site conditions should be able to obtain a similar variance; this criterion is often addressed by citing precedent. 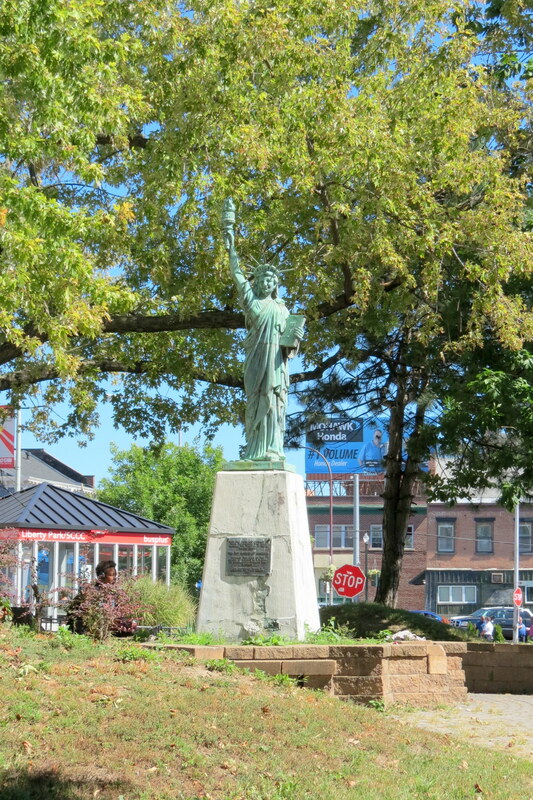 The statutes codify what the courts had previously held: When granting either a use or an area variance, a zoning board of appeals must grant the minimum variance that it deems necessary and adequate, while at the same time preserving and protecting the character of the neighborhood and the health, safety and welfare of the community. Thus, the board need not grant to an applicant everything he/she has asked for. Rather, the board is required to grant only the approval that is absolutely necessary to afford relief. 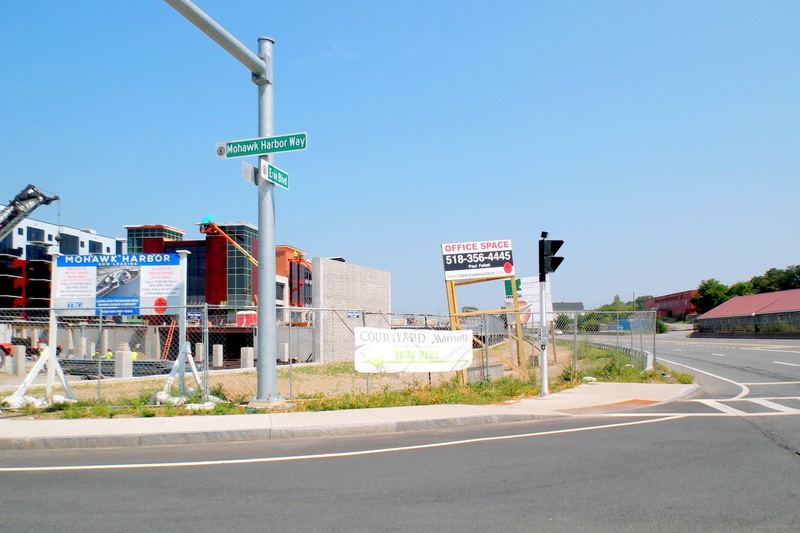 It is difficult to quantify “substantiality.” The board should, however, make a reasoned judgment as to whether the nonconformity being proposed is too great, as compared to the lawful dimensions allowed by the zoning law. Some courts have looked favorably upon a board’s application of a simple mathematical analysis. 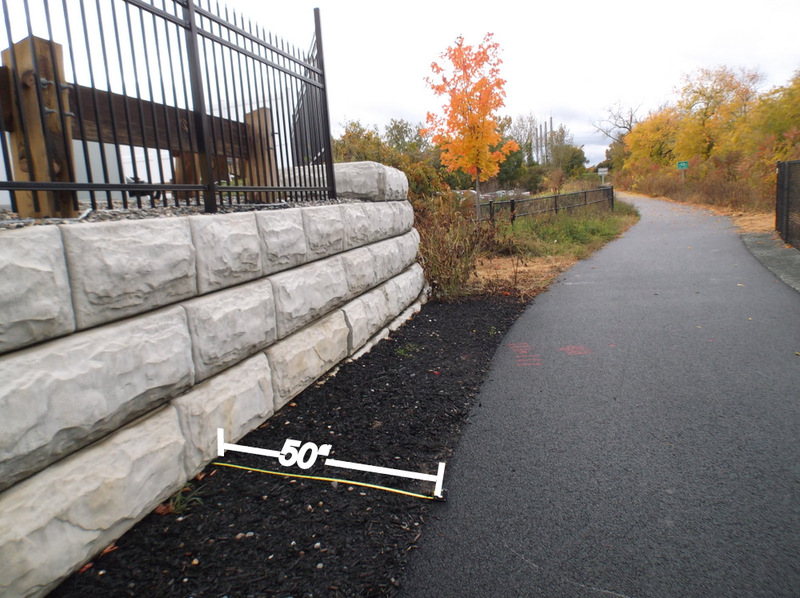 In Heitzman v. Town of Lake George Zoning Board of Appeals , the court upheld the denial of a variance based in part on the showing that construction would have exceeded the allowable lot coverage by 15%. 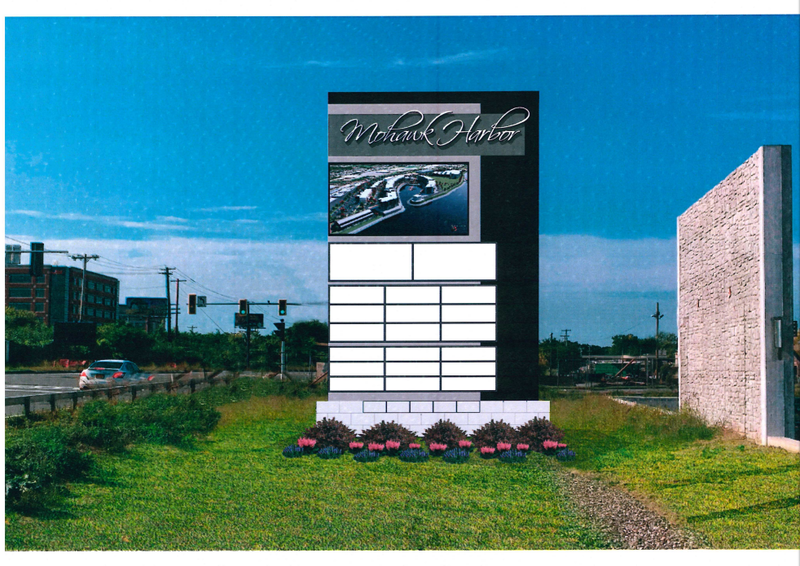 Just seventeen days ago, after virtual begging by Metroplex Chairman Ray Gillen, BZA granted a variance to permit a 22’ tall, 122 sq. ft in size, at the same location, in a spot where the City’s Sign Regulations limit such signs to 75 sq. ft and 7’ tall. 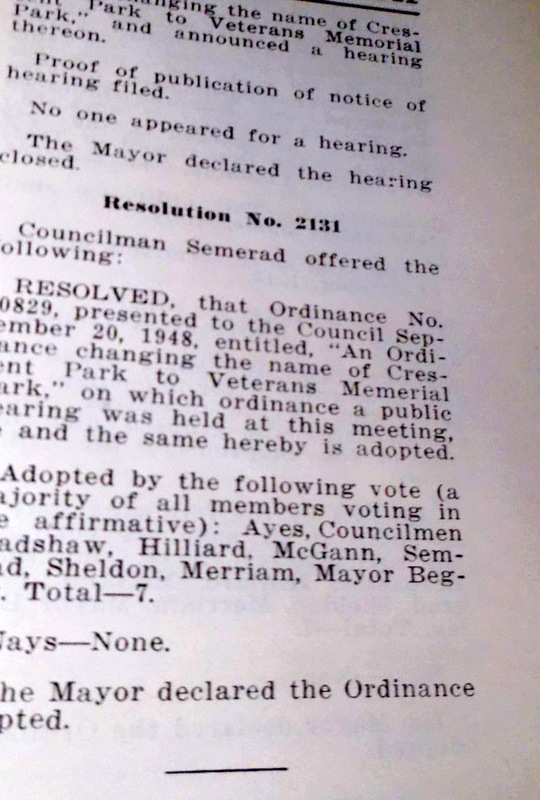 The motion to grant this newest application states that the variance is not significant. Other businesses in Schenectady may take this as a good precedent for larger, more distracting signs, with larger and brighter LCD screens. 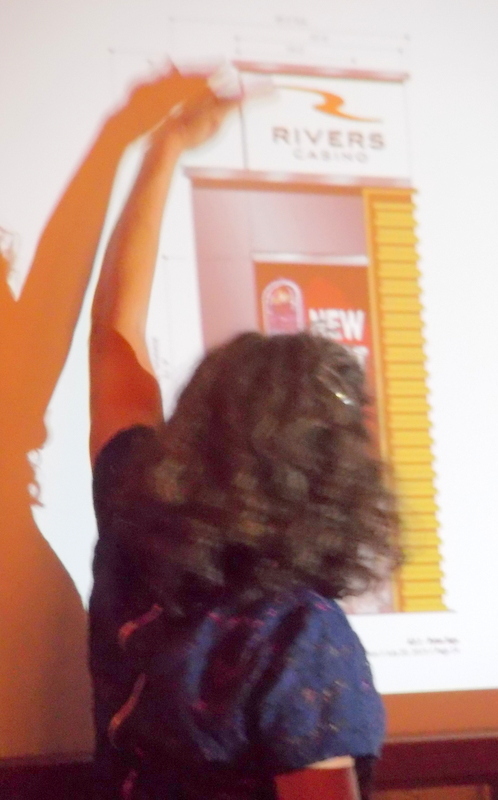 the rendition board displayed by Mr. Fallatti showed the LCD screen much duller than it will be when in use, reminding them of the Lighthouse screen at Freeman’s Bridge and the LCD screens on the Casino. 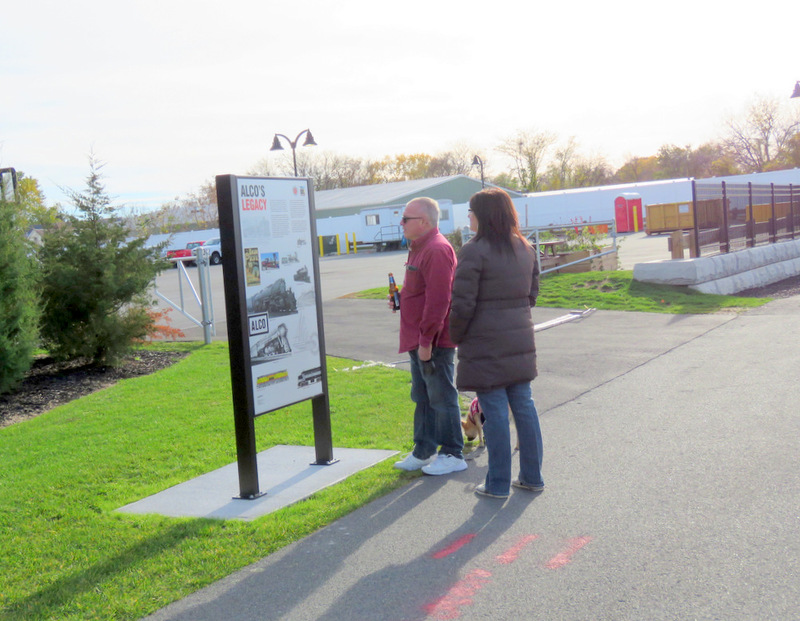 the total lack of evidence presented by the Applicant to show that such a large and bright sign so close to Erie Blvd., placed there to attract the close attention of motorists, will not be a safety hazard. 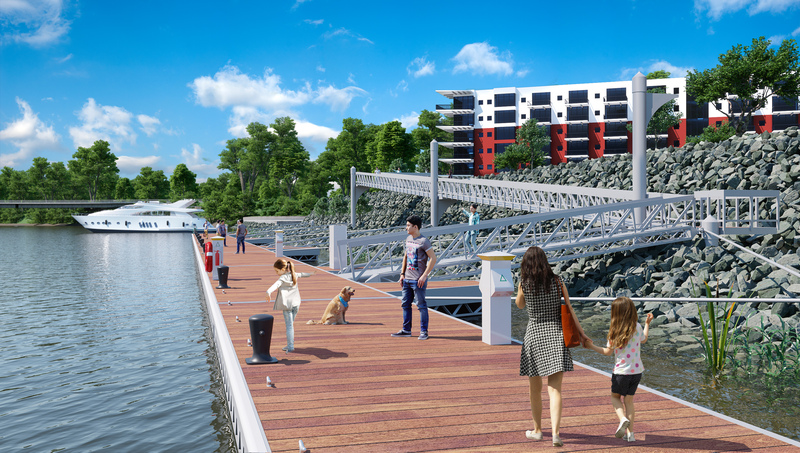 this is a “self-created” problem, with Mohawk Harbor’s owners knowing very well the limitations on signage in the Code, and this point further weighed against the Application. 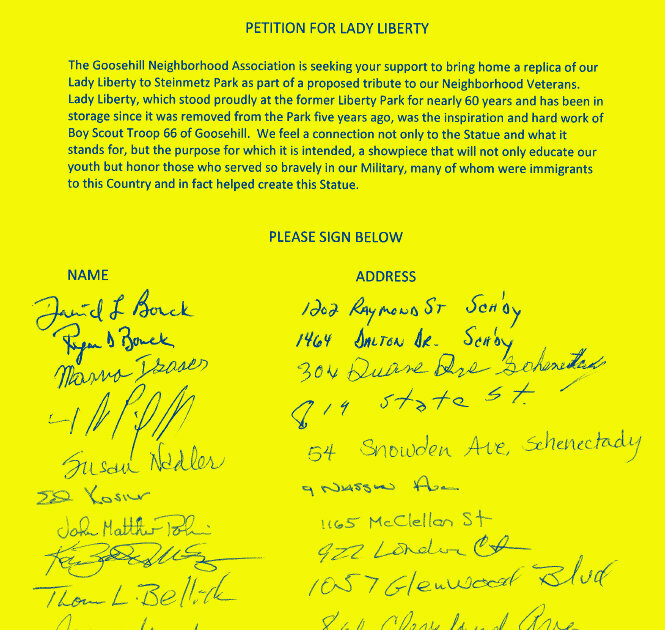 My neighborhood association is in complete agreement with Mr.Giacalone’s comments and recommendations. 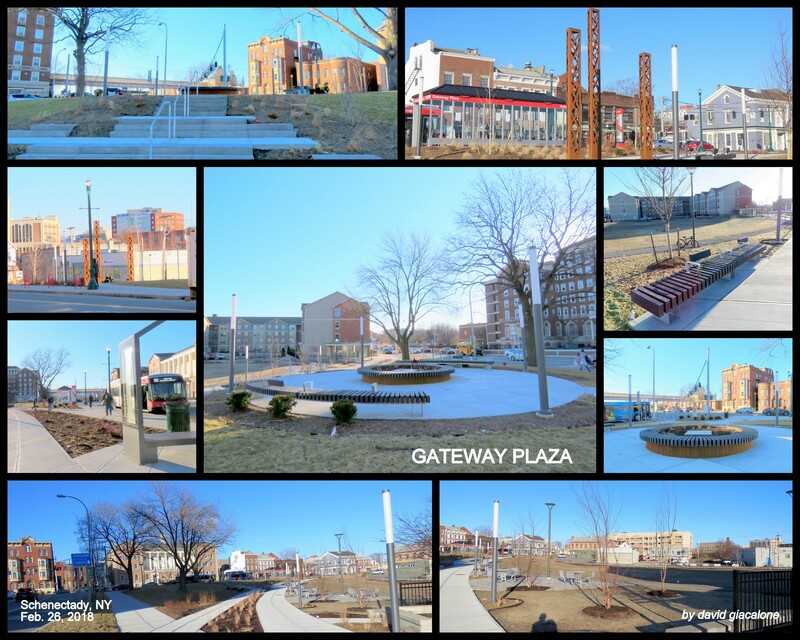 I would also add that, now that the trees are leafless, additional bright and glaring light will further contribute to our neighborhoods further erosion. 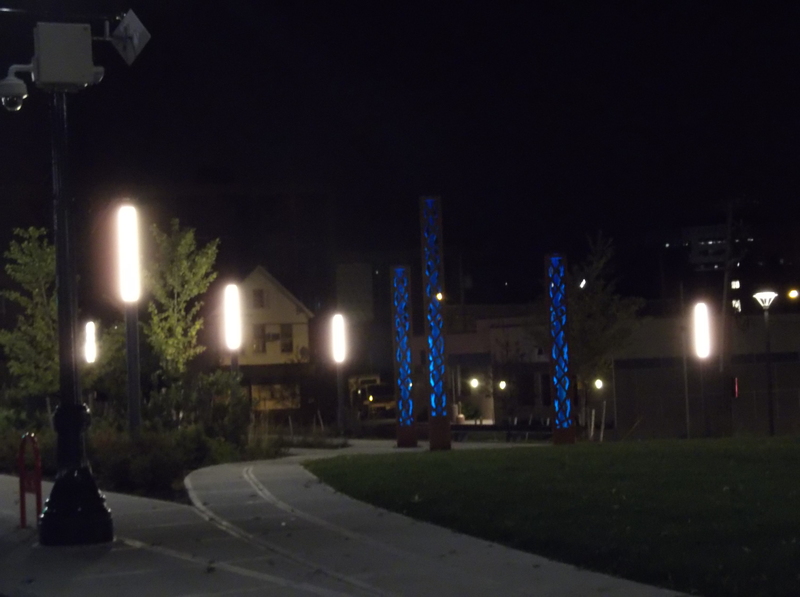 Perhaps the lighting should be planted nearer the new harbor housing. What kind of reaction would be expected? 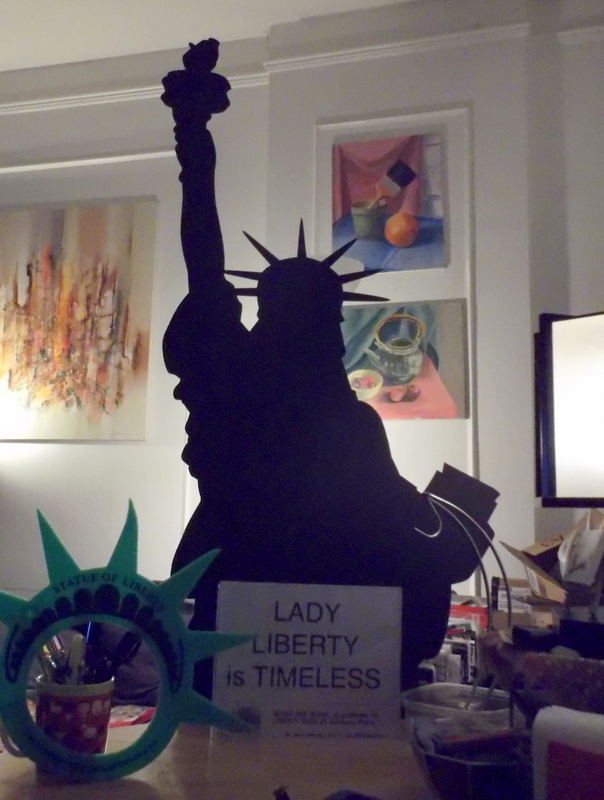 The tenants certainly would not tolerate such an intrusion. However, residents that have been paying taxes and keeping this City running are being treated like 2nd class citizens. The breaks have to be put on. Camille A. Sasinowski,President of the Goose Hill Neighborhood Association. By the way, this surprise “Special Meeting” of the Board was called with two days’ notice. 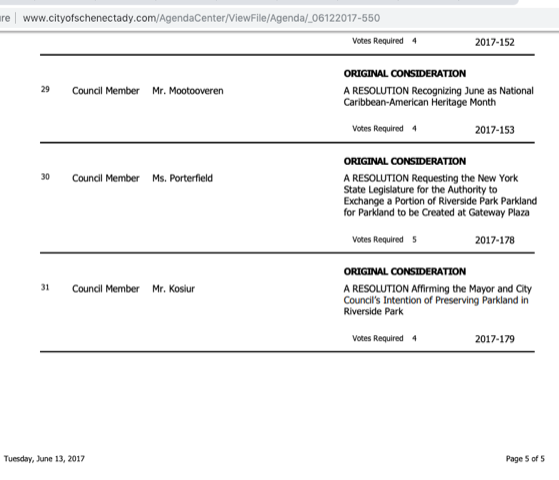 Despite my prior significant interest and contribution in this matter, I was not given notice by the Board’s staff of tonight’s meeting, nor of the Nov. 1 regular meeting. follow-up re Area of the Sign (Nov. 16, 2017, evening): I started wondering this evening why the Board of Zoning Appeals, like the Planning Commission this summer, accepted the figure of 265 sq. 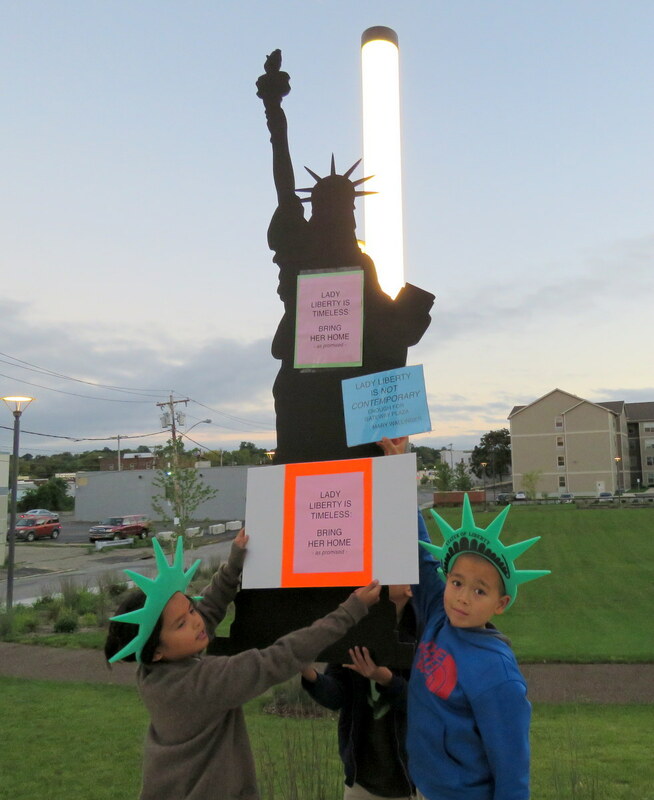 ft. for the proposed 30′ tall pylon sign that was given to them by the Applicant, Paul Fallati for Mohawk Harbor. 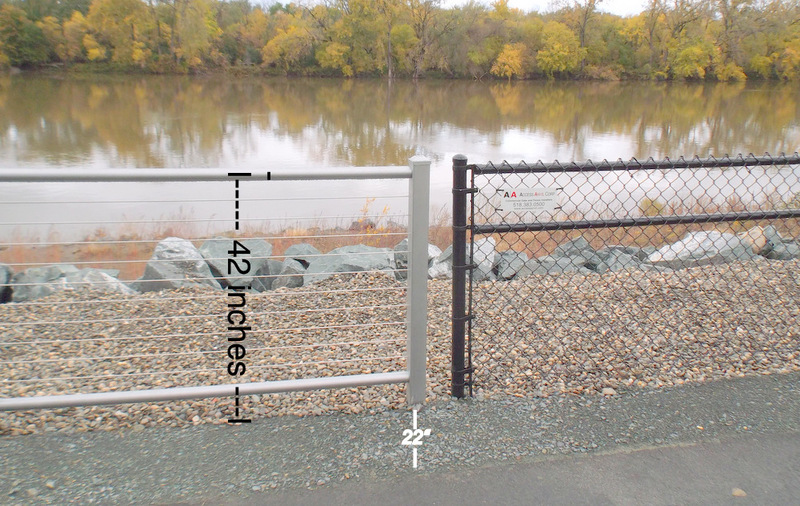 Not counting its 36″ high base, the pylon is 27′ by 18′ 4″, which seems to yield an area of 495 square inches. 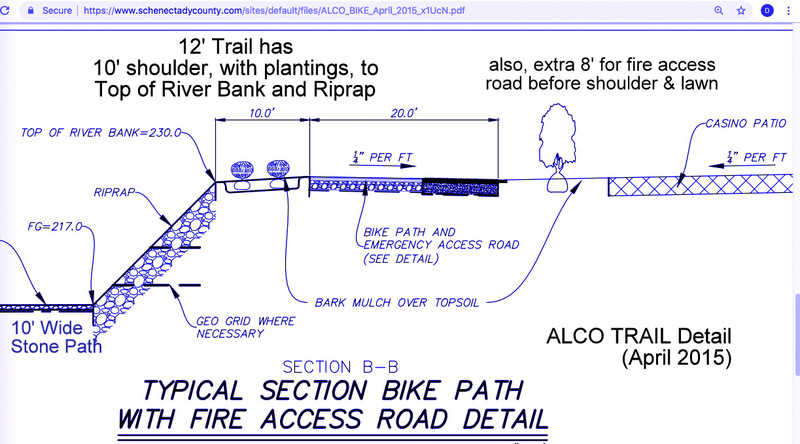 Click on the image to the right to see the sketch provided by the Applicant showing the dimensions; I have repeated the main numbers in red in a larger font to make them easier to read. AREA OF THE SIGN The area of all lettering, wording, and accompanying designs, logos, and symbols, together with the background on which they are displayed, whether open or enclosed Where the sign consists of individual letters, designs or symbols attached to a building, awning, wall, or window, the area shall be that of the smallest rectangle which encompasses all of the letters, designs, and symbols. The structure supporting a sign shall be excluded unless the structure is designed in a way to form an integral background for the display. Only one face of a double-faced sign shall be counted as surface or area of such a sign. The LED screen, called “ECM” by the Applicant, is of course a sign within the above definition. 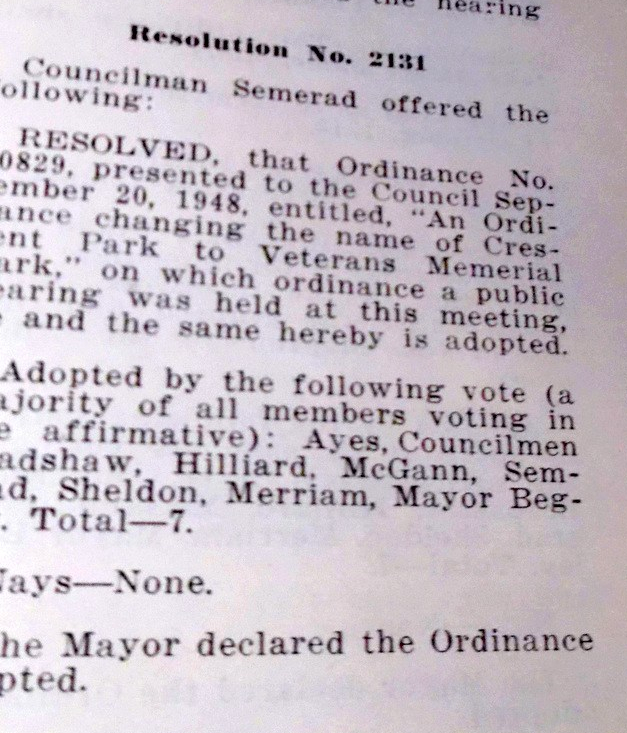 Although BZA thought the variance it granted to be “not significant”, two hundred and sixty-five is significantly more than 75. And, 495 is, in my estimation, scandalously more than 75. 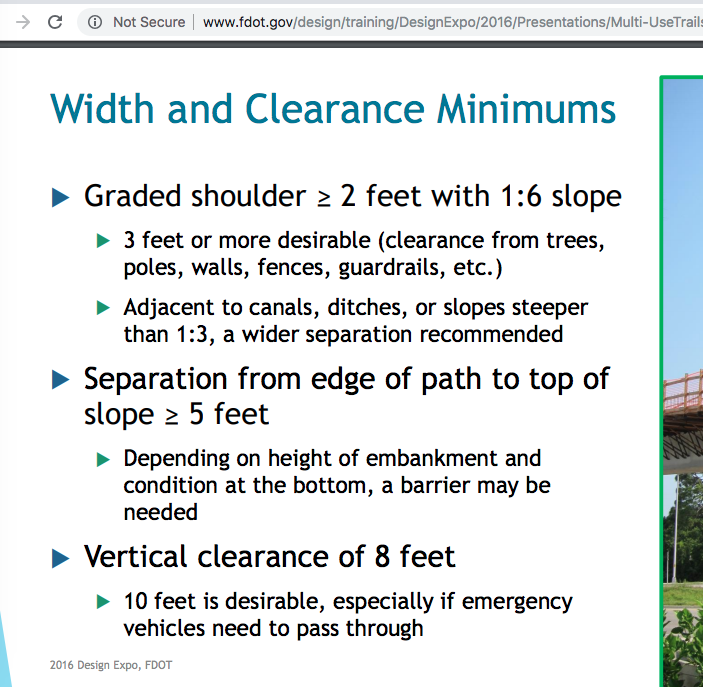 By the way, while checking the signage Code, I was reminded of the definition of a pylon sign: “PYLON SIGN — A sign that has a base that is a minimum of three feet wide and a maximum of five feet wide. At no time can the message portion exceed eight feet wide.” No further comment needed. 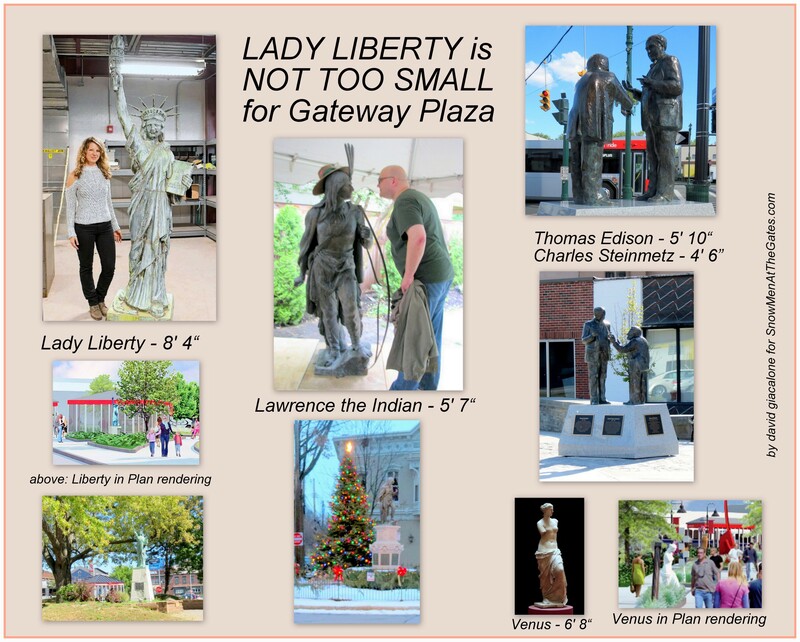 update: After Metroplex Chairman Ray Gillen literally begged them for “a favor”, they changed their mind: “BZA’s pylon flip-flop – a change from 221″ wide to 220″ wide!” (Nov. 16, 2017). 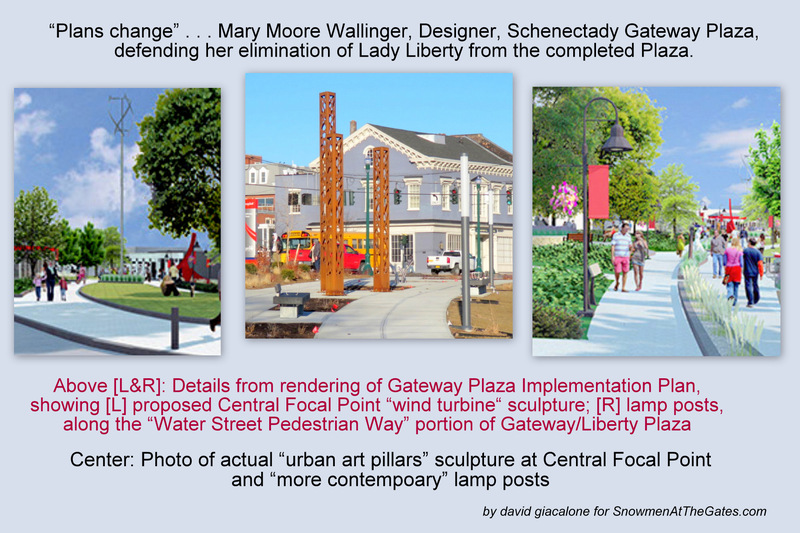 Yesterday evening, October 4, 2017, the Schenectady Board of Zoning Appeals denied the request of Mohawk Harbor’s Paul Fallati for a variance to permit a 30-foot-tall pylon sign alongside Erie Blvd, at Mohawk Harbor Way, that had a large LCD screen and 22 lighted “tenant signs”. 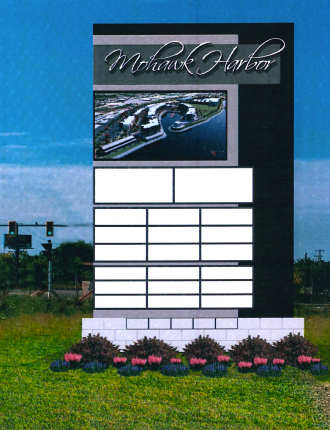 BZA did grant a variance for a “monument’ sign at the entrance to Mohawk Harbor, on the south side of the intersection. 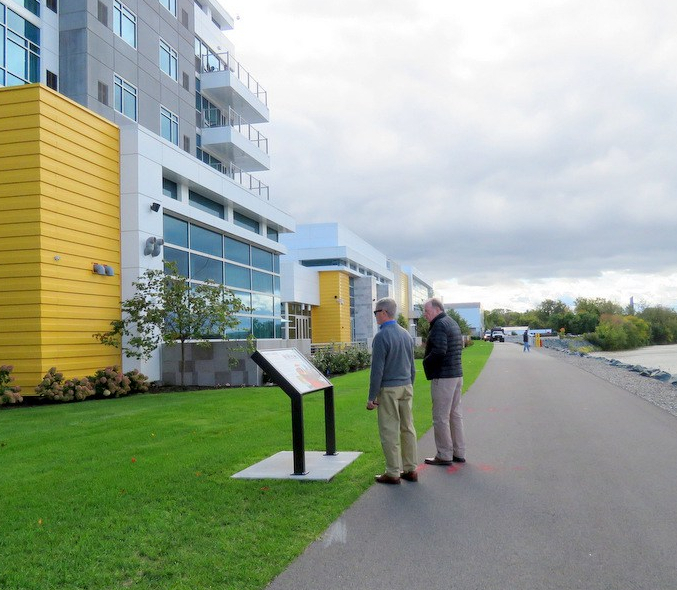 The variance is needed because the Zoning Code only permits freestanding signs 7′ tall in the C-3 Waterfront district for signs that are not casino-related. 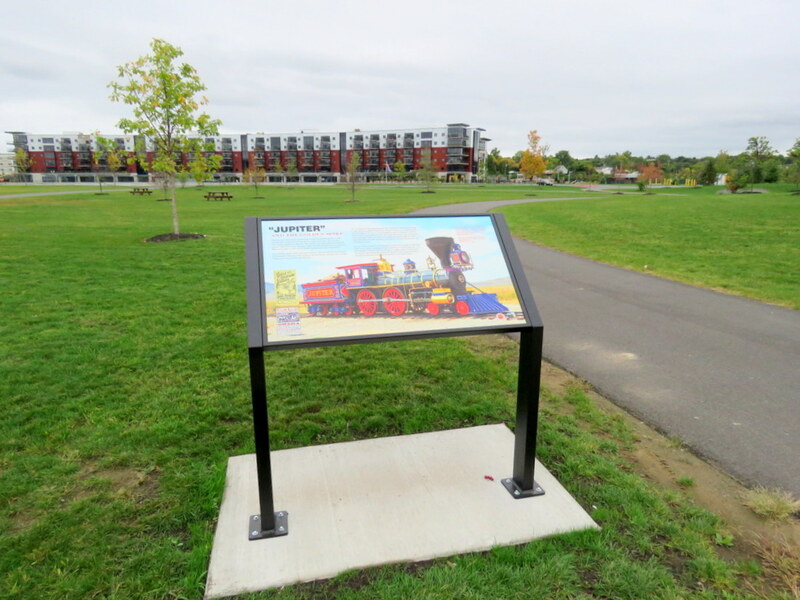 For more details and discussion of the issues see our earlier posting “updates on the proposed Mohawk Harbor signs“. WHAT? 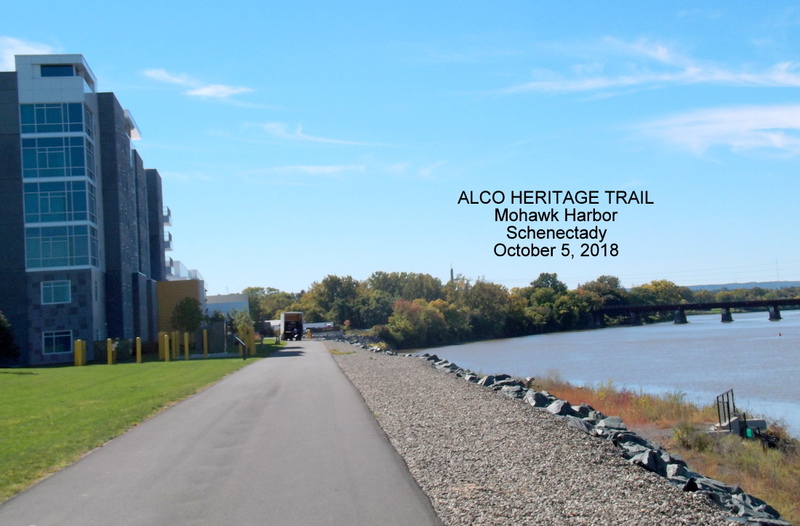 Mohawk Harbor (Maxon Alco Holdings) is asking the Schenectady Planning Commission for permission to put up a 32′ by 14′ pylon (including an LED screen atop it 12′ by 6′ in size), and to construct a “monument sign” 40′ wide and 10′ high. WHERE? 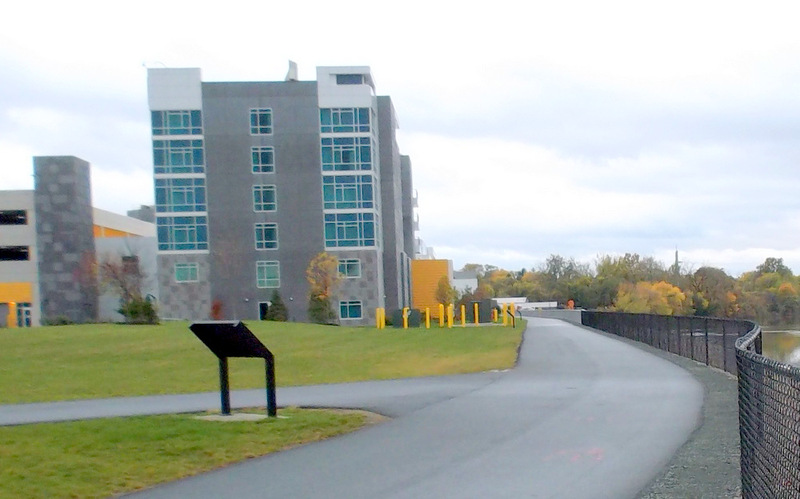 One on each side of the entryway of Mohawk Harbor, on Mohawk Harbor Way, at its intersection with Erie Boulevard. WHEN? 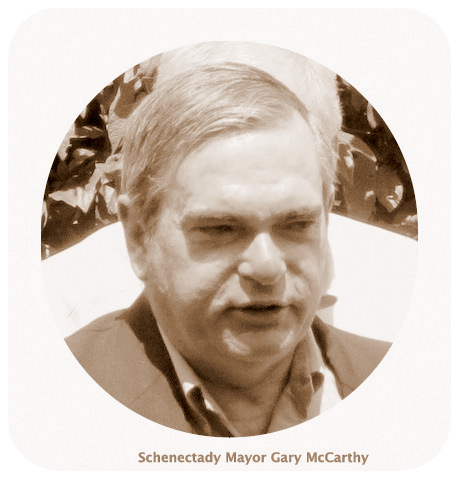 On the Planning Commission Agenda, August 16, 2017, August 16, 2017, at 6:30 PM, in Room 110, City Hall, 105 Jay Street, Schenectady, NY 12305. 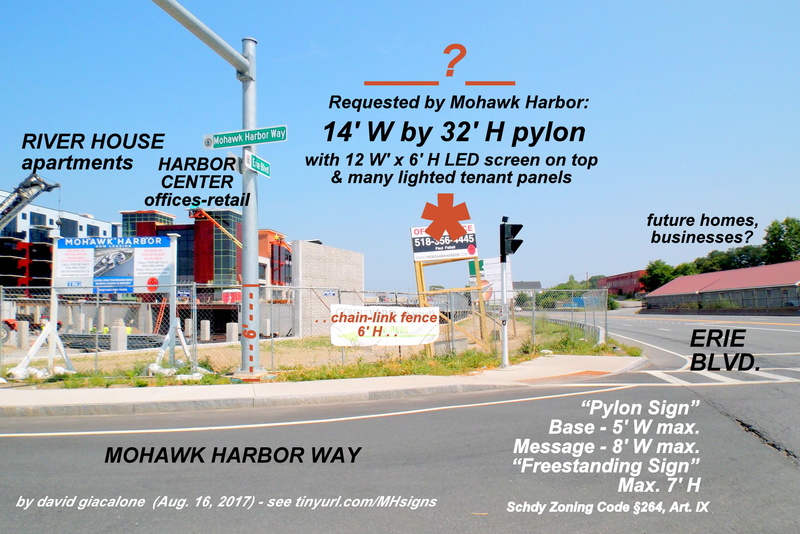 B. MAXON ALCO HOLDINGS LLC requests a Special Use Permit and sign approval pursuant to Section 264-61 I and 264-89 D of a proposal to install a pylon style sign with an electronic message board at the entrance to Mohawk Harbor, tax parcel # 39.49-2-1.2 located in a “C-3” Waterfront Mixed Use District. Items are not supposed to be placed on the Commission agenda until staff determines that the application is complete. 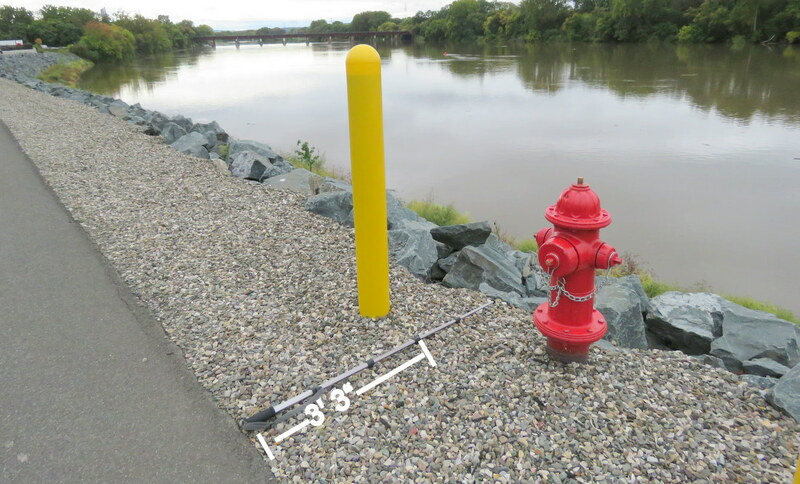 Therefore, I expected it to be easy to take a look at the Pylon Application. After being told for a couple days that, “of course” they had the submission since the item is on the Agend, but it could not be found, I learned today that the submission did not arrive until today, Friday, August 4. 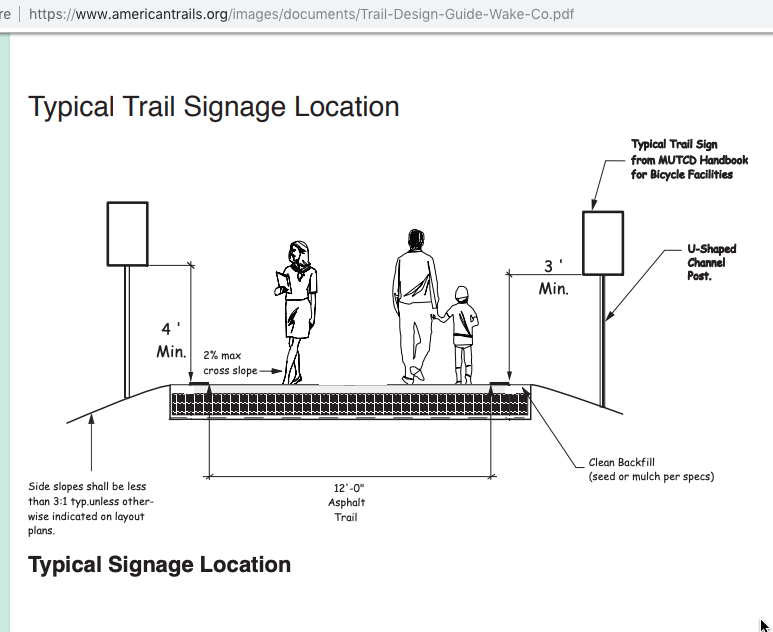 The applications — one for a “monument sign” and one for a pylon sign — were actually dated yesterday, August 3, including the technical drawings. 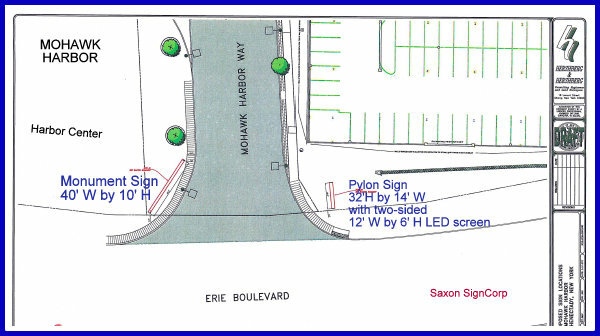 And, in fact, late in the afternoon, a corrected replacement sketch of the pylon sign was submitted by Saxton SignCorp and Mohawk Harbor’s representative Paul Fallotti. 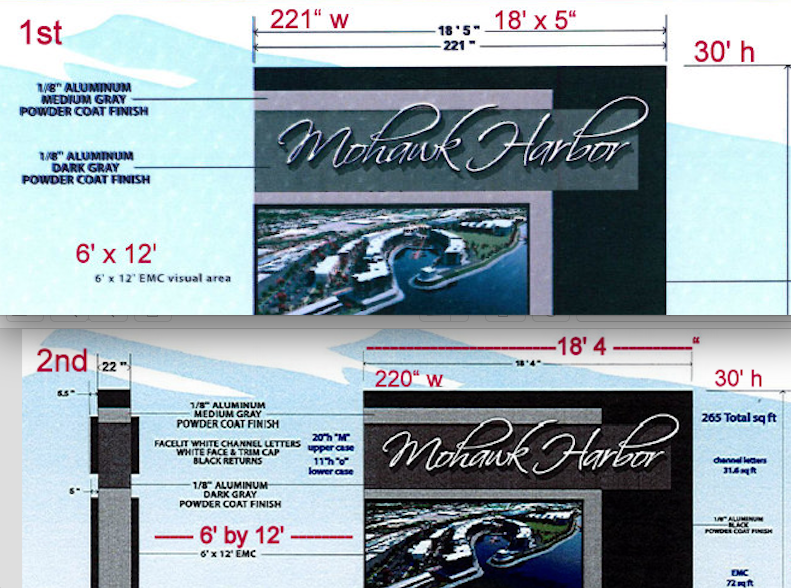 The top portion of the pylon sign sketch was changed from an LED screen showing the casino floor to a screen merely saying “Mohawk Harbor.” (See image to the right of this paragraph.) 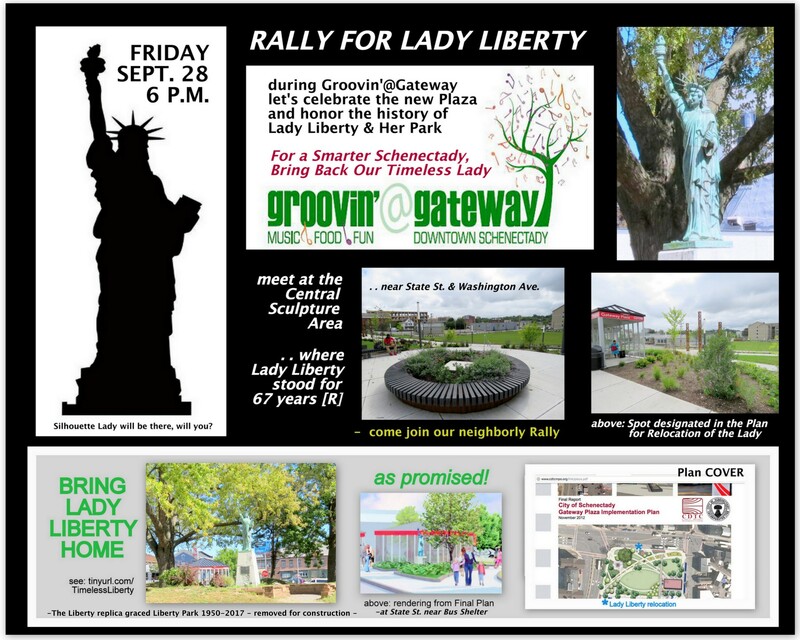 I do not know if or how often the “branding sign” will vary its message or how animated its images will be. 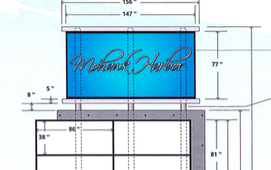 The signage below the LED screen on the proposed pylon are panels with the names of business at MH and they will be lit. 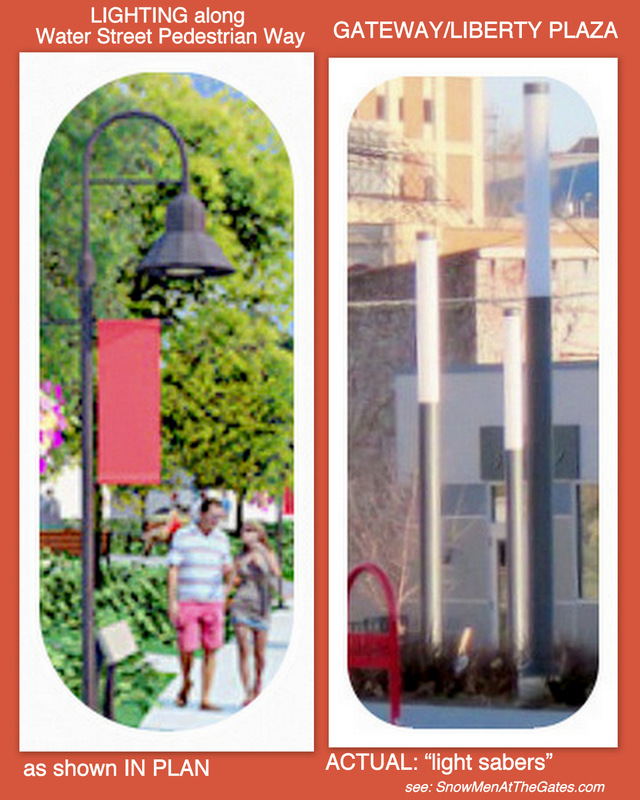 The LED screen will change message, advertising events and businesses within the MH complex. update (Aug. 11, 2017): Christine Primiano gave me some helpful information this morning about the applications and likely timing and process. 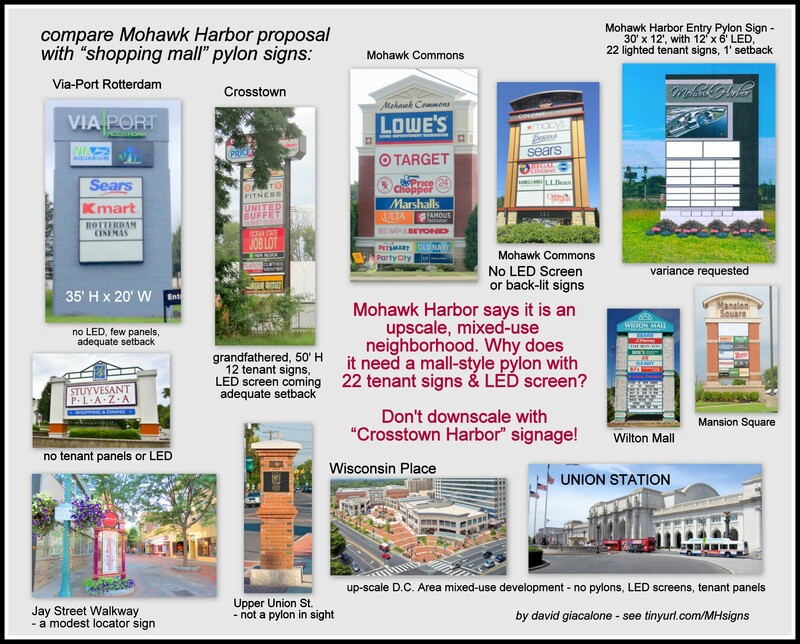 See “update on the proposed Mohawk Harbor signs.” The Commission or its staff apparently concur with the arguments below about the need for variances due to the excessive size of the signs, and there will be no approval or denial of the applications at the August meeting. 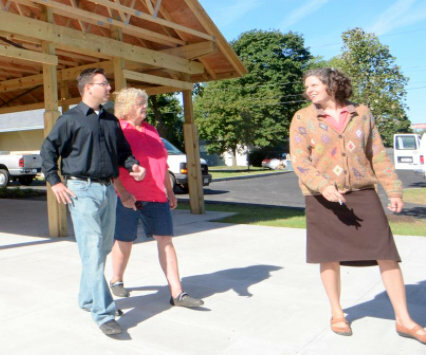 The Board of Zoning Appeals is expected to have needed variance requests on its October agenda. Principal City Planner Christine Primiano, who would surely have explained the situation to me and others seeking to see the submission sooner if she were not on a much-needed vacation, wrote to submission seekers this afternoon, after being contacted by her staff. Christine explained that she had posted the Agenda before leaving on vacation rather than waiting until today, to get it up in a timely manner. However, Maxon Holding had not yet submitted its application, but promised to do so by Monday July 31, in her absence. Unfortunately, the Applicant took until today to finally submit an application (which I personally consider to be inadequate, for reasons given below). 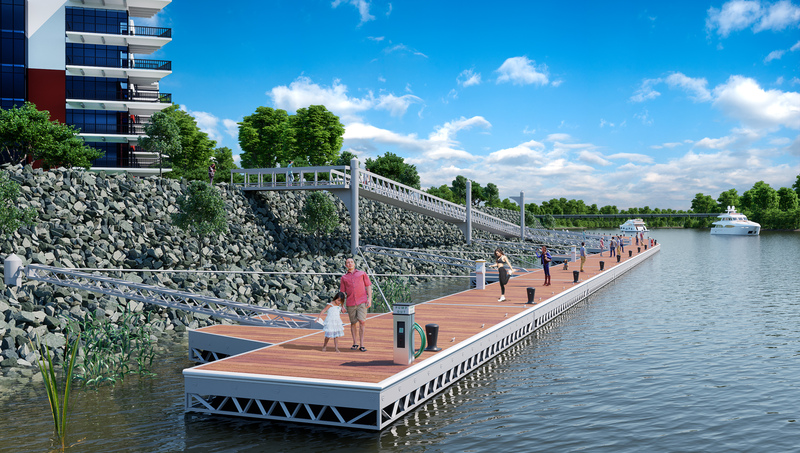 Christine does not plan to review it until back on Monday, August 7, and I hope she enjoys the weekend.
. . . proposed pylon at entrance to Mohawk Harbor at Erie Blvd. 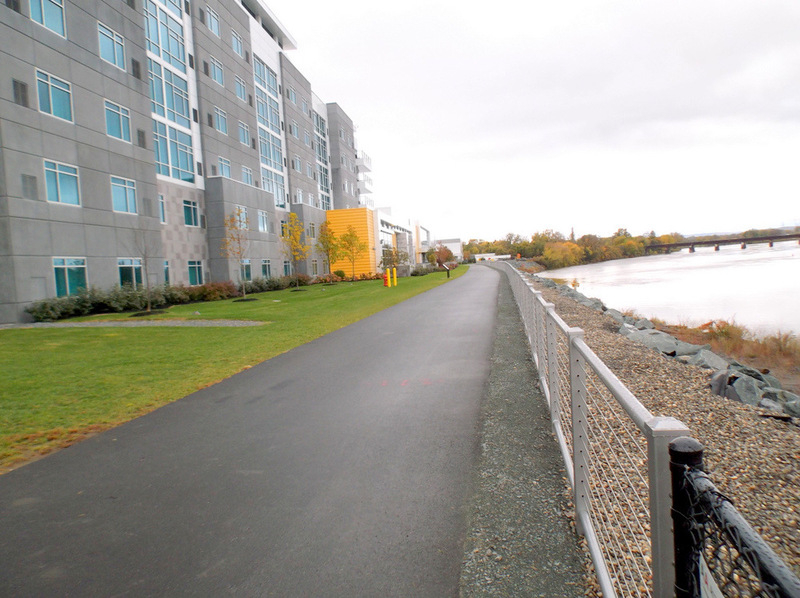 and Mohawk Harbor Way. 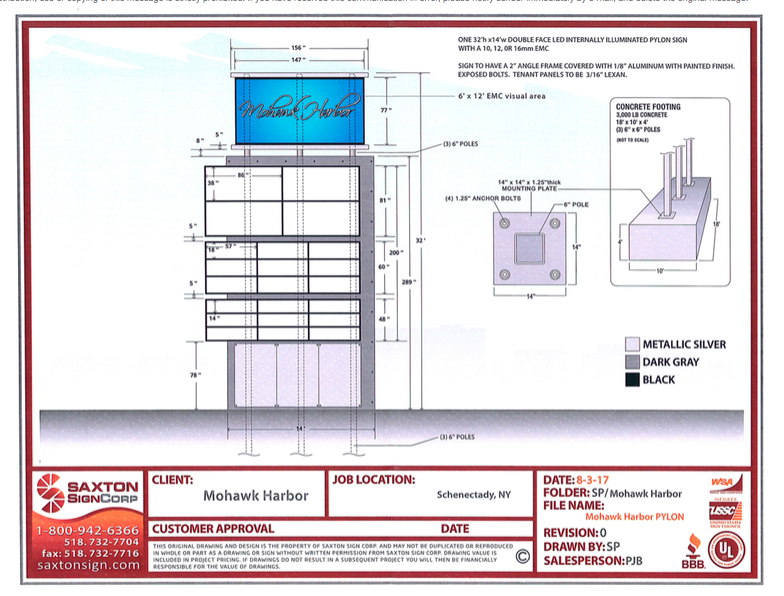 Dimensions: 32′ H and 14′ wide, with an LED screen 12′ wide by 6′ high. 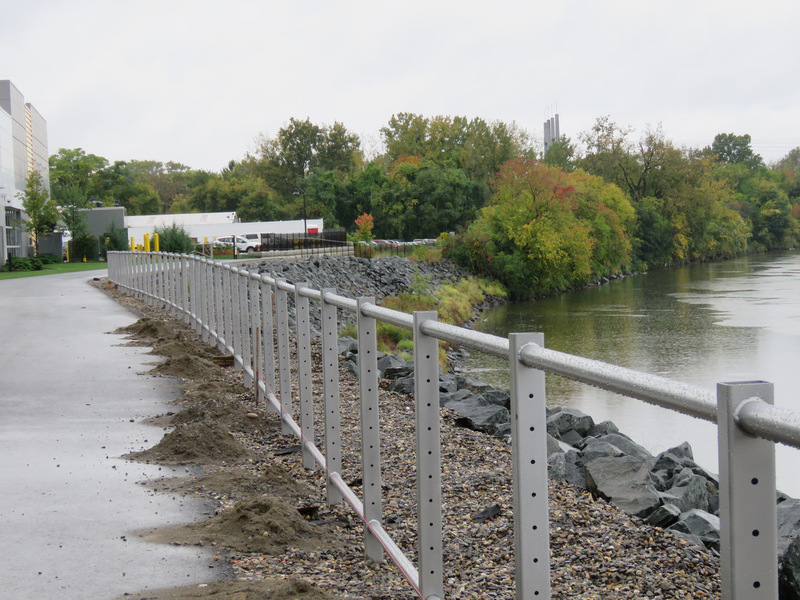 Click for the pylon portion of the Aug. 3, 2017 Application. 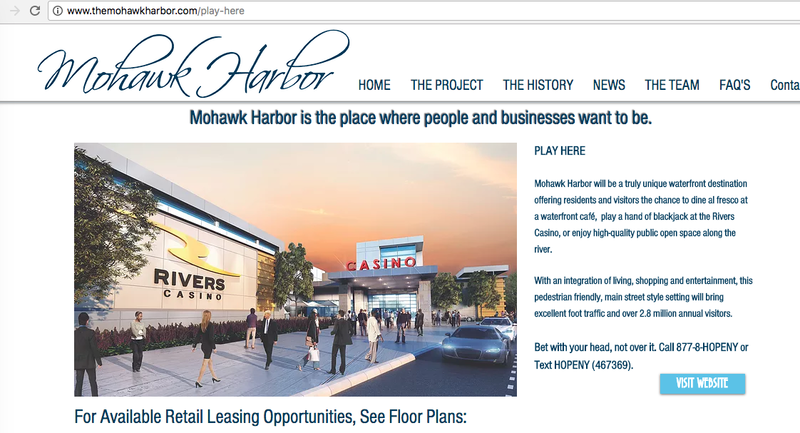 Readers of this weblog might recall that its proprietor has not been pleased over the past couple years with the handling of the casino pylon issue at Mohawk Harbor by the Galesi Group and the Casino Gang at Rush Street, nor by the Planning Commission and City Council. 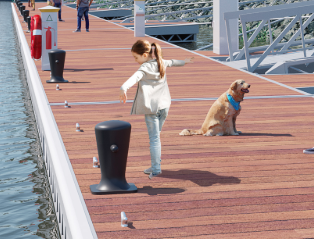 So, I started out a bit doubtful when I heard of a new pylon submission, having predicted in March 2016 that we had not seen the end of the zombie pylon at Mohawk Harbor. 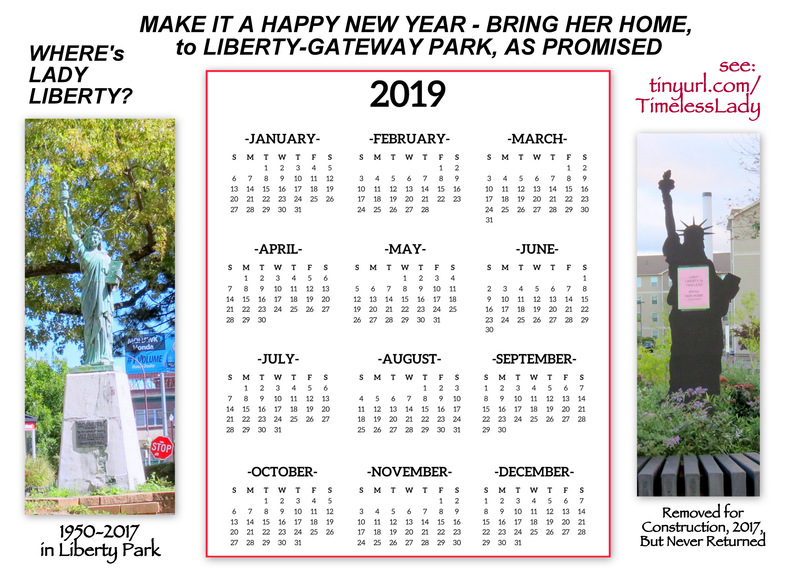 But, the tardy submission of the application materials is not the real problem here, as I see it, except that it continues to show that Galesi Group seems to get special treatment by the Planning Office. Why the “rush” again? 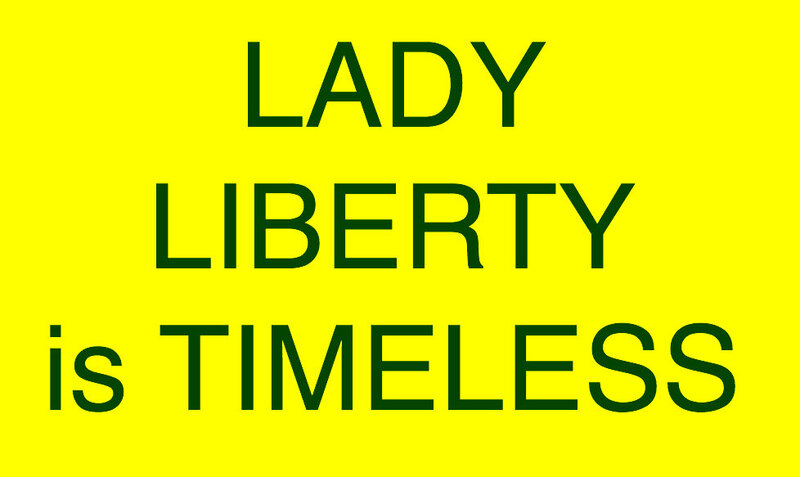 There is no “deadline” of any sort any different than that facing any business wanting to put up new signage. 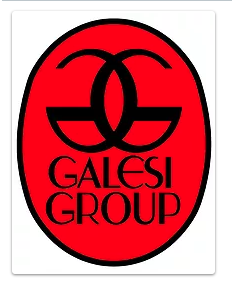 More important, it seems yet again clear that the Galesi Group/Maxon Alco Holding does not give sufficient respect to the responsibilities of the Planning Office and the rights of the public. 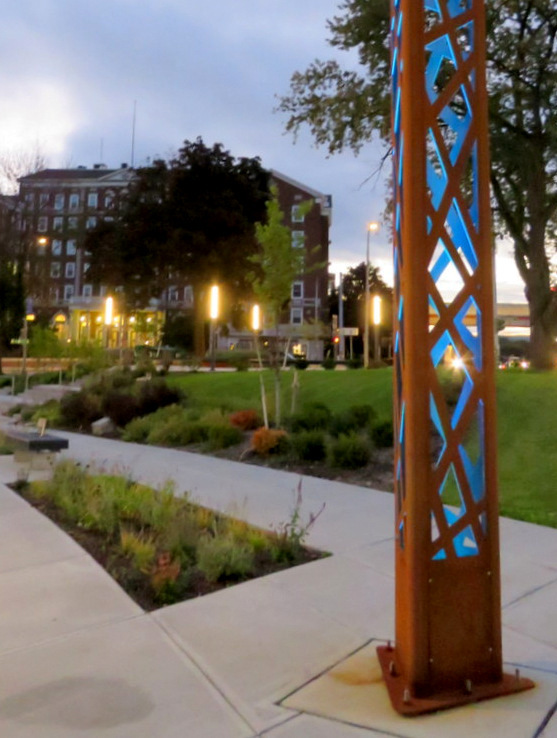 The more substantive issue raised by the application for a pylon sign and a monument sign (click for that application) is symbolized by the last-minute correction to the LED screen at the top of the pylon: This is not a casino-related set of signage applications. 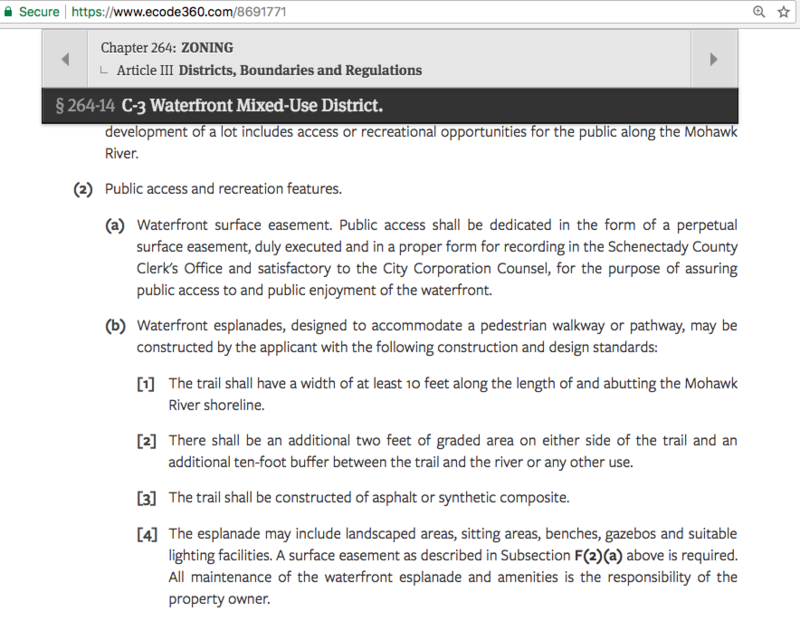 Therefore, although it is within the C-3 Waterfront Mixed-Use District, it does not benefit from the exemption to Article IX of the Schenectady zoning code (Chapter 264), which sets forth signage regulations for all (non-casino) Schenectady businesses, including specifications for allowed signage in the various zoning districts, in §264-61(K), Schedule I. Click on the thumbnail image at the left of this paragraph to see Schedule I.
H. Supplemental C- 3 Regulations. 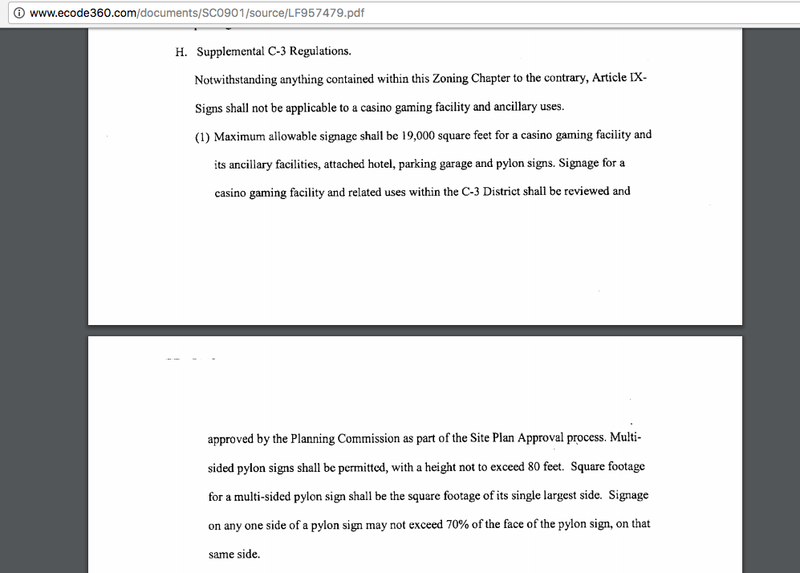 Notwithstanding anything contained within this Zoning Chapter to the contrary, Article IX – Signs shall not be applicable to a casino gaming facility and ancillary uses. 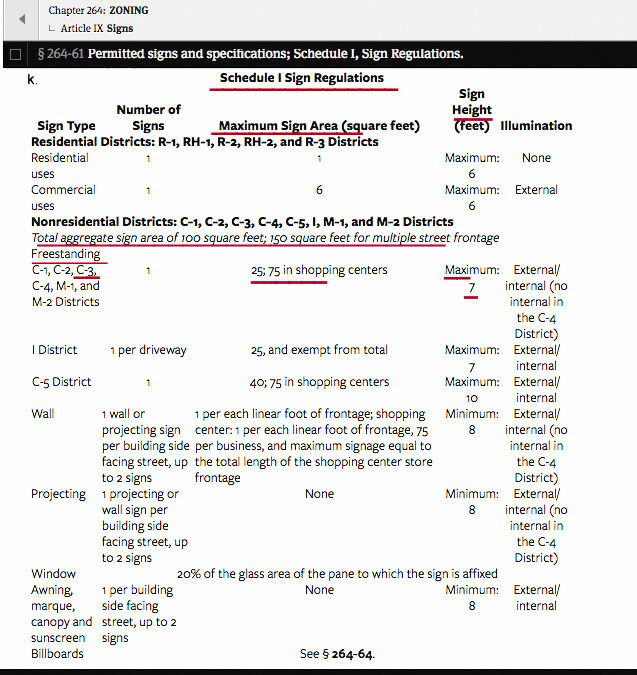 1) Maximum allowable signage shall be 19,000 square feet for a casino gaming facility and its ancillary facilities, attached hotel, parking garage and pylon signs. 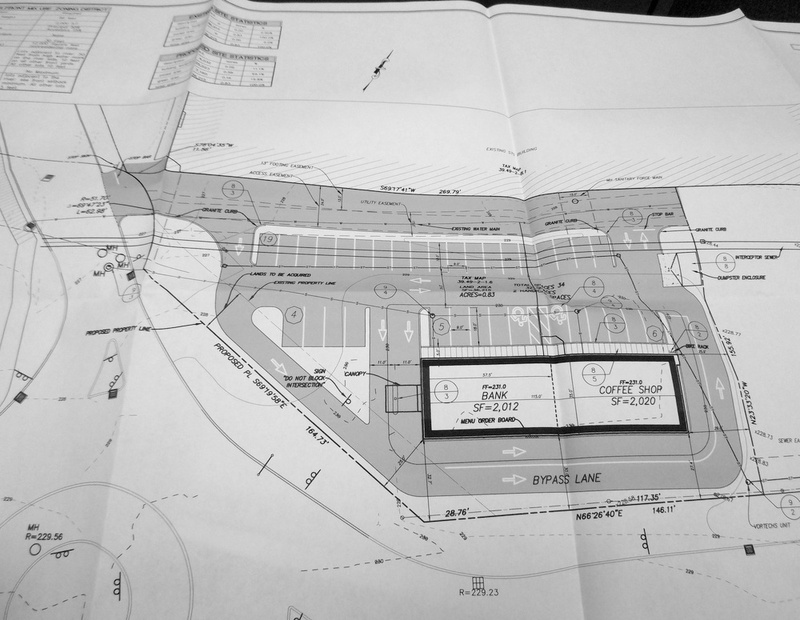 Signage for a casino gaming facility and related uses within the C- 3 District shall be reviewed and approved by the Planning Commission as part of the Site Plan Approval process. Multi – sided pylon signs shall be permitted, with a height not to exceed 80 feet. 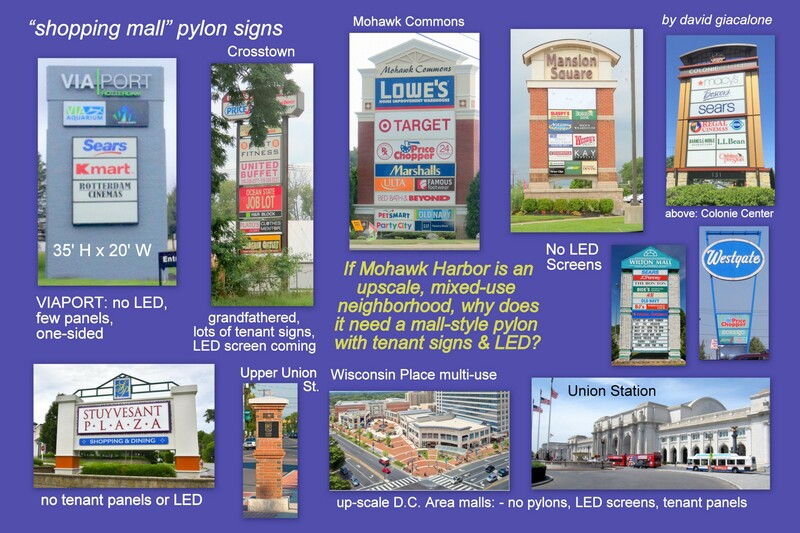 Square footage for a multi -sided pylon sign shall be the square footage of its single largest side. Signage on any one side of a pylon sign may not exceed 70% of the face of the pylon sign, on that same side. 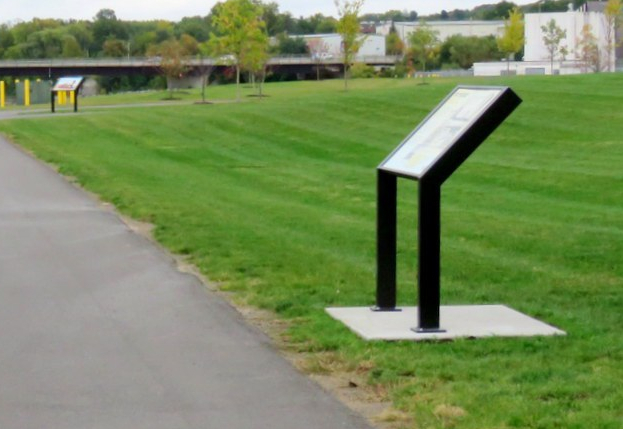 FREESTANDING SIGN — A self-supporting sign standing alone on its own foundation. 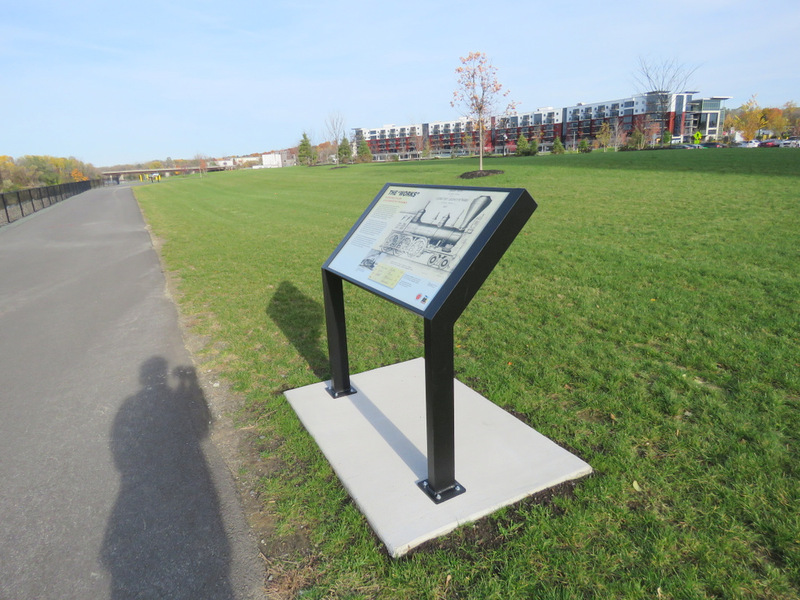 MONUMENT SIGN — A freestanding sign attached to a brick, stone, or masonry wall or structure that forms a supporting base for the sign display. 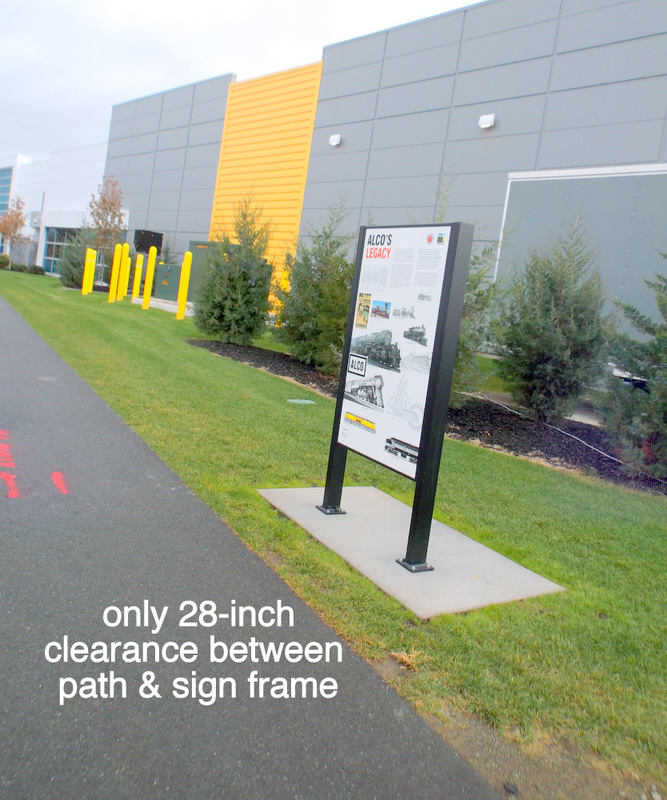 PYLON SIGN — A sign that has a base that is a minimum of three feet wide and a maximum of five feet wide. At no time can the message portion exceed eight feet wide. 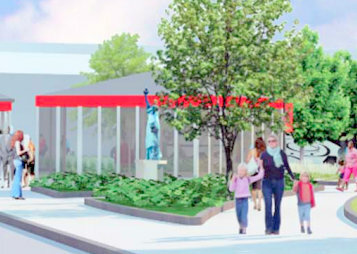 SHOPPING CENTER — A group of three or more retail and commercial units on a single site, constructed and managed as a total entity, sharing a common on-site parking area. 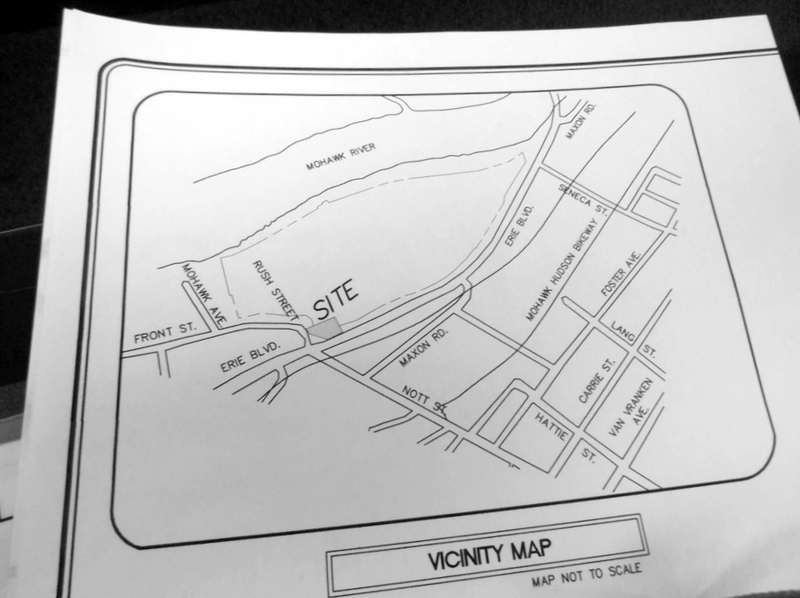 It is the Zoning Board of Appeals, not the Planning Commission, which is authorized to hear a request for an area variance. 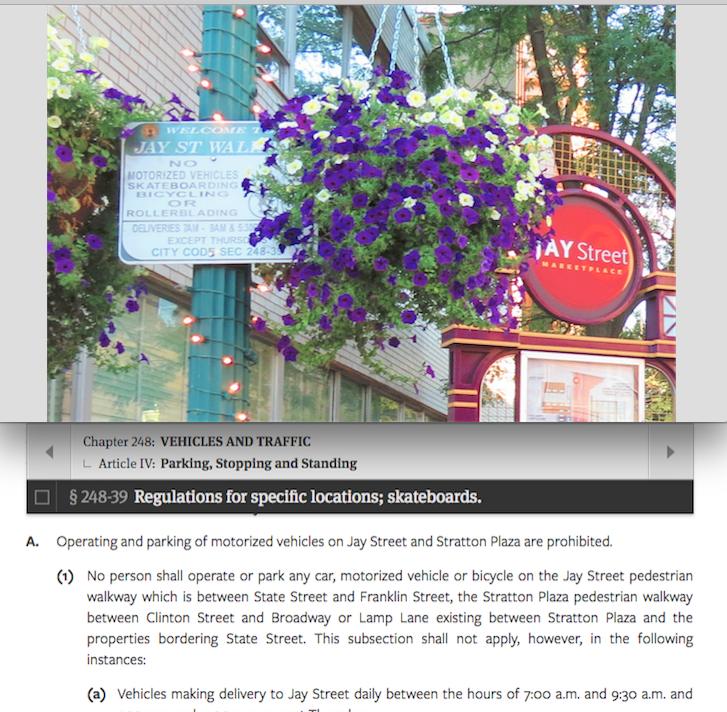 This same Area Variance requirement also applies to the Monument Sign application. 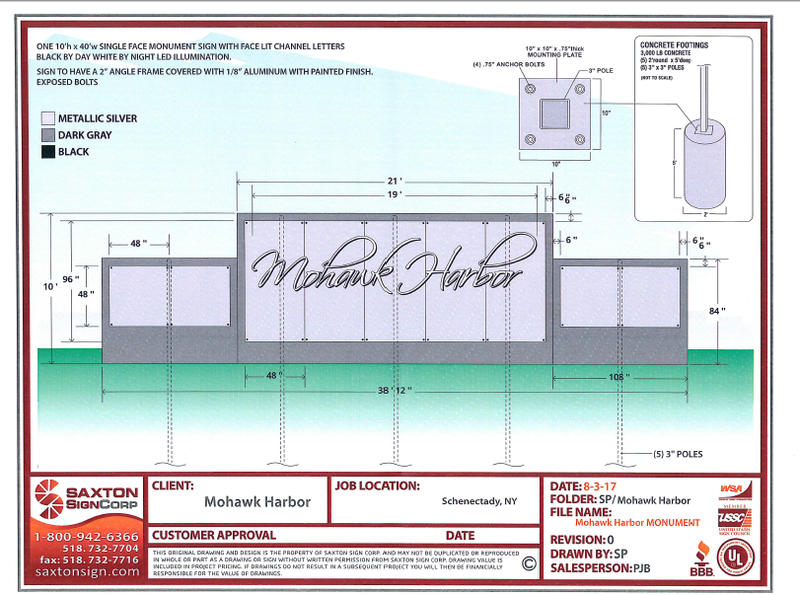 Click here to see the Area Variance Application form at Schenectady’s Zoning Board of Appeals.
. . . proposed “monument sign” for the entryway to Mohawk Harbor Way; click to see the Application. 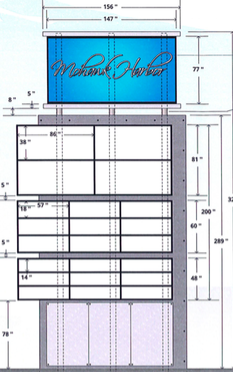 As for the Monument Sign proposed by Maxon Alco Holdings, at 40′ W and 10′ H, it exceeds the 7′ maximum for a freestanding sign in the C-3 district, and with its great width, also greatly exceeds the maximum square footage permitted in Schedule I. 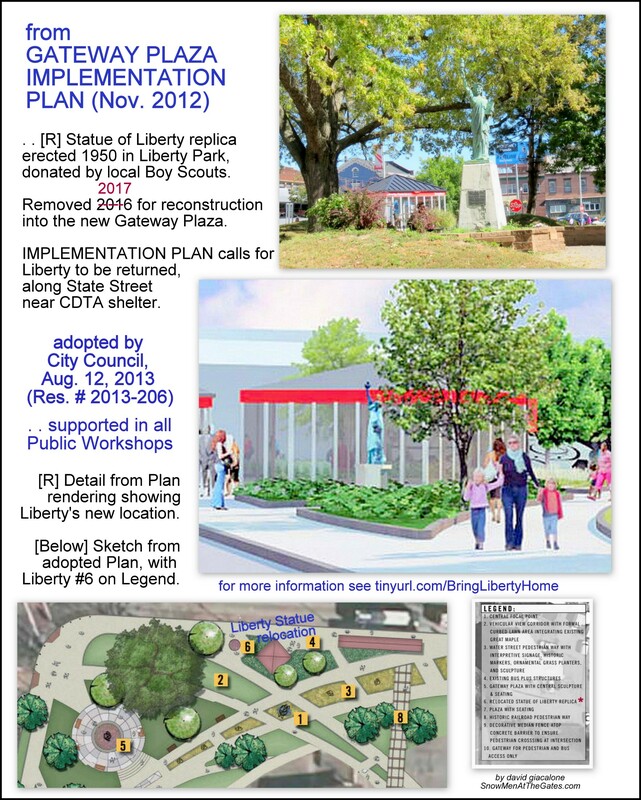 As such, the application belongs before the Zoning Board of Appeals, not the Planning Commission. 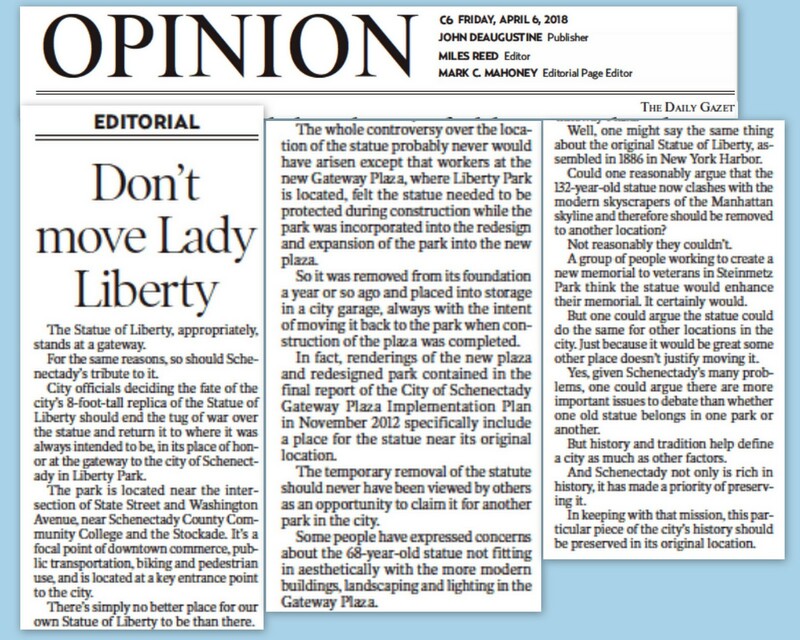 As always, I hope the Planning Commission and the Planning Office will step up and enforce the Schenectady Zoning Code in a manner that preserves public safety, aesthetics, and the general public interest. 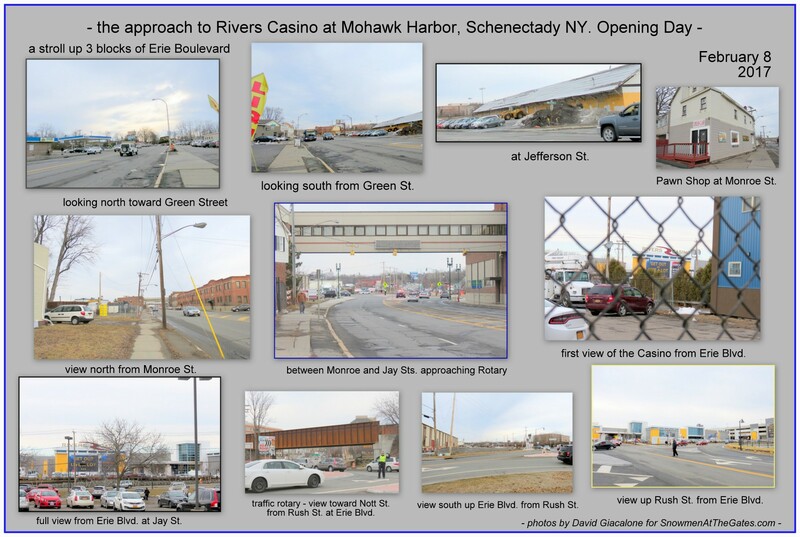 A casino may be a special kind of business that arguably needs extra hoopla and lights and action, or City Hall might have felt two years ago that it must do everything asked of it by the Mohawk Harbor/Casino Gang. 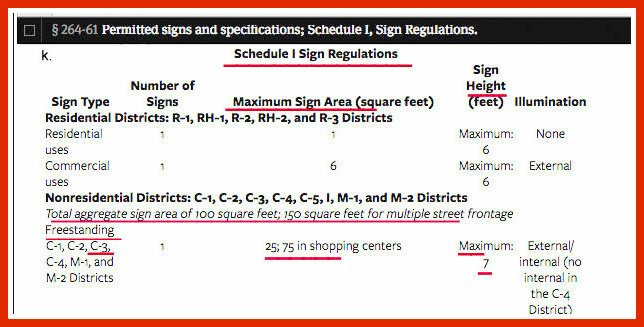 But, there is nothing about condos, office buildings and regular retail and bars that calls for allowing signs multiples larger than other businesses are permitted. §264-61(I)(2). 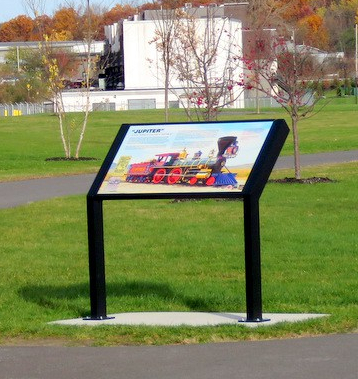 A special use permit must be approved upon a showing by the applicant at a public hearing of the City Planning Commission that the proposed electronic message board shall not substantially impact upon the nature and character of the surrounding neighborhood, upon traffic conditions and any other matters affecting the health, safety and general welfare of the public. 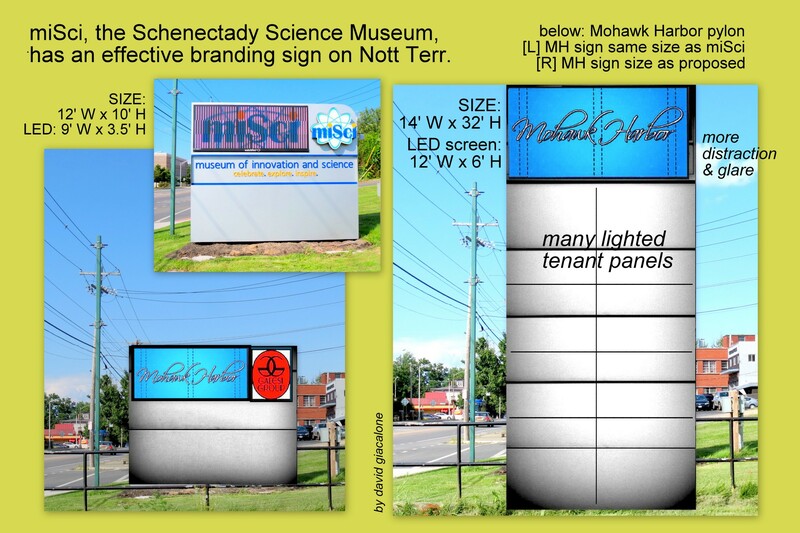 The Times Union posted online this evening (Aug. 4) on the sign requests:”Mohawk sign plan set for Schenectady review” (by Paul Nelson). 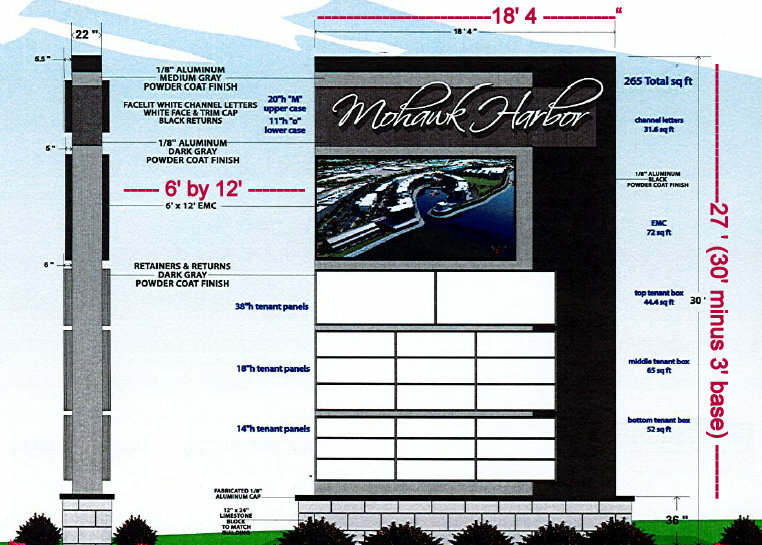 And, the Gazette did, too: “32-foot and 10-foot sign proposed at Mohawk Harbor entrance” (by Brett Samuels). 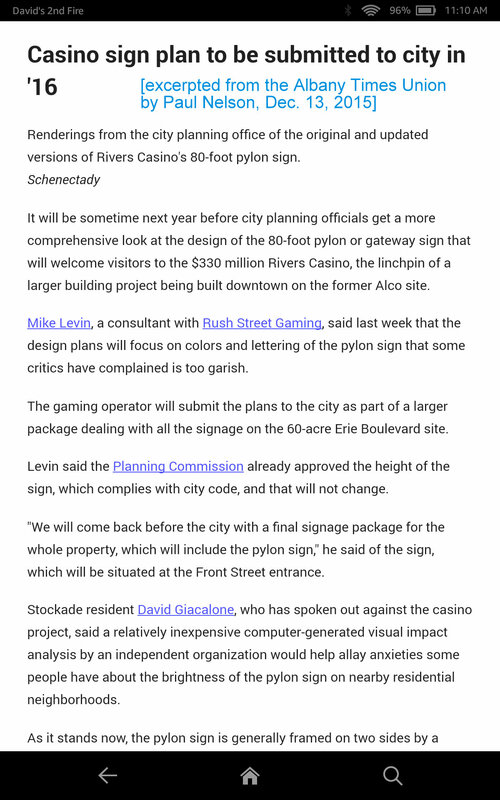 Neither reporter brought up the “non-casino signage” issue that I raised with them before they went to press. 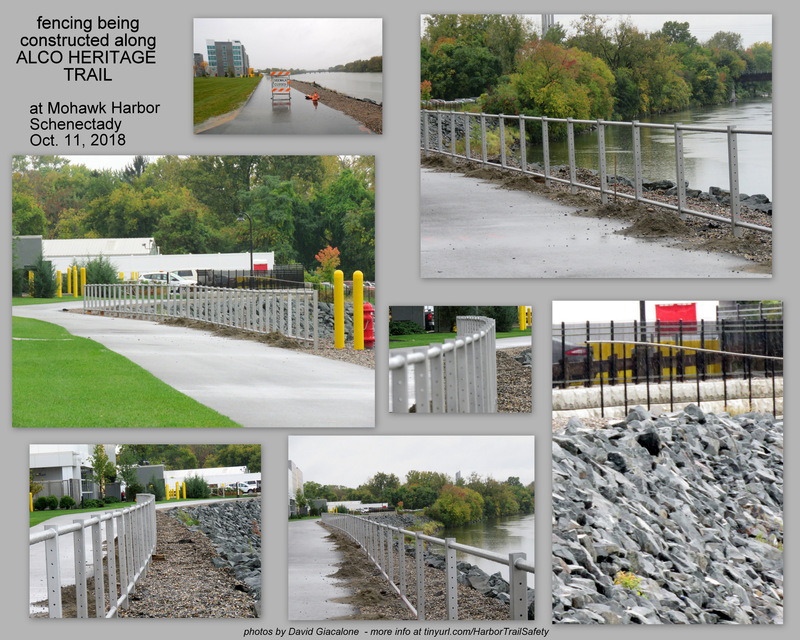 For a Gazette article describing the various segments and phases of the Mohawk Harbor development, with photos and addresses, etc., see Brett Samuels’ piece “Latest on what’s happening at Mohawk Harbor in Schenectady” (June 5, 2017). 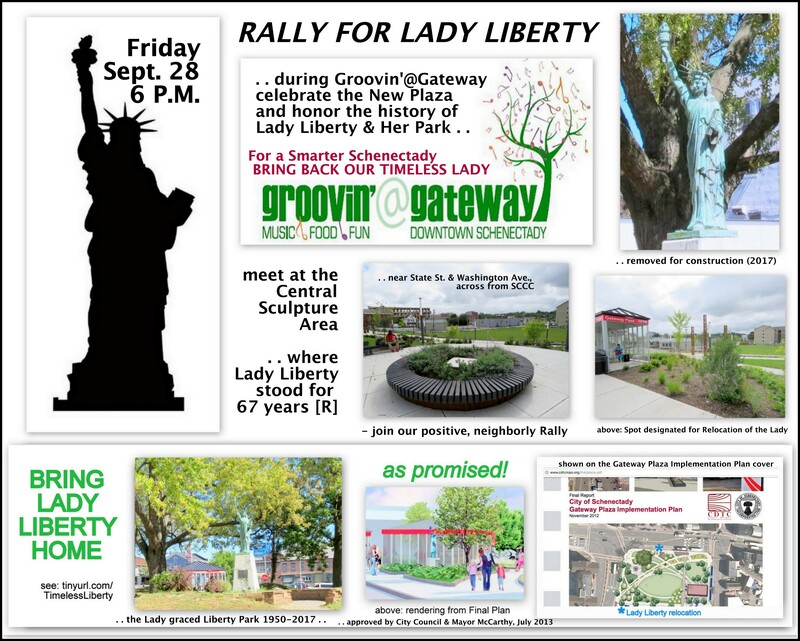 We will keep you apprised as the applications proceed in the Planning Commission, or perhaps Board of Zoning Appeals, process. 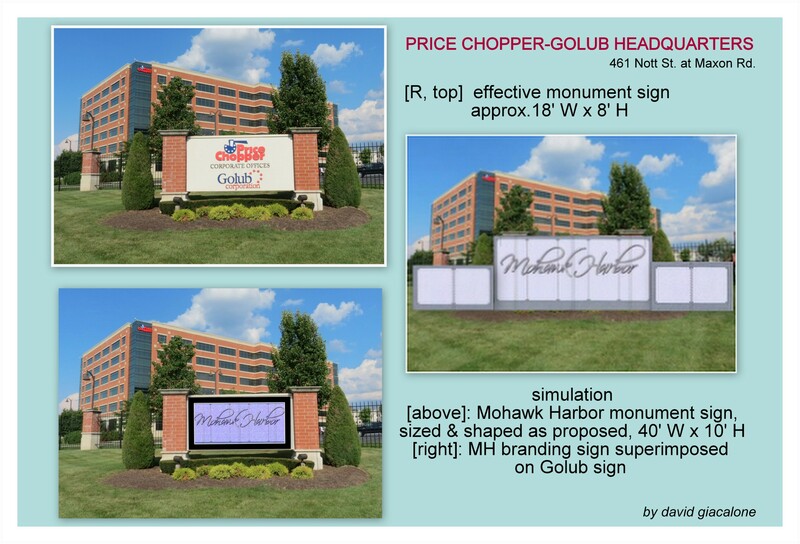 For example, see “update on the proposed Mohawk Harbor signs” (August 11, 2017). 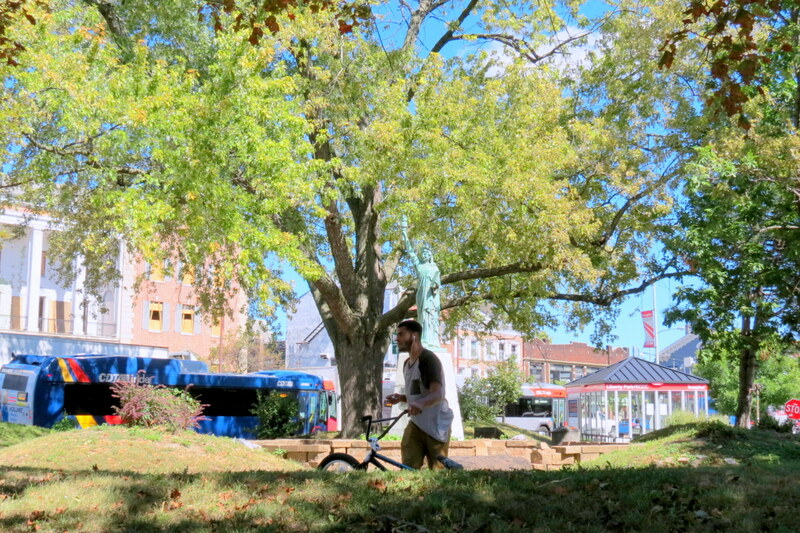 is Bike-Share our newest sacred cow? 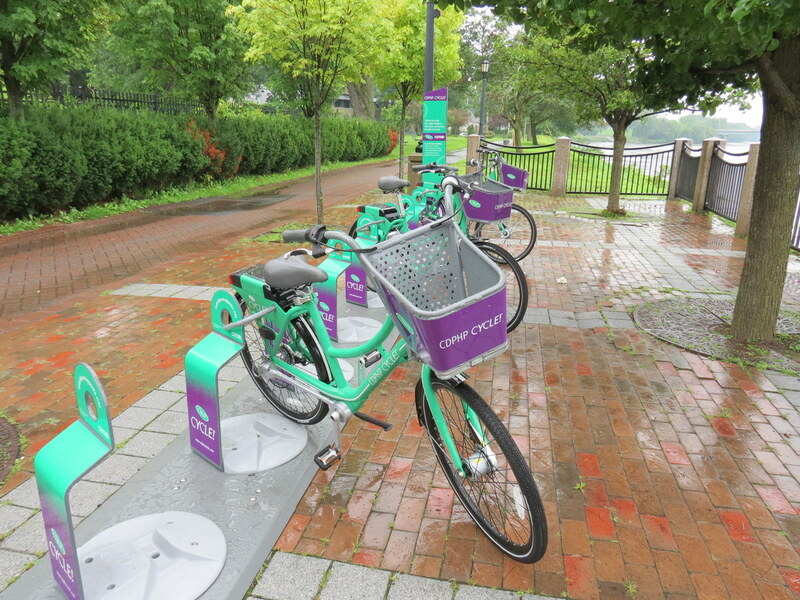 CDPHP’s bike-share program, “CYCLE!”, has apparently been blessed with a trinity of factors that in this century and City most often create sacred cows: It is (1) championed by a political boss or Party; (2) paid for by someone else; and (3) acclaimed as “healthy”. 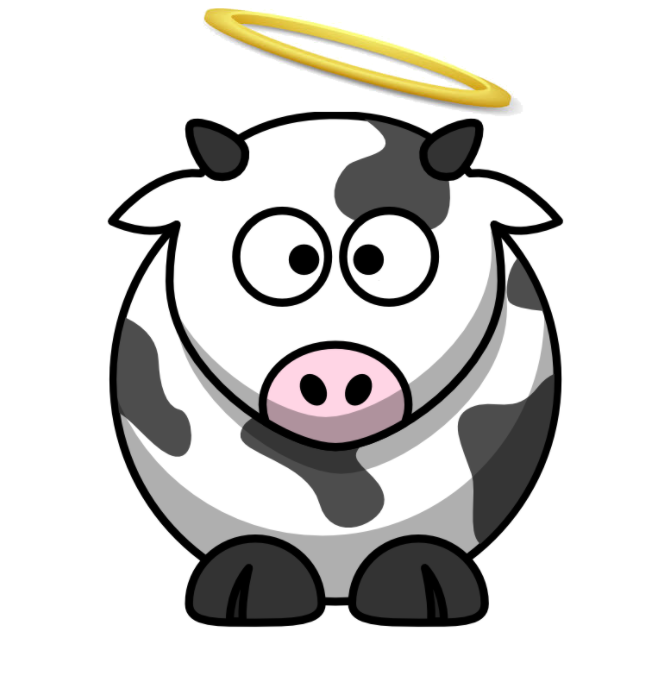 I naturally worried about goring this sacred bovine earlier this week, when I raised concerns to my Stockade neighborhood Yahoo! email list about locating a CYCLE! 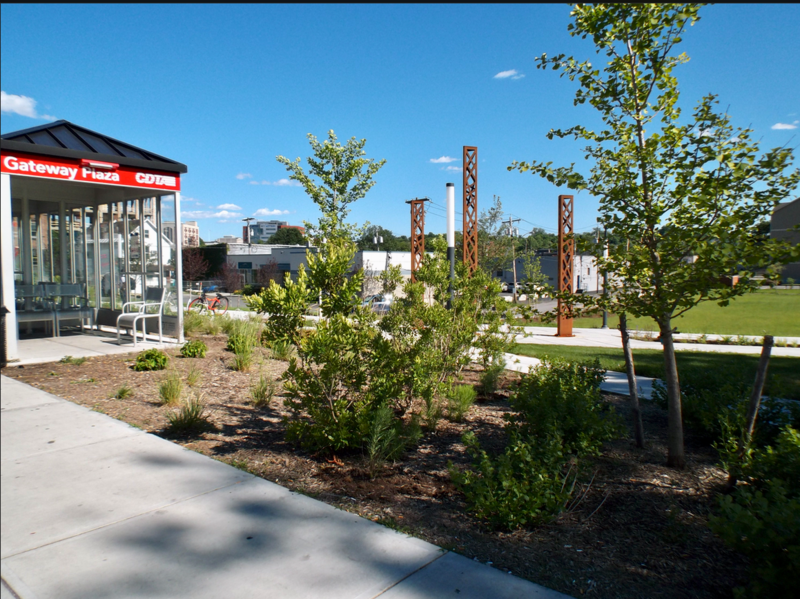 station in Schenectady’s Riverside Park. I pointed out that not only was the hardware for an 8-stall bike-share station attached to our lovely, serene, and expensively built, Overlook/Esplanade, but such a Station seemed to be encouraging use of bicycles on the Park’s only paved path, despite a Municipal Code that appears to restrict cycling on park paths like ours. The reaction was rather lopsided. Maybe I should have added, or dropped a reassuring footnote, that my favorite Christmas present as a child was a red Schwinn bicycle that I used to escape our neighborhood and to deliver newspapers; that I bought another one while away at college; went to Plaine’s Bikes my first week living in Schenectady, almost 30 years ago, and got a hybrid mountain bike; and even in my 60s bought a used bike to enjoy with a friend who loved taking her small grandson on bike trails. Judging by the negative response of my Stockade neighbors, being a mere fan of leisure biking would not have tempered their reaction. What I got was a litany of platitudes about how “nice” the bike-share program is, how healthy cycling is, and how popular it is with younger generations. 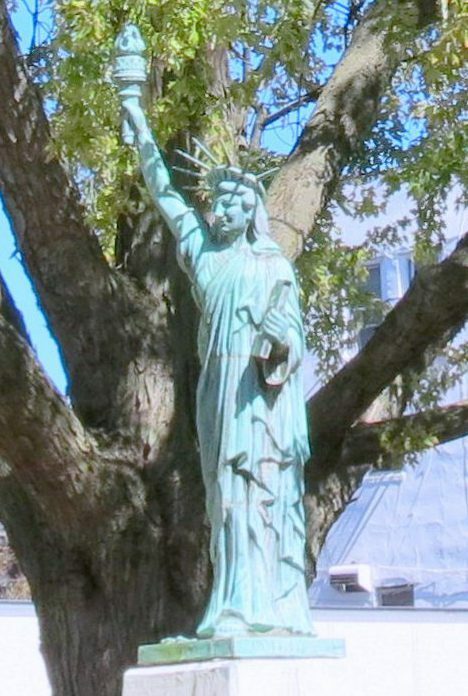 Not only was I nearly excommunicated from the Stockade by Bike Share Believers, but skeptics who I knew were also worried about the safety of pedestrians in Riverside Park were silenced (self-censored) by the fervor for the Program and made not a peep in support of my concerns. 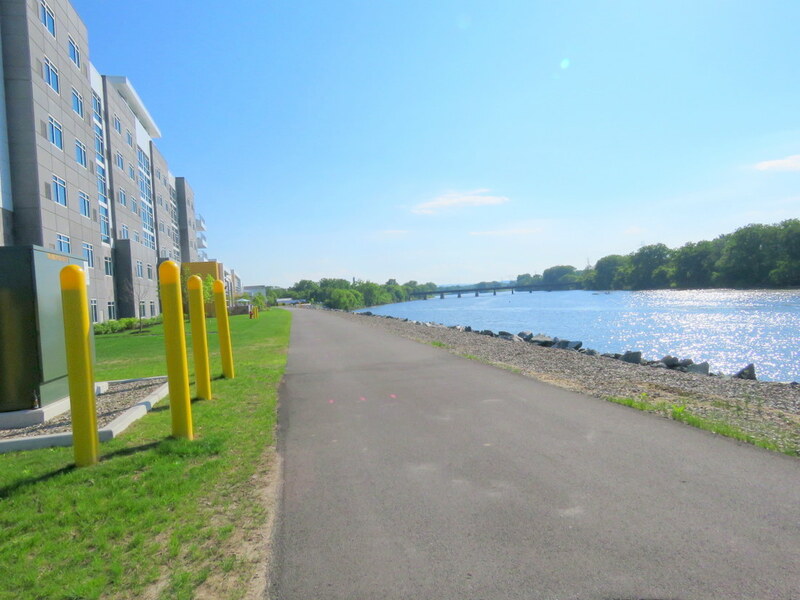 Such indifference perhaps would have silenced many a Schenectady gadfly, but I made the “mistake” of going downtown yesterday (Wednesday), where I saw the “Proctor’s-area” CYCLE! station and the Central Library station, and I knew I needed to continue a campaign that asked just how the particular locations were chosen, and if they were sanctioned (blessed) by anyone in authority at our City Hall. Feeling that the first three CYCLE! 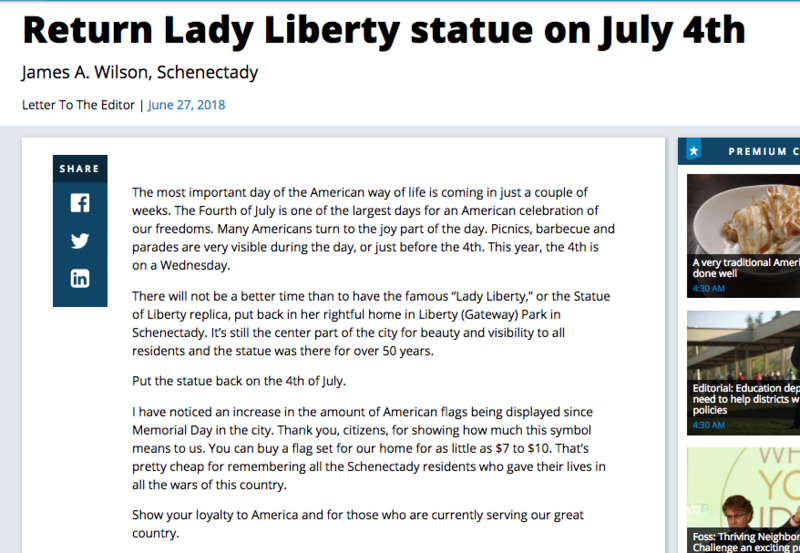 stations I visited in Schenectady were in poorly-chosen locations, and that the safety and convenience of many Schenectady residents and visitors were inadequately considered, I wrote the following email message (dated July 26, 2017) to City Leaders and the press. [click here for a pdf version of that email, including attachments] I will forego any additional comments at this point, but ask that you leave your own (hopefully, civil and thoughtful) comments in our Comment box. Thank you. 1. 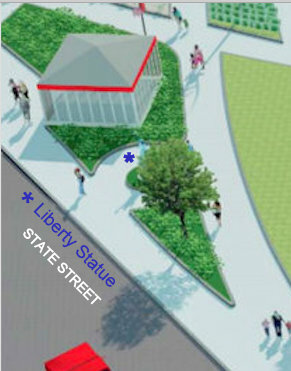 They put a station “near Proctor’s”, that is actually across State street at the end of the Jay Street Pedestrian Walkway (see 1st attachment). 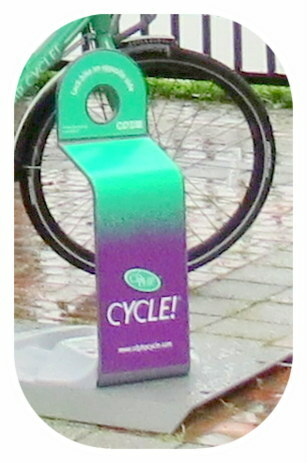 Two problems: (a) Bike-Share patrons will be obtaining and returning the CHPHP green bicycles at the end of a block where bicycles are specifically banned in the Municipal Code, with appropriate signage at each end. 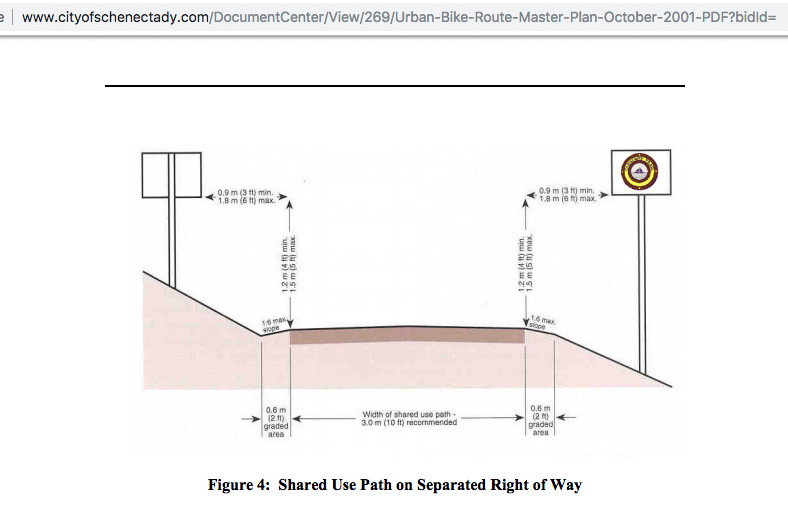 (see 2nd attachment); (b) cyclists will be maneuvering their bikes (hopefully walking, not riding) either on the sidewalk of the busiest pedestrian block in the City, or on the roadway that is one of the zaniest, most hazardous blocks for driving, parking, crossing, letting out and picking up Proctor’s audience members, and otherwise traversing in the City. 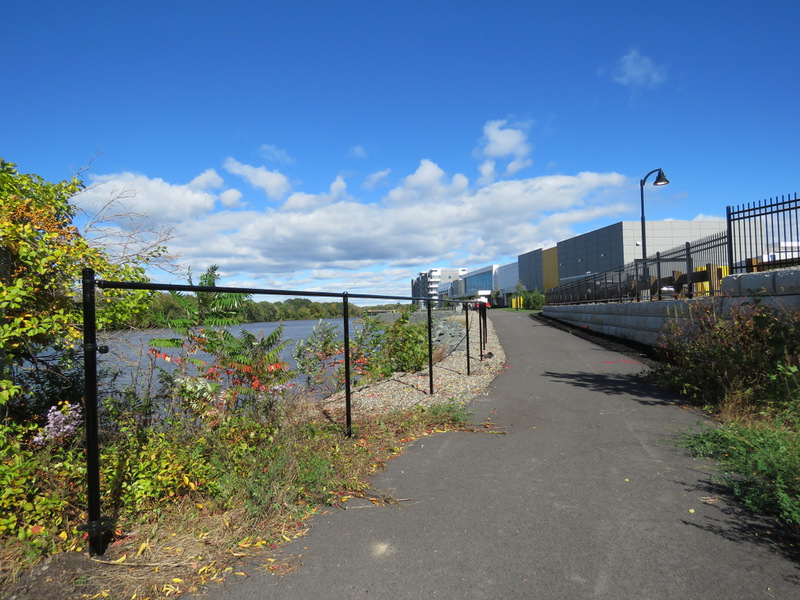 Doesn’t behind Proctor’s make more sense, or on one of the City’s downtown parking lots? 2. 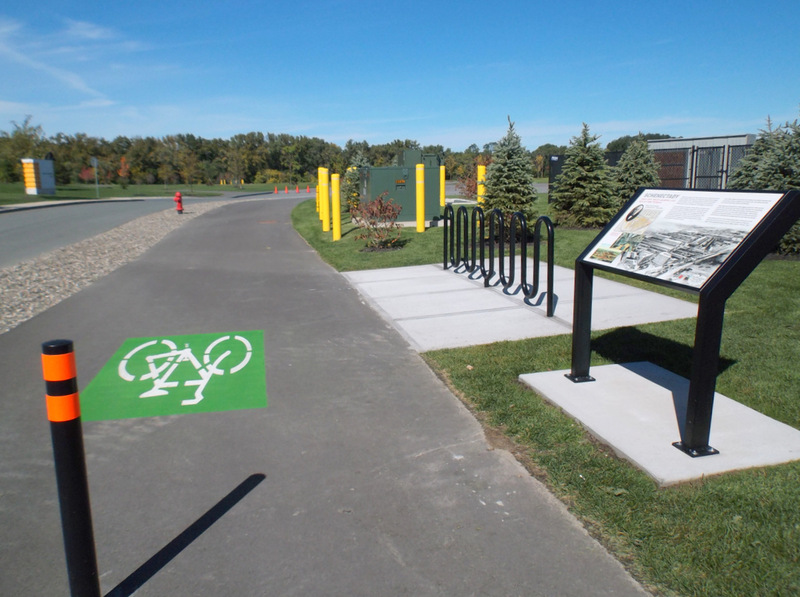 They put a station at Riverside Park (which Bike-Share calls Riverfront Park). 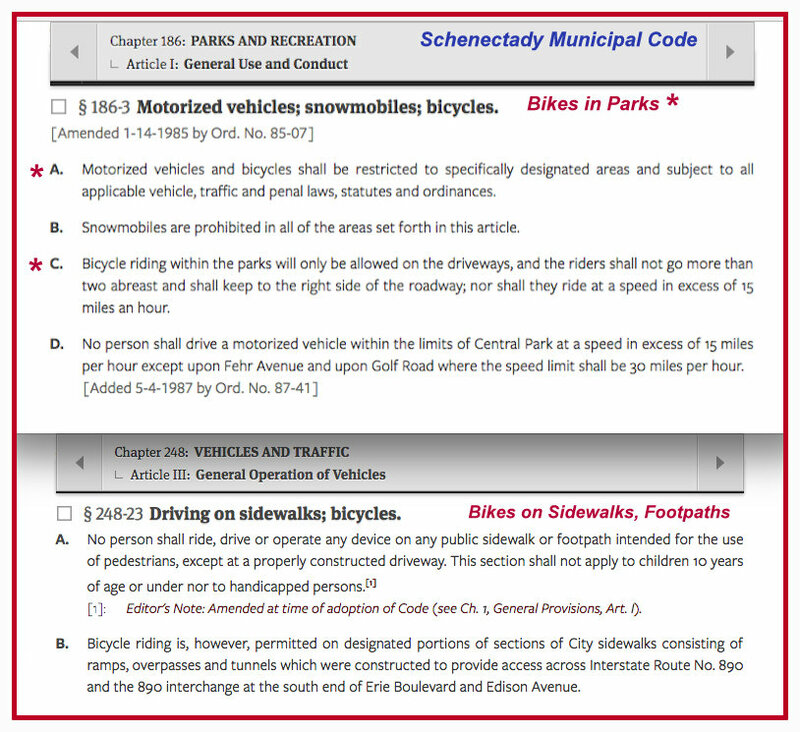 Two problems: (a) as the BikeSchenectady master plan affirms, the Municipal Code does not permit bicycles on (most) City Park paths, and would need to be changed to allow bikes access to park paths (see 3rd attachment); placement at the Park encourages using the only path in Riverside Park for cycling, interfering with current users of many kinds, and raising liability issues; and (b) with 6 acres to choose from, they place it on the most expensive real estate in the Park — the specially designed Overlook (a/k/a Esplanade), with its quiet space, and fancy pavers and brick. 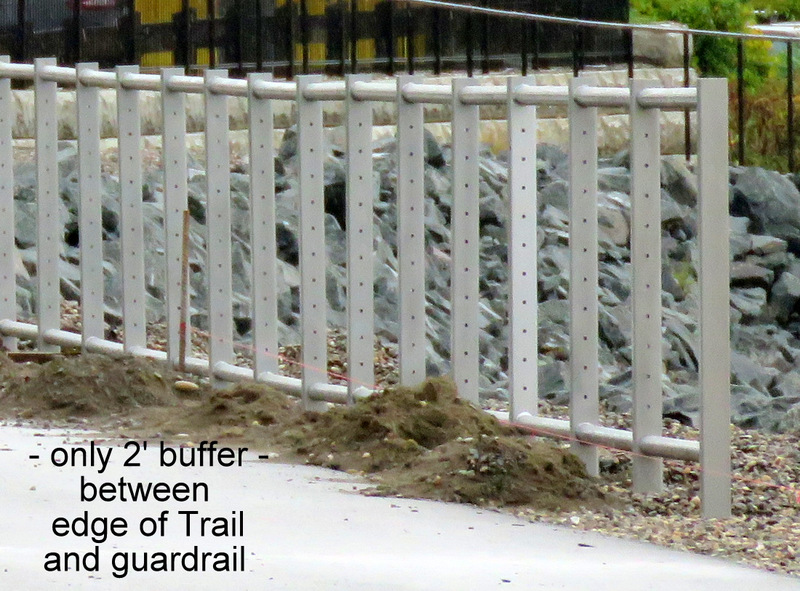 See 4th attachment). 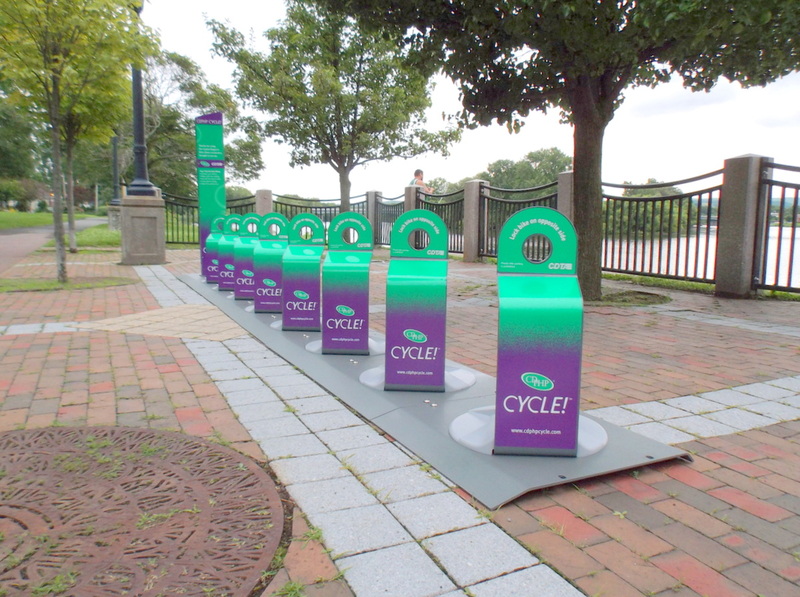 With 8 bikes parked at the Riverside Park Bike Share station, a large percentage of the Overlook will be commandeered and lose much of its quiet grace. 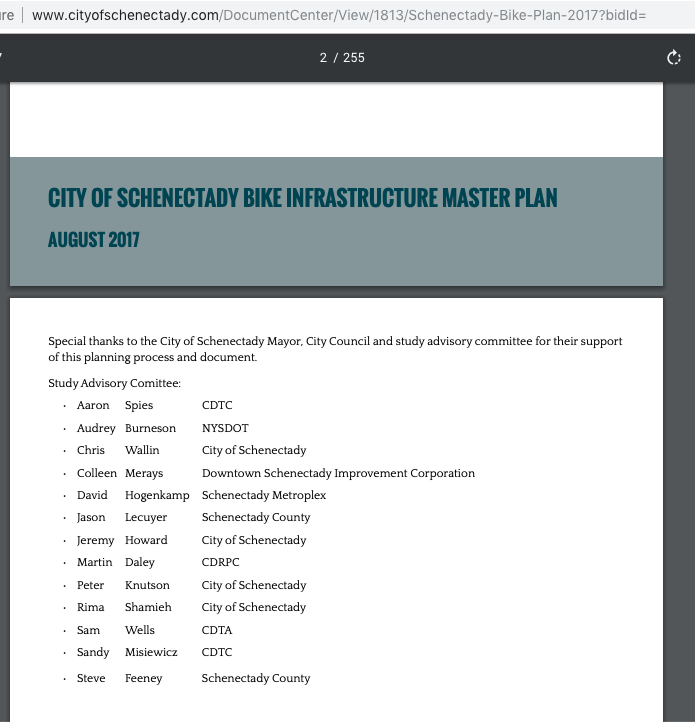 follow-up (Aug. 2, 2017): I discovered yesterday that the draft of the Bike Schenectady plan issued last month has an Appendix on the topic of bike sharing. 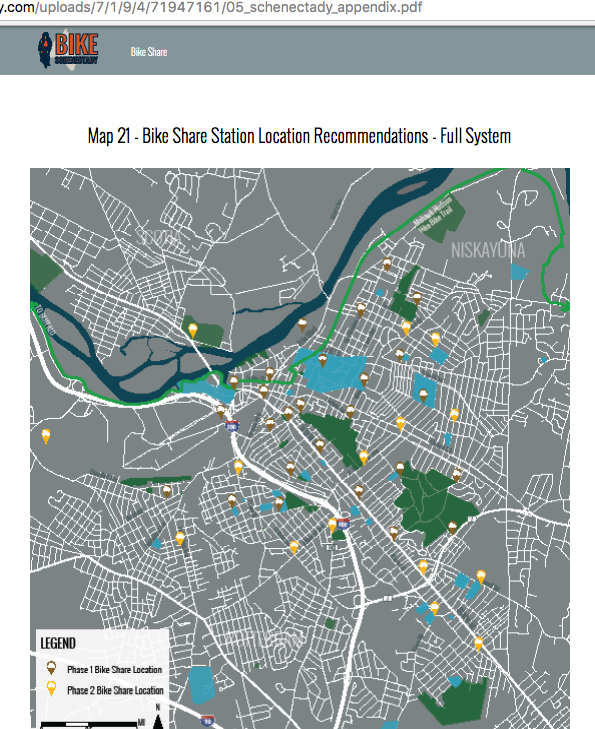 Appendix C lists recommendations for bike share stations in Schenectady, and neither Phase 1 or Phase 2 has a proposed station at Riverside Park. 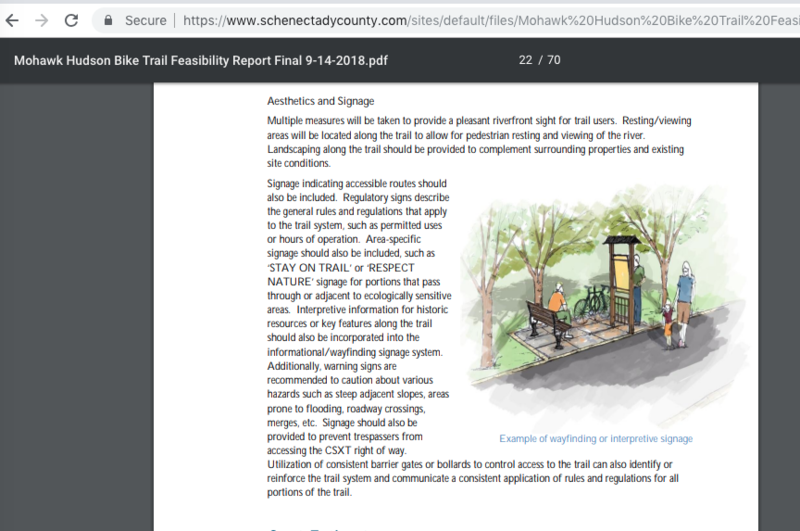 Click on the thumbnail to the left of this blurb for the full-system bike share map recommended by Bike Schenectady, which shows no such station in Riverside Park. 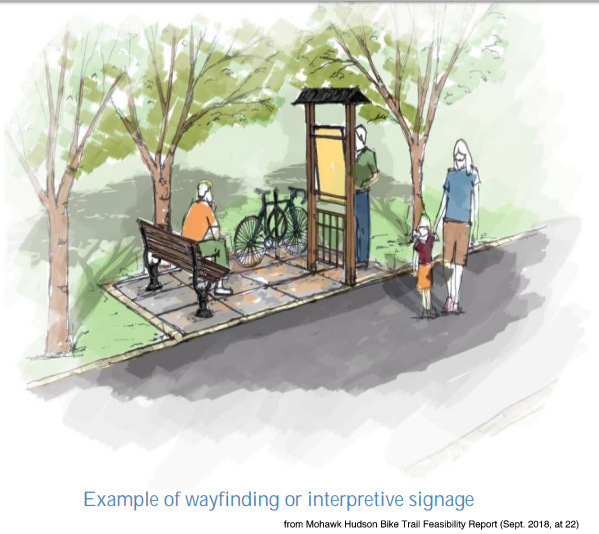 The discussion mentions that Commuters and Tourists are most likely to use bike-share and suggests that stations should be placed to serve such folks. 3. 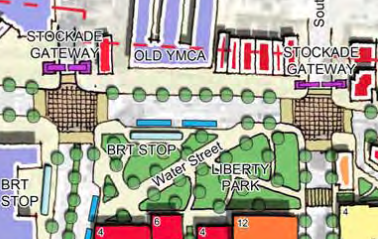 They put a station at the Central County Library, which has a large parking lot and wide space alongside the building. 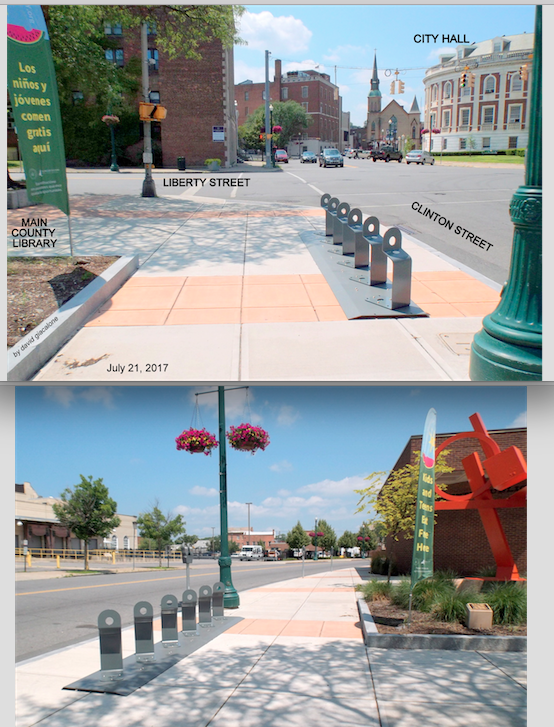 Nonetheless, the rack is not out of the way, but is instead taking up space right at Clinton and Liberty Streets, so close to the curb, that passengers in cars at the curb on Clinton Street might not be able to open their doors, and sidewalk space is narrowed. 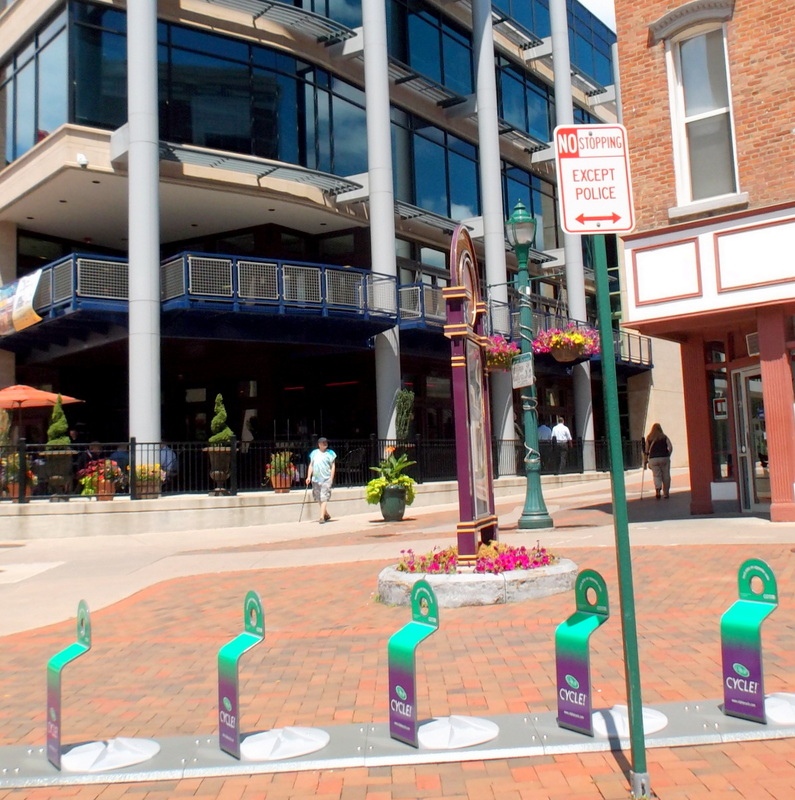 (see 5th attachment) follow-up (Aug. 2, 2017): I did a little experiment of my own to see if passengers trying to exit the legal parking space alongside the Library bike-share station could readily do so. 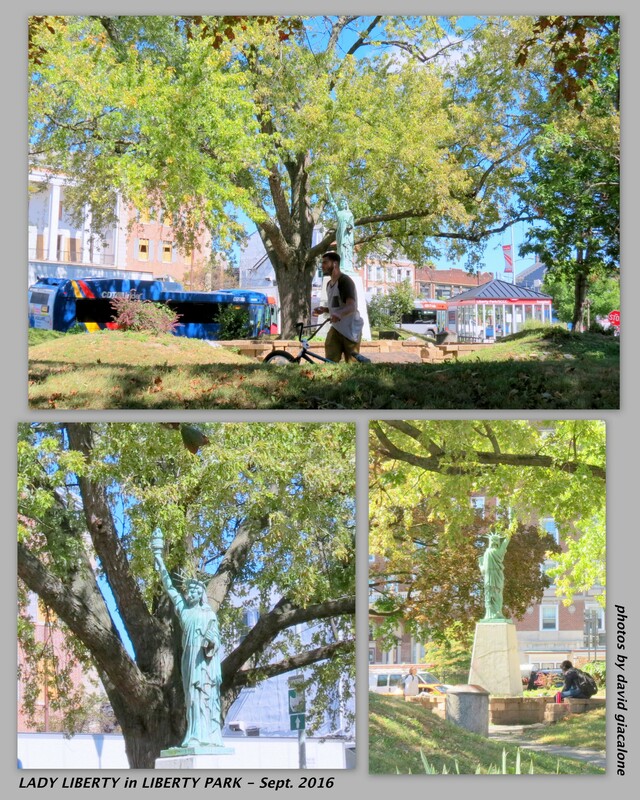 See photo to the right and two others added to the Slideshow. 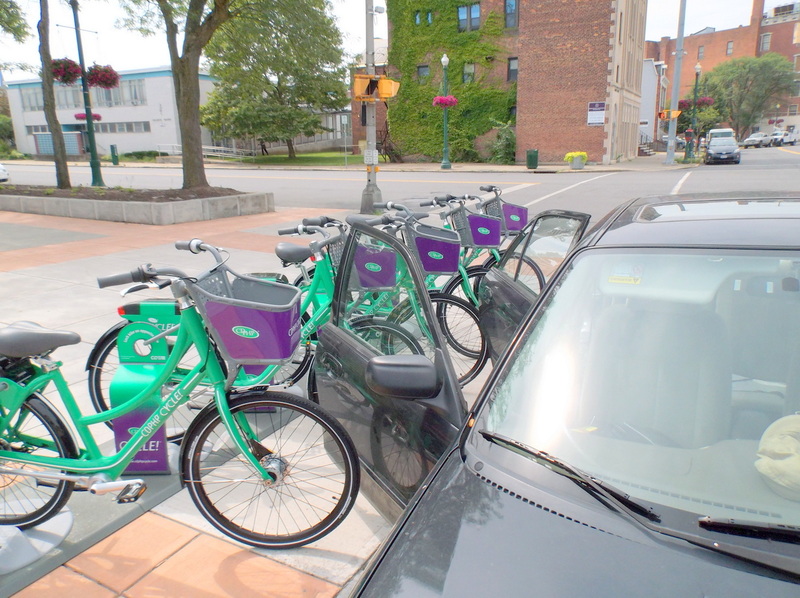 I understand the virtues of a program like Bike-Share, but that should not mean the program cannot be criticized, and does not have to be monitored to assure the safety and convenience of pedestrians, park users, and other traveling our streets. 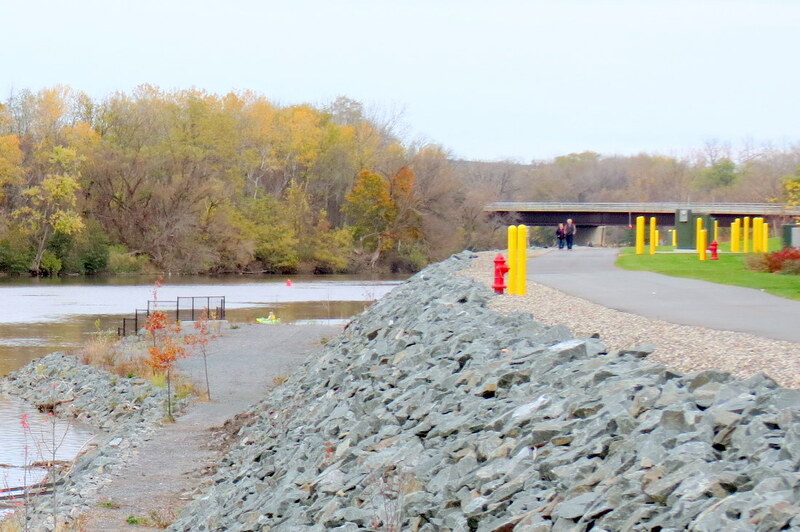 . . above: Riverside Park CDPHP CYCLE! 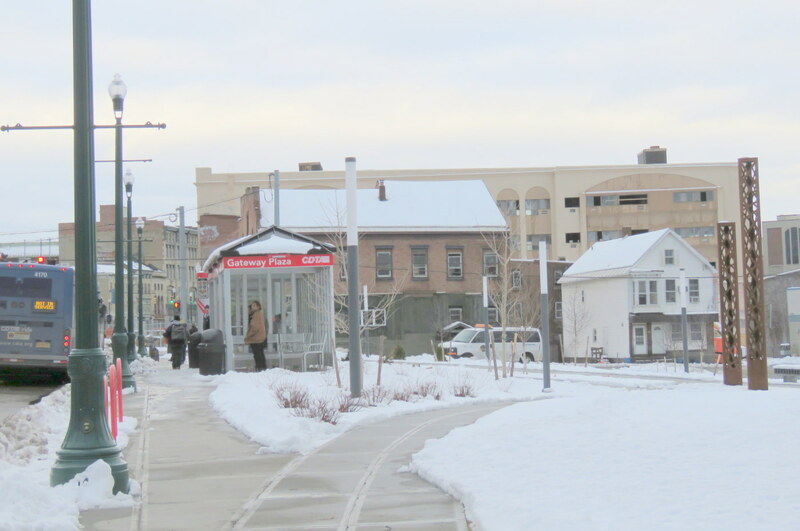 Station, on the Overlook-Esplanade at the end of North Ferry Street, first day of operation, July 27, 2017 . . 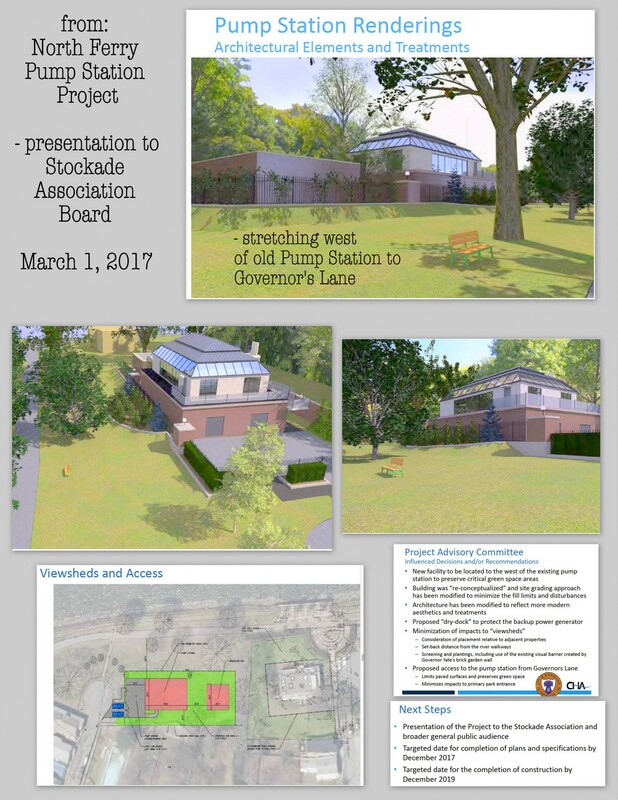 Please Note (Monday, May 3, 2017): For a detailed summary of the May 2 informational meeting on the Project, see our post “strong, thoughtful opposition to pump station in the park” (May 3, 2017). 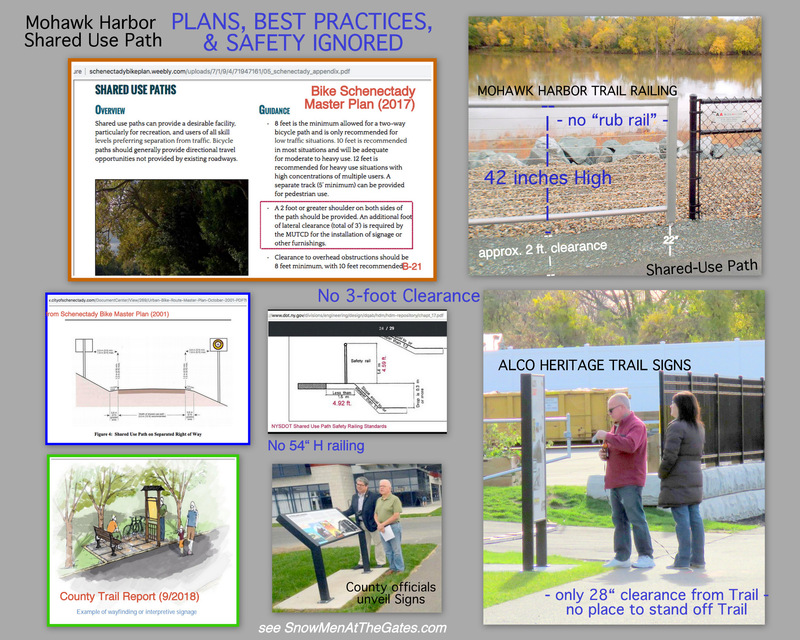 Click this link to see the 25-page Presentation to the Stockade Association Board of the proposed North Ferry Pump Station Project, given on March 1, 2017, by architect Frank Gilmore and CHA’s lead engineer Mike Miller. 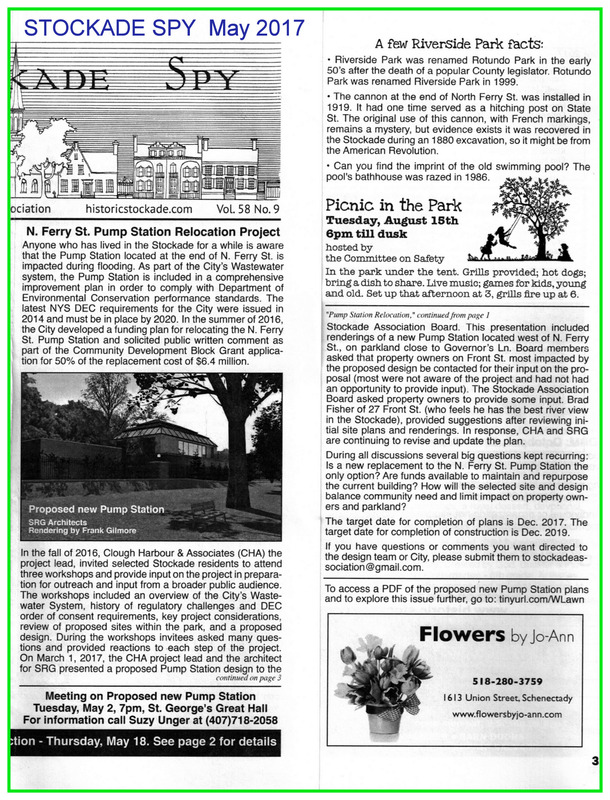 And, click this link for treatment of the Pump Station in the May 2017 Stockade Spy. 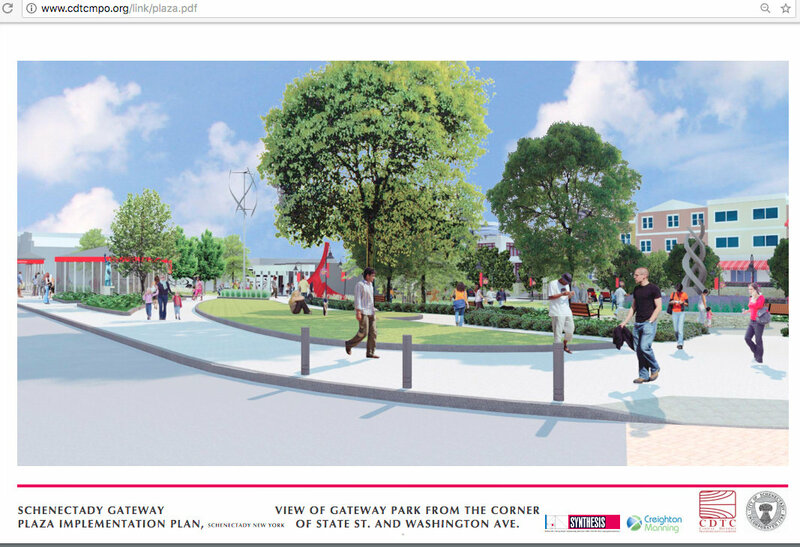 . . above: [L] the West Lawn of Riverside Park; [R] a rendering (from March 1 Presentation to SA Board) of a proposed pump station to be located on the West Lawn. 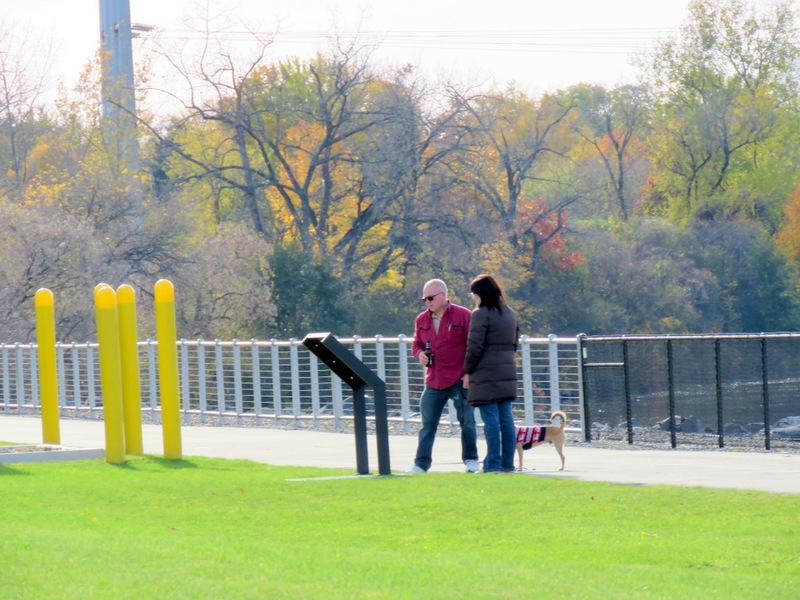 . . For many more photo images, please see “the at-risk West Lawn of Riverside Park” . . 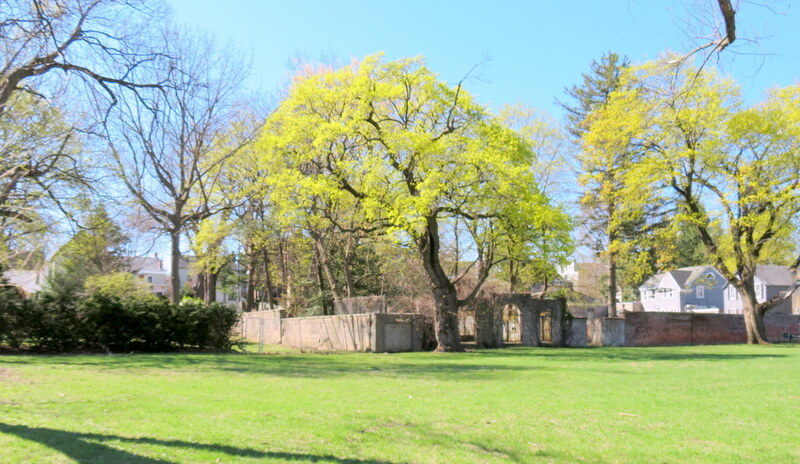 When presented months ago with the Renderings of the New Pump Station Project there was NO OTHER PROPER RESPONSE FOR THE BOARD of an Association chartered to protect and preserve the residential nature of the Stockade, than to say “NOT IN OUR PARK” and “NOT BLOCKING the VIEWS of and from Stockade properties”. 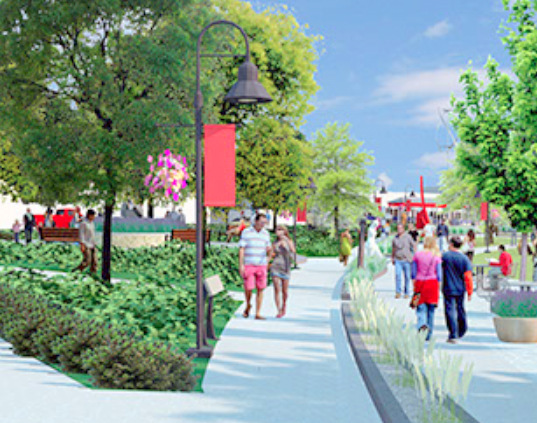 That is even more imperative when the Objectives stated in the SA Constitution and By-Laws include “Development and improvement of the riverfront area”; Protection of historic properties [including their economic value]; and the Promotion of safety and the “aesthetic and physical improvement of the neighborhood”. 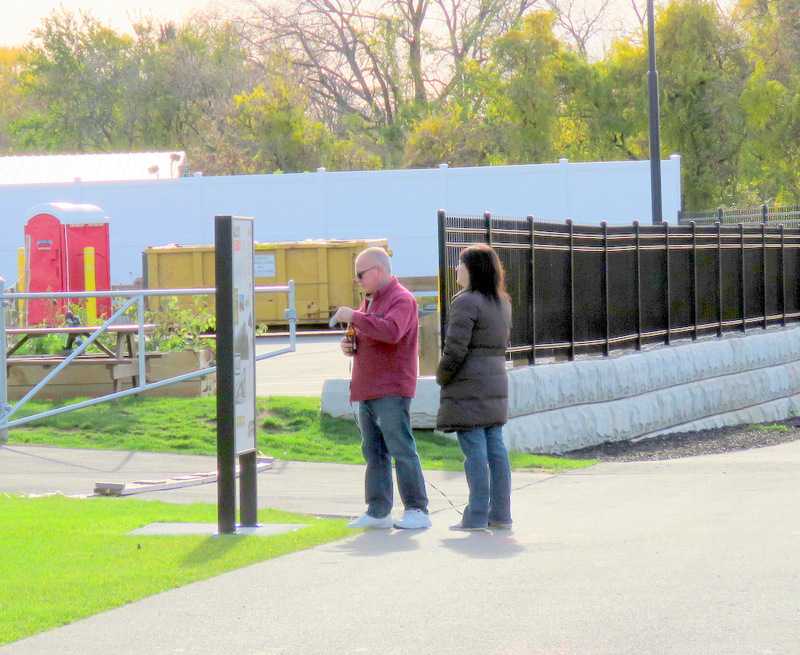 It does not take an engineer to know that a new pump station is totally inappropriate in Riverside Park, a small gem of a Park, with very limited lawn space. 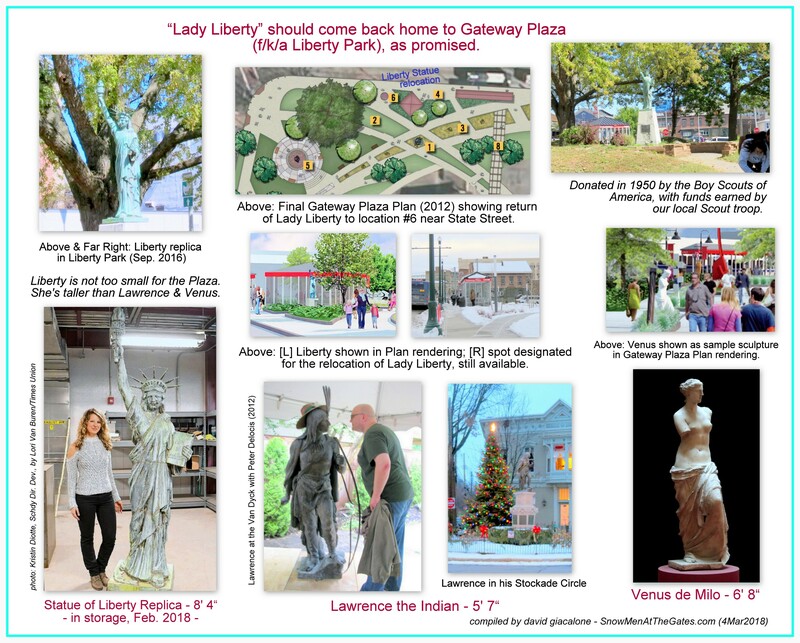 Our job — as residents, owners, and lovers of the Stockade, as well as the Board and the entire Association — is to say “NO! NOT IN OUR PARK! 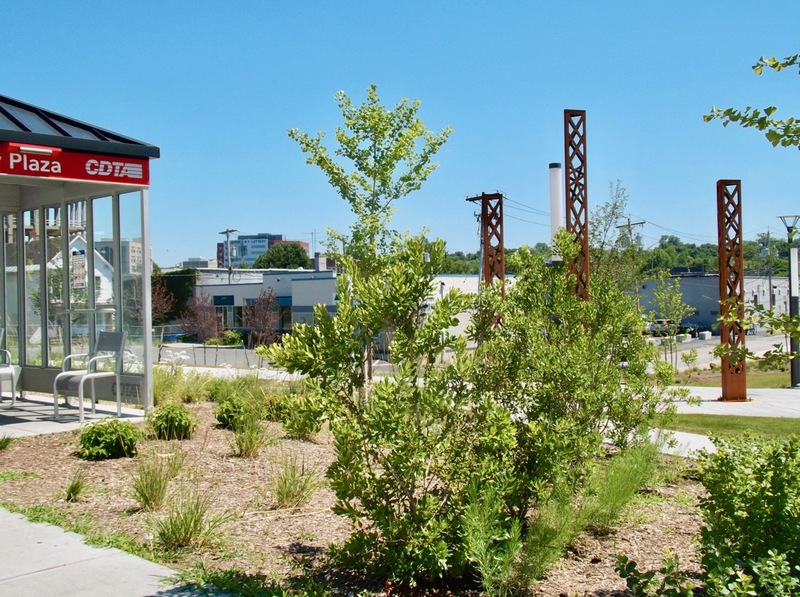 FIND ANOTHER SOLUTION.” The job of the City and its experts is to find a solution that meets the wastewater requirements of the City and State, or prove beyond any reasonable doubt that the new Station must swallow up part of the Park and destroy the Stockade viewshed. Delay This! 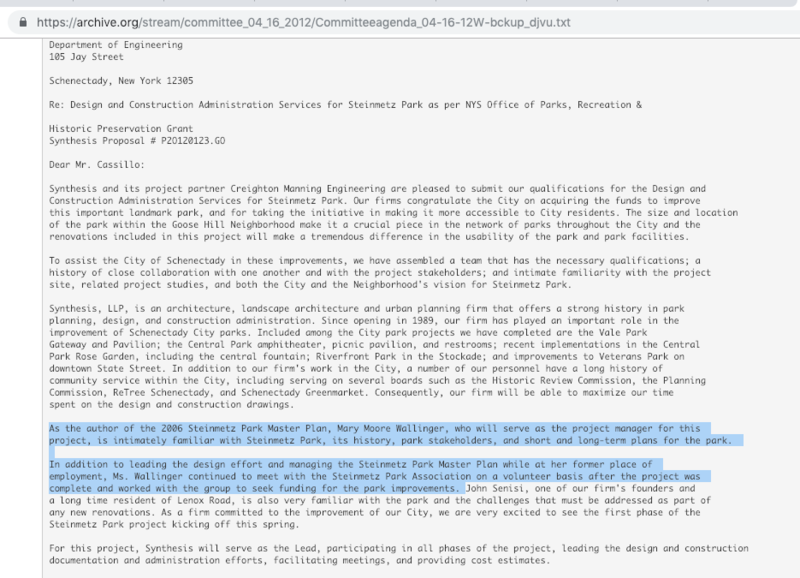 By not alerting the neighborhood of the project proposals that were presented months ago to the Advisory Committee and then the SA Board, the Board has played into the hands of the City, its lawyers, and the project proponents, who will surely use a purported lack of time for complying with its agreement with the State as an excuse for not finding a suitable alternative. 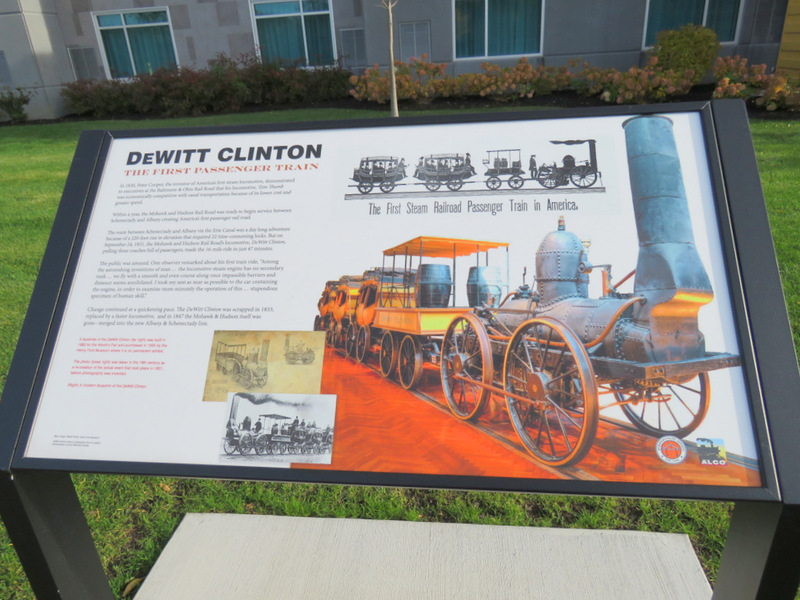 The Board members’ job was not to wait around for fine-tuning or the eventual unveiling by the proponents, so that they could say that comments were addressed, and a shrub or two was added or window glare reduced. Their job was to sound the alert that the quality of life in the Stockade was being threatened. An SA officer or Board Member, or candidate for those positions, who does not agree with one or more of the points above should declare their disagreement and give reasons. 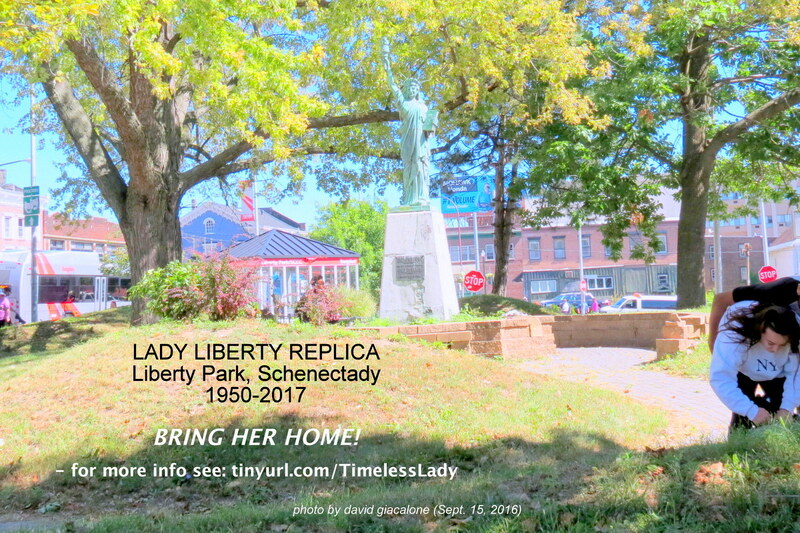 You can find photos of the endangered West Lawn of Riverside Park, and images of the Renderings, at “suns along the Mohawk”, at http://tinyurl.com/WLawn . On a personal note, I must say that it is a relief to have others raising, in public and forcefully, issues that I have been addressing, and more. 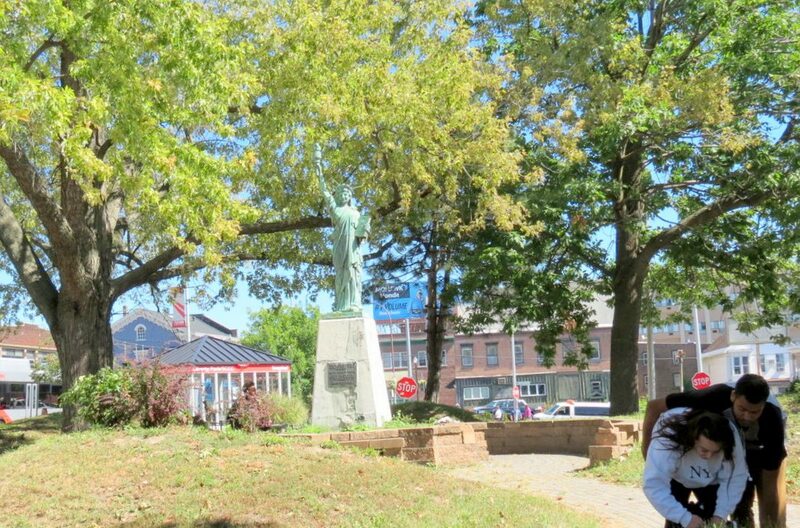 We cannot hope to protect the Stockade by playing (silent and minor) partners to so-called Partners in Progress at City Hall. Advocates need to advocate avidly to achieve their goals, and to be respected by politicians. 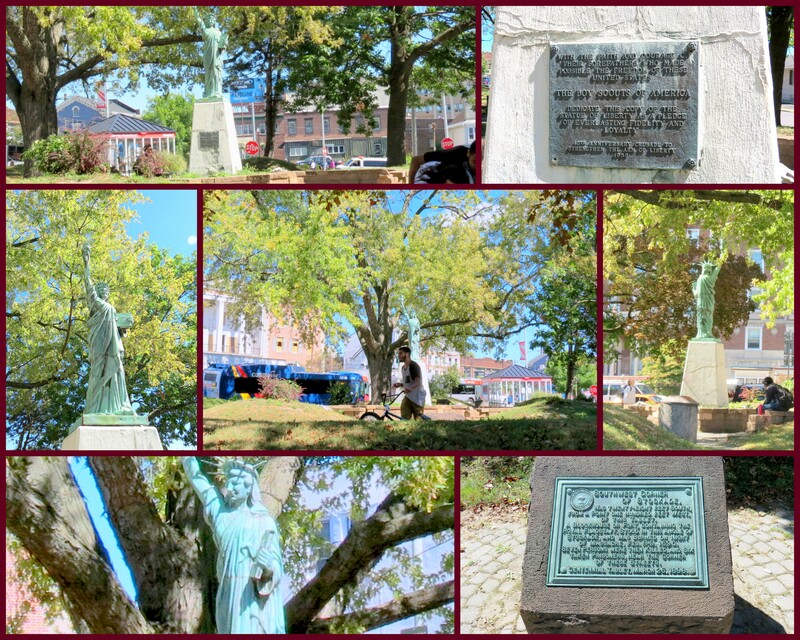 And, we need to use all the available means of communication, such as email and the Stockade Association website, to keep the Stockade neighborhood informed ofnimportant matters. Thanks for taking the time to consider these points. 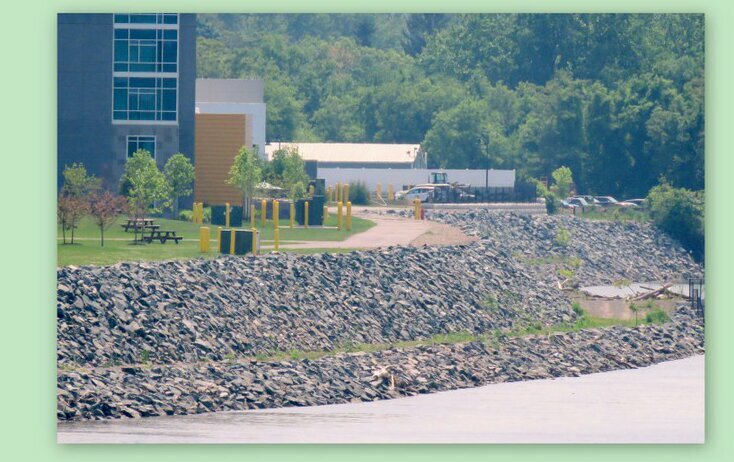 Please plan to attend the public presentation by CHA of its Pump Station Project on May 2, I hope we can be told the location and time ASAP. at 7 PM at St. George’s. 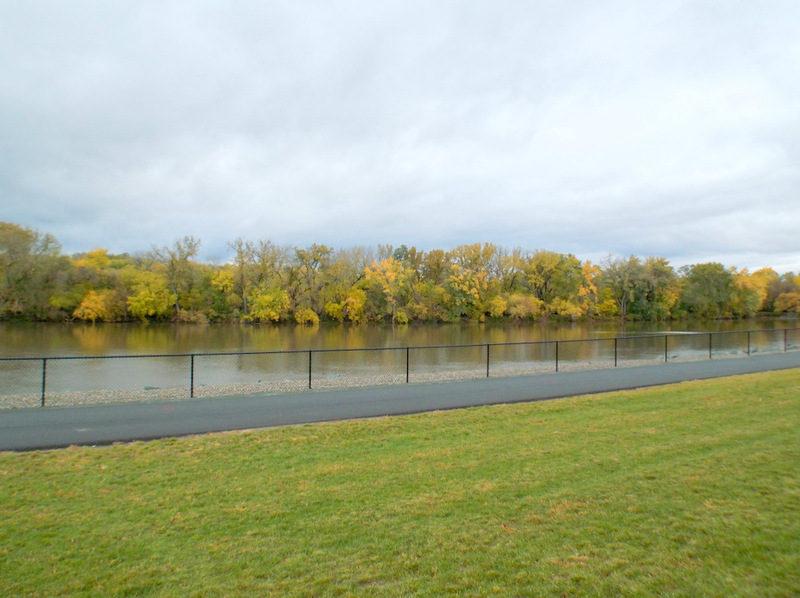 What’s So Special About Riverside Park? 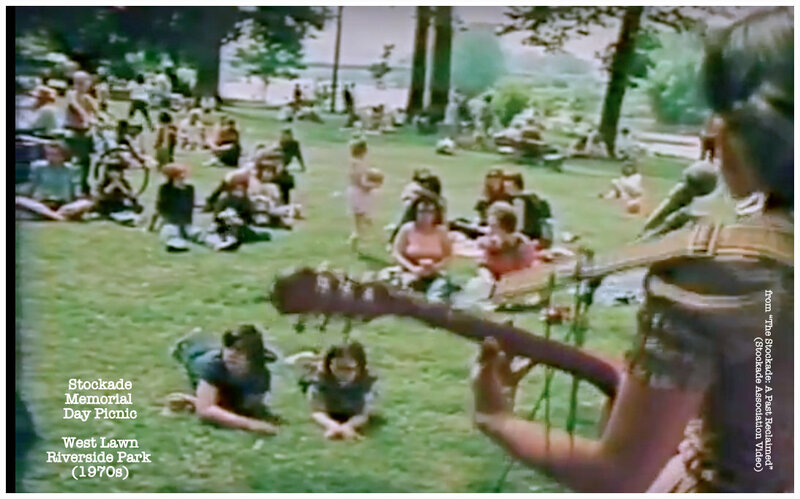 Please see “the at-risk West Lawn of Riverside Park” at our sister site, “suns along the Mohawk”. 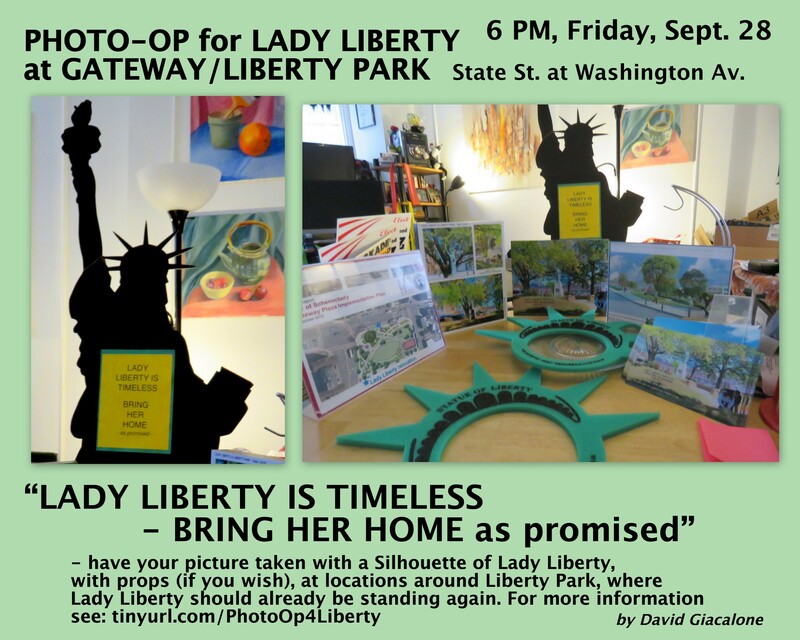 Who is protecting our Park and neighborhood? More discussion coming soon [update (April 27, 2017) see “Not In Our Park!”]. . . 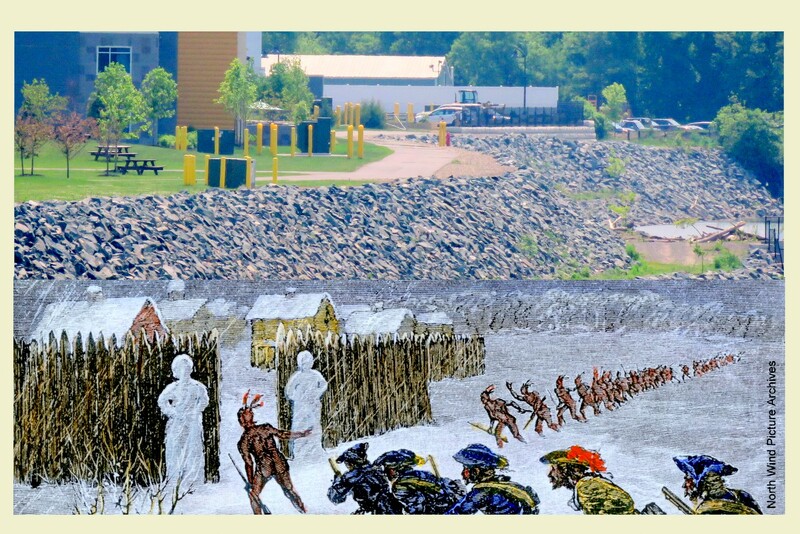 This image of a snowman sentinel on the West Lawn, as seen from the rear of 29 1/2 Front Street, is now randomly used above as our header, alternating with our primary Snowmen at the Gates image. . . a view of the West Lawn, Sunday morning, April 23, 2017 . .
where did this unattractive Schenectady casino design come from? 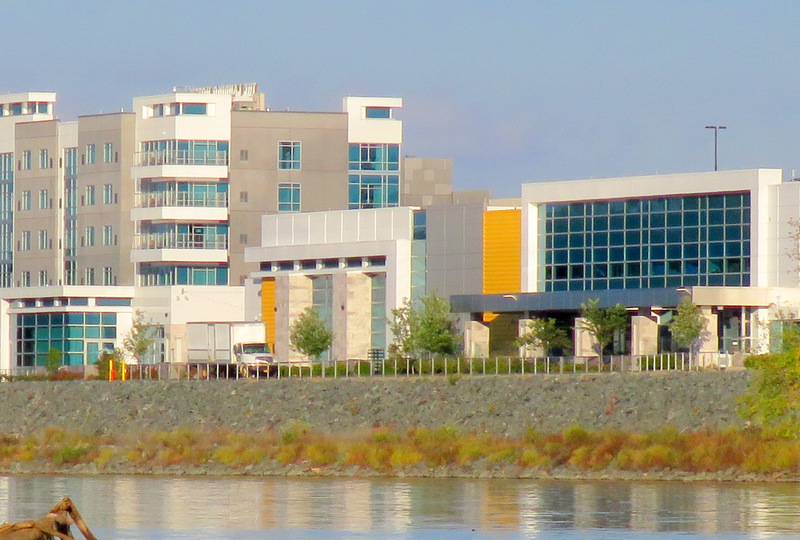 Despite weeks of fawning coverage and cheerleading by local broadcast, internet, and print media, I have yet to hear or read any praise for the exterior design of Rivers Casino at Mohawk Harbor in Schenectady. Nor any questions on why it looks so different from the design we thought we were getting in July 2015. 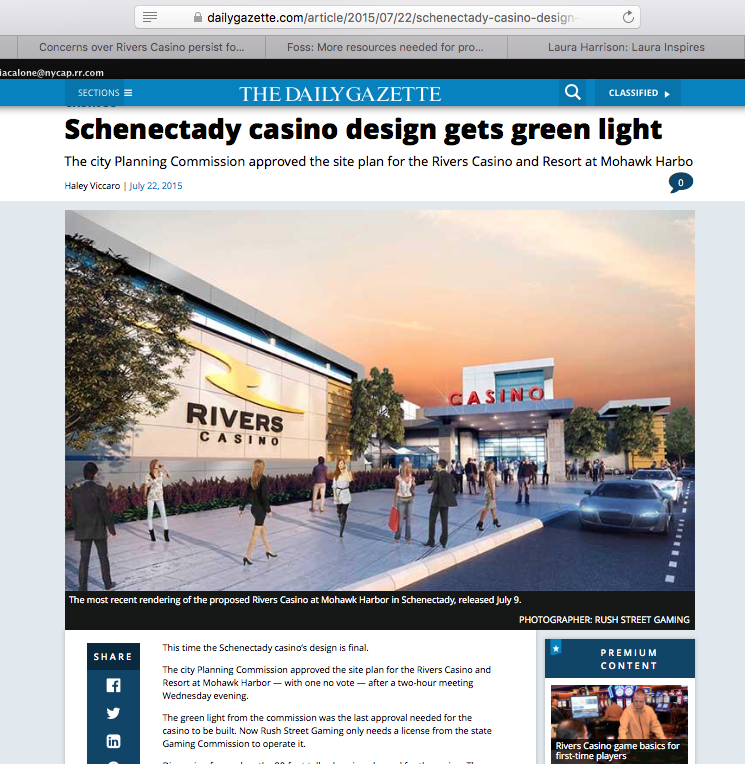 And, unless you count this website, no one in the media has attempted as of yet to put a name to the “style” of the façade presented by Rivers Casino to the world, which is very likely to become the new image of Schenectady, and which for my money doesn’t meet the aesthetic standards of a Sonic Drive-in. 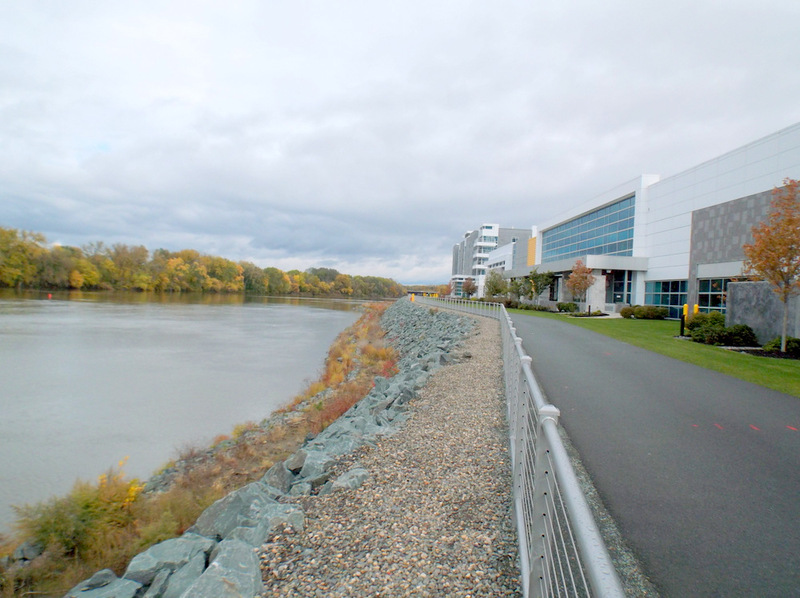 The drawings released Thursday show little of the building other than the entrance and one shot from the river. 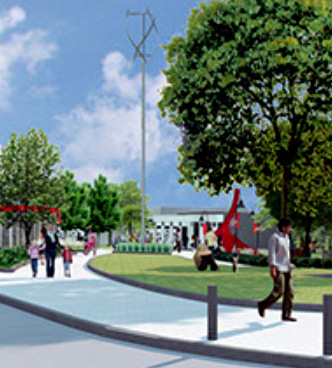 They also don’t show the perspective of the pylon sign in comparison to the new structure. It might seem nit-picky to want to see more. 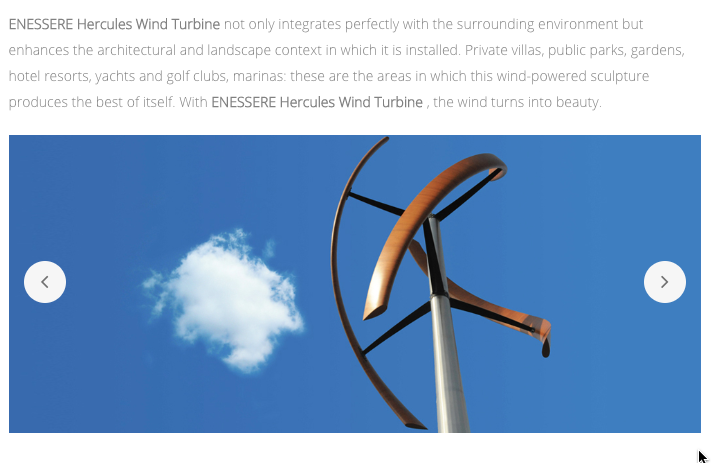 But as we’ve said before, we’re all going to have to live with this thing for a few decades, and we want to make sure it’s going to look like what they say it’s going to look like. 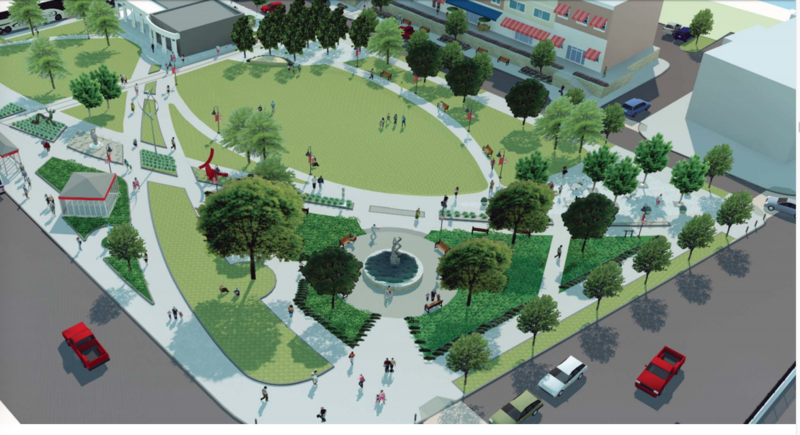 If the public is going to offer intelligent comments to the Planning Commission, they need to see more of the new design so they have a more complete perspective. 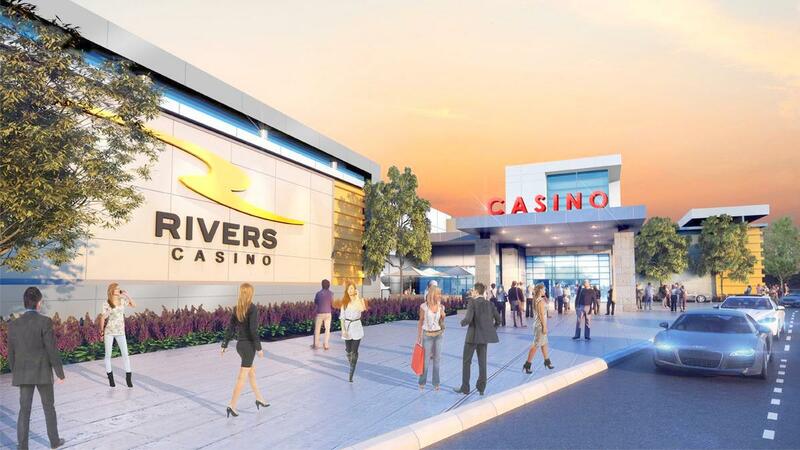 In the 10 days leading up to next Wednesday’s Planning Commission meeting, we urge casino developers to post more renderings of the new redesign online and share them with the community. . . . The more information the people have about the project, the more transparency government affords them, the more likely it is that they will accept it. That should be the goal of the developers, and most importantly, the city’s government. 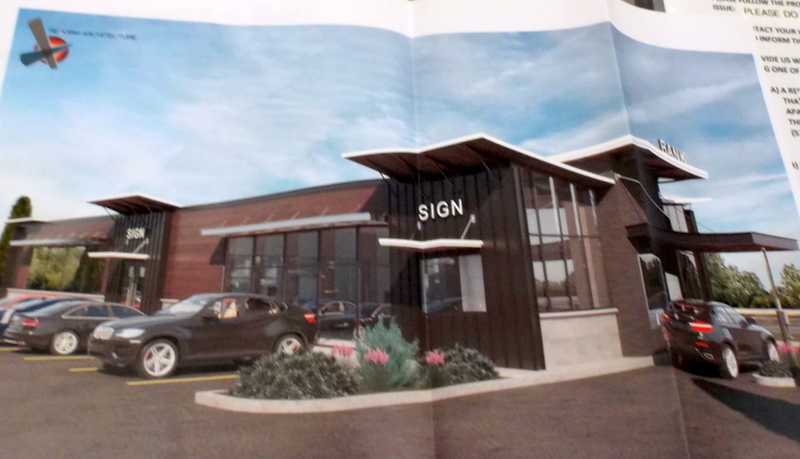 “The façade of the casino has shifted from an industrial look with brown bricks to a more contemporary look with white-gray coloring and metal panels. 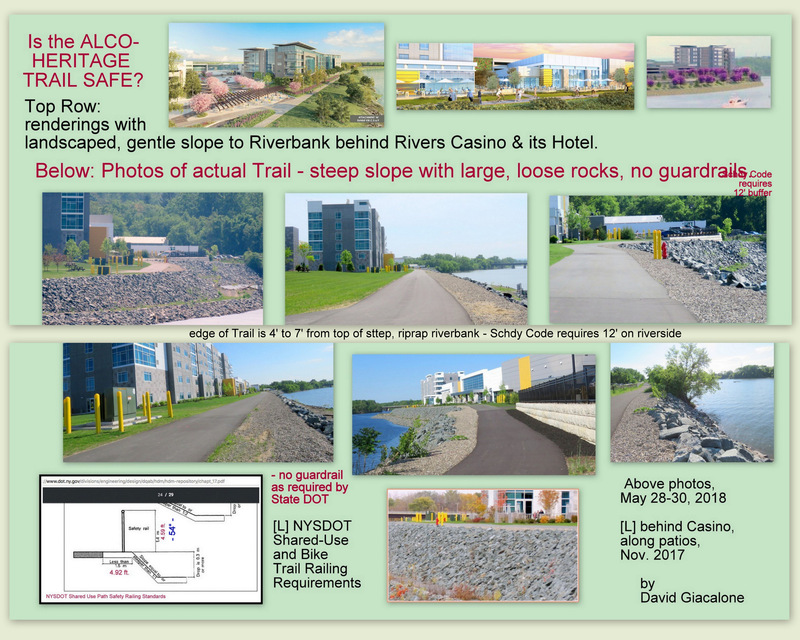 The approval was, indeed, done in the guise of the Commission approving the final signage plan for the Casino, which was primarily publicized for no longer including an 80′ pylon structure and reducing the overall signage on the casino and its hotel. 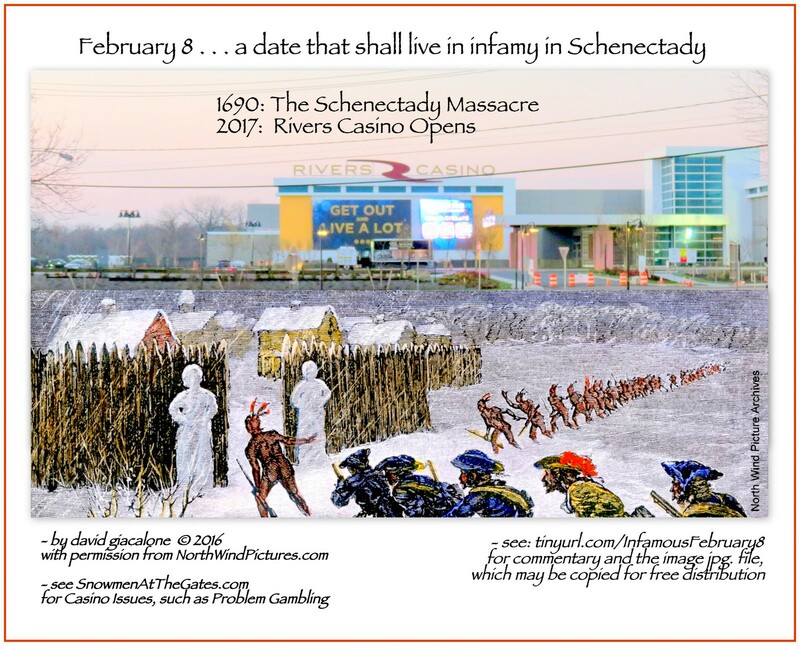 There was no mention of the drastically altered entryway wall, which jettisons the 3rd design’s “more contemporary look with white-gray coloring and metal panels.” In actuality, the large LCD screens that were going to be placed on the pylon sign, were basically affixed to the entry façade of the Schenectady casino. 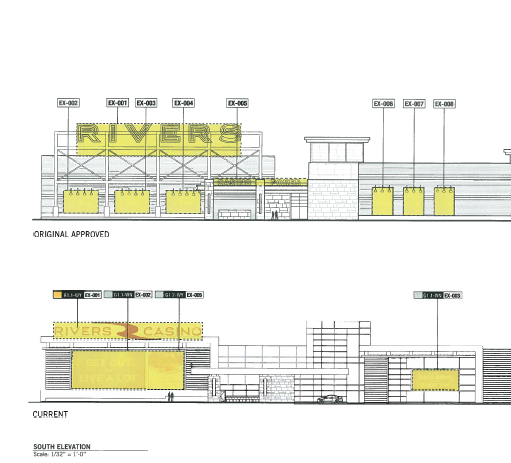 And, no, there were no renderings of the Casino’s new look. 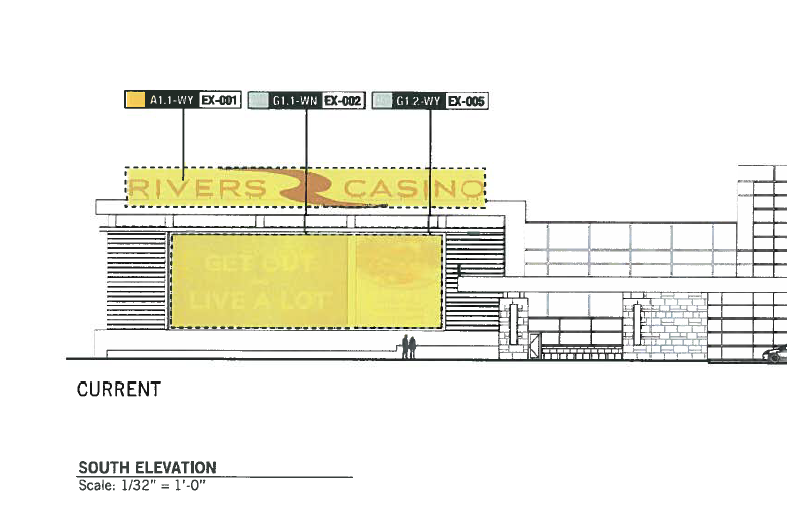 Thus, in April 2016, the only image the Commissioners were shown of the portion of the Casino’s front entryway that had been presented as its 3rd design and approved in July 2015 was the sketch shown to the right of this paragraph. 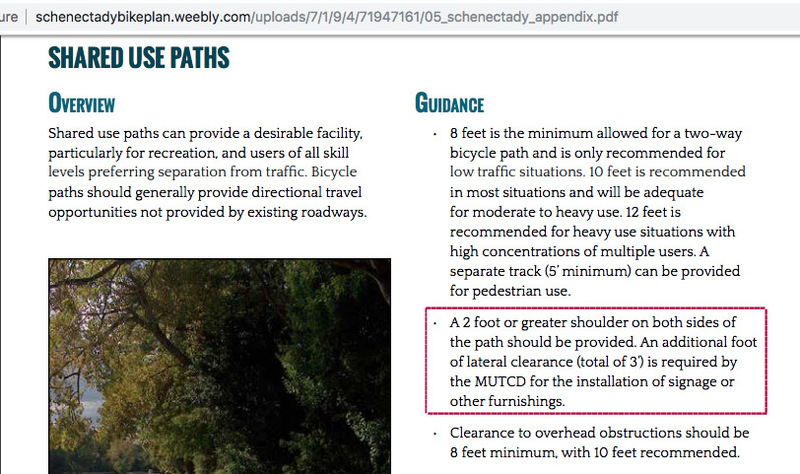 It comprised about a quarter of page six of a 7-page document titled Signage and Wayfaring Program. [Click here to see the entire page.] And, neither the Planning Commission staff nor the Chair of the Commission demanded a fuller depiction, which they clearly had the authority to do prior to putting the matter on the Commission’s agenda. 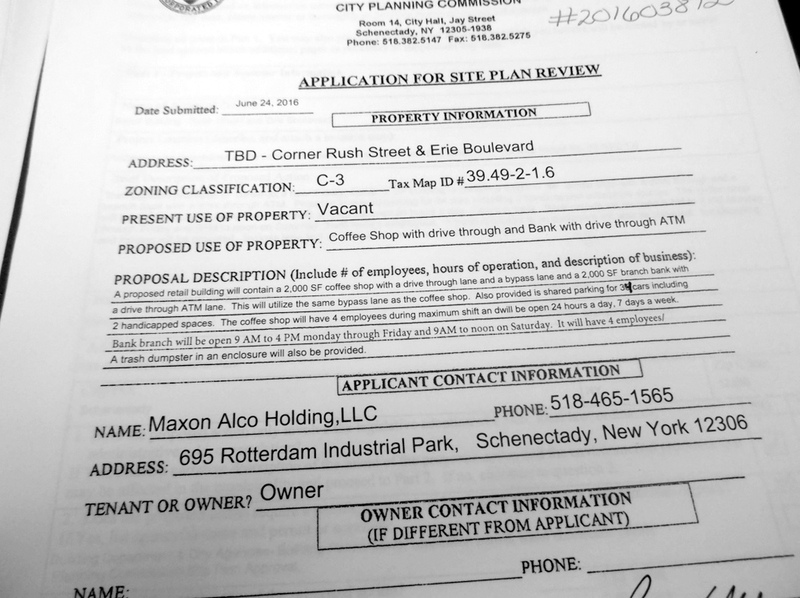 Because the Planning Commission does not post submitted documents along with its online Agenda notice to the public, and Rush Street did not share its submission with the public or media, others would have seen that minimalist sketch only if they made a trip to the Planning Office and asked to view the file, or if they somehow knew they could request that the document be emailed to them. 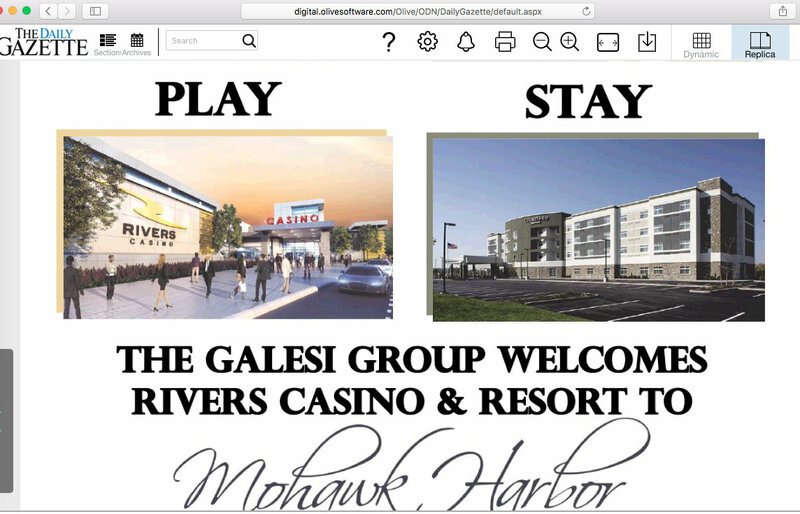 Likewise, Galesi Group used the 3rd design in the ad it took out welcoming Rivers Casino, in the Gazette’s January 31, 2017 advertising supplement, The Road to Rivers. 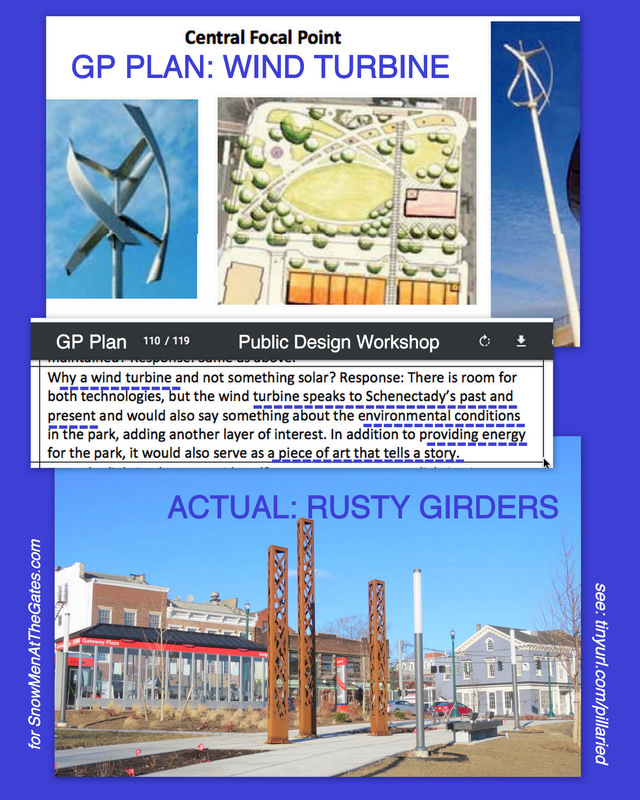 click to view.
. . . Maybe we’re supposed to be grateful for any design at all. 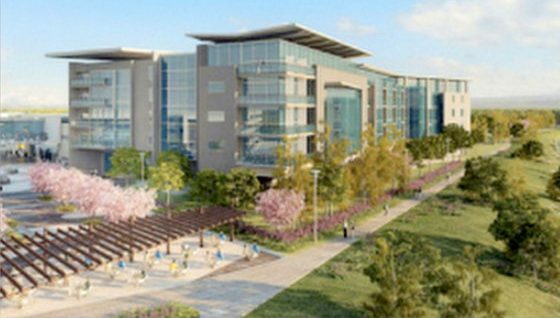 Certainly, anything they build will look better than the existing giant empty lot, for decades littered with piles of construction debris, steel girders and weed-covered clumps of dirt. But we weren’t promised just anything. We were promised a spectacle. 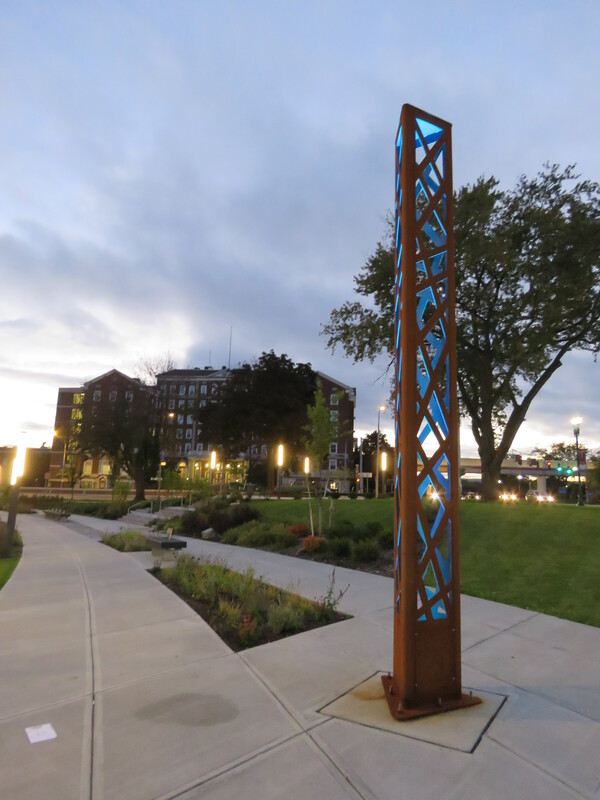 And this design is a fizzled firework. . . .
As we emphasized in our posting,“why does Schenectady get Rush Street’s scraps?” (June 19, 2015), Rush Street Gaming clearly knows how to produce an attractive, even spectacular, design. 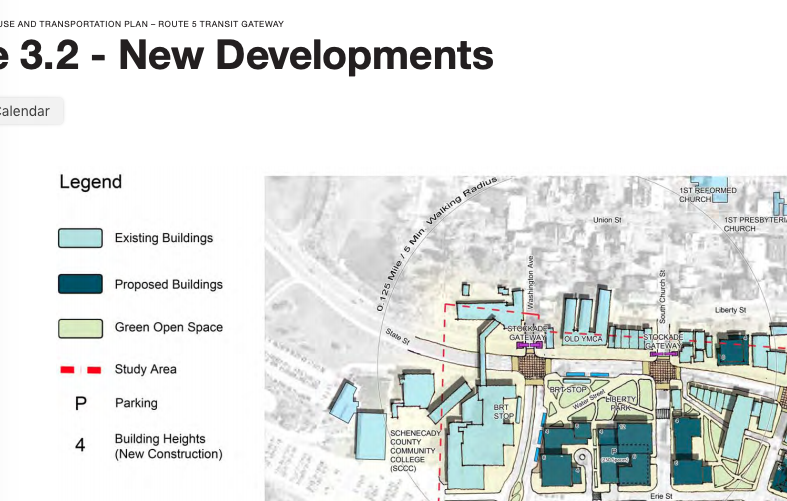 We got much less, it seems, because our Mayor and zoning/planners officials failed to demand a quality design. 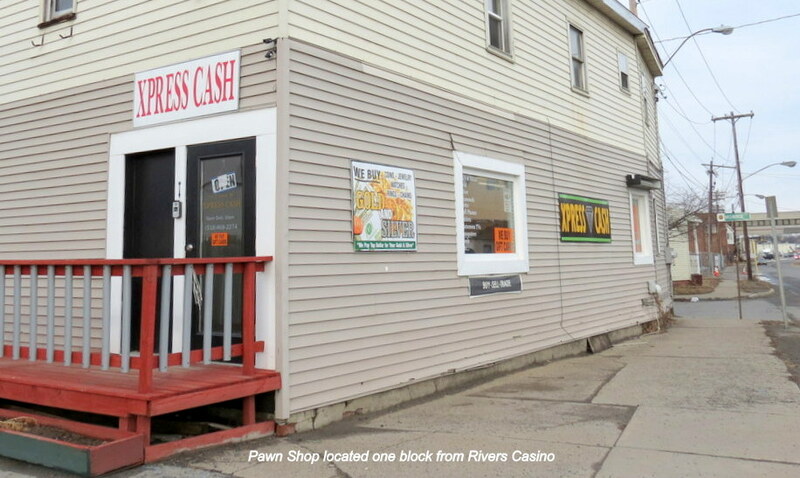 How will our homely casino exterior affect its bottom line, and thus the tax revenues generated by it? We will have to wait and see. 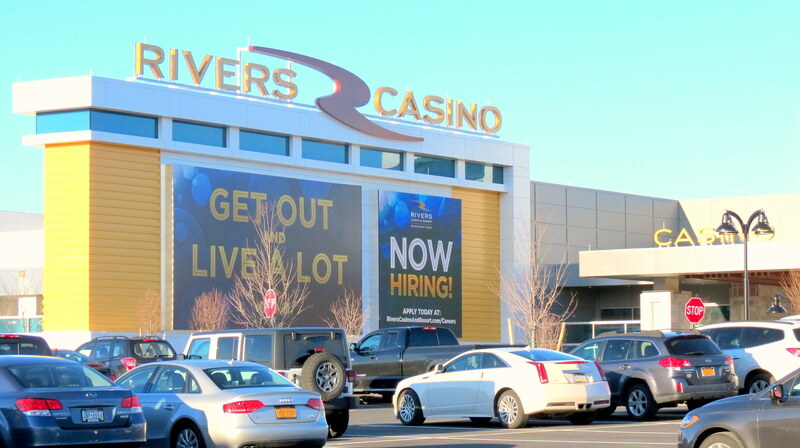 Our posting last month, “casino choices in upstate New York: who will choose Schenectady?” is not optimistic that we can successfully attract people from outside a very small geographic area, given the many other casinos that actually try to look like a tourist destination. 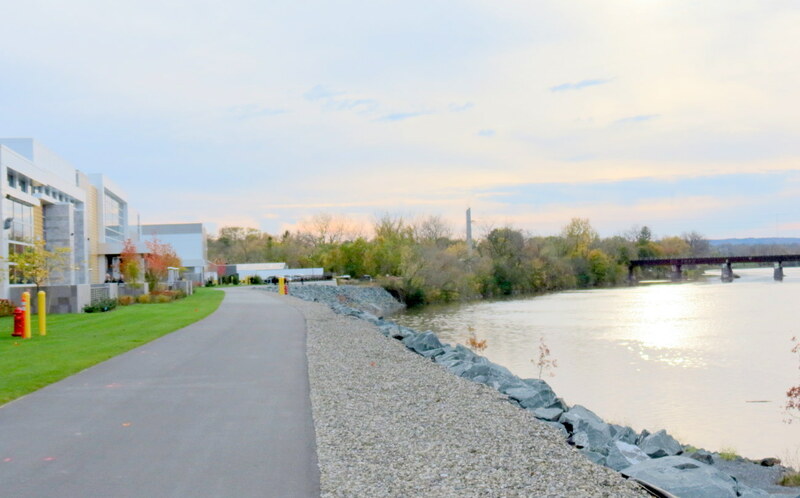 How did we get stuck with this unattractive casino in Schenectady? The reader can decide for herself or himself how or why it happened. 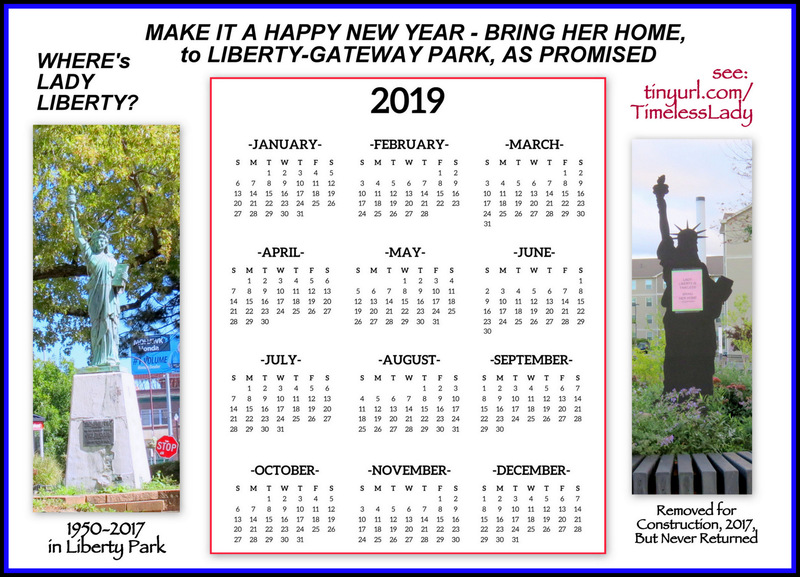 We believe City officials more interested in pleasing or appeasing the developer and casino owner, and their button-man, Mayor McCarthy, failed to do their jobs, and have diminished themselves and our City. 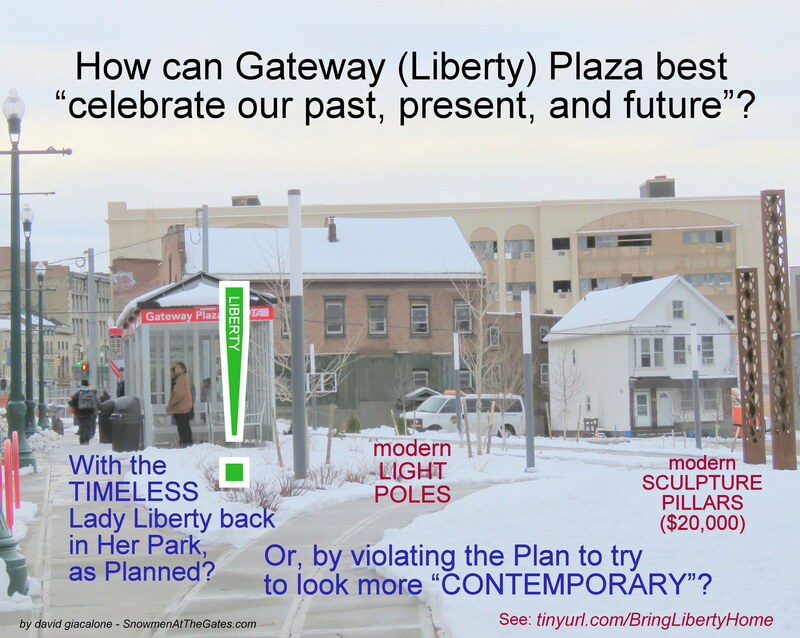 For more Rush Street bait-n-switch, click here, concerning the giant pylon sign. 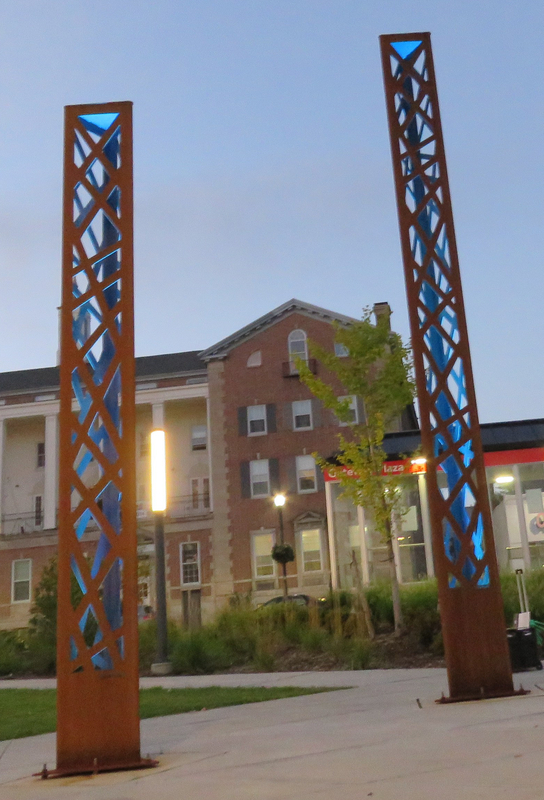 Their response to worries about the pylon colors and garishness was, it now seems, to move those elements to the façade of the casino building itself. 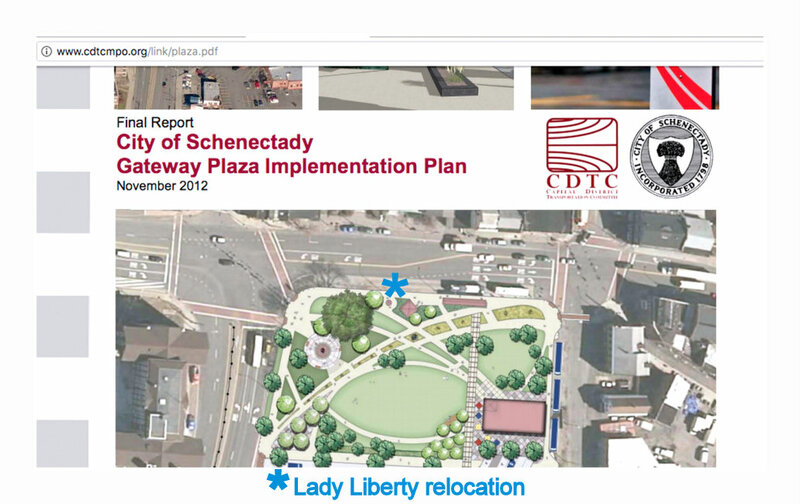 Just another thumb in the eye of the Planning Commission, City of Schenectady, and its residents. . . 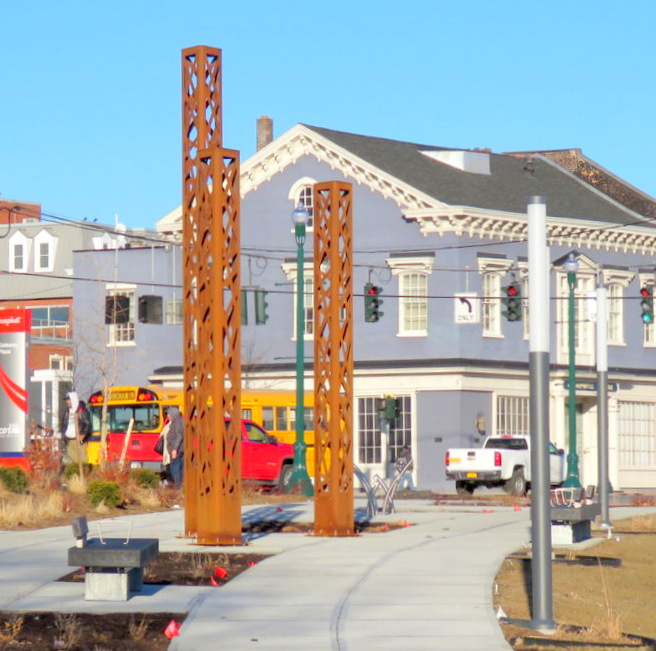 The much-touted Renaissance of Downtown Schenectady has not exactly reached Erie Blvd. near the Casino. .